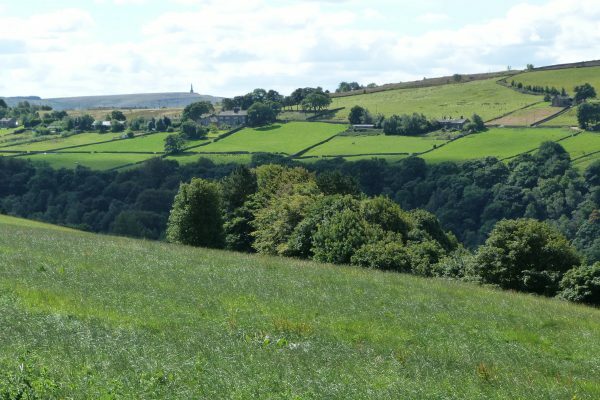 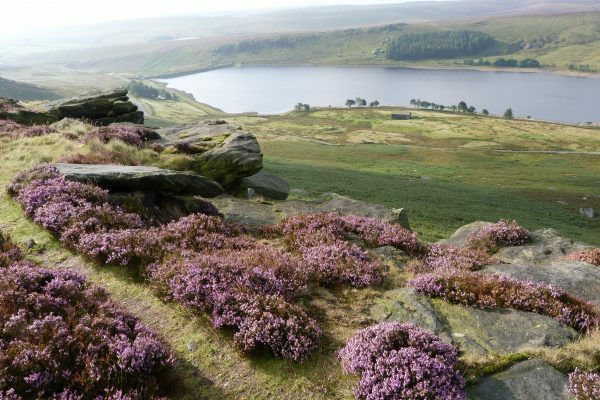 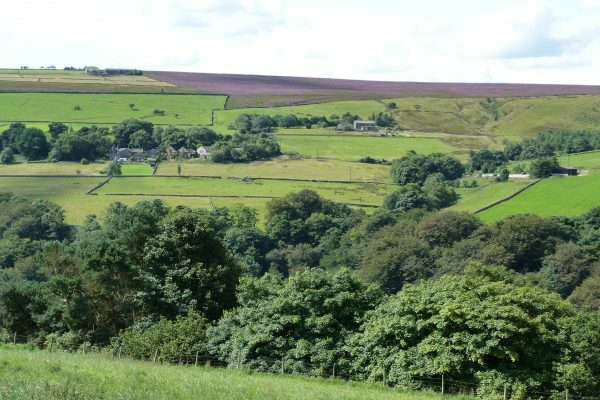 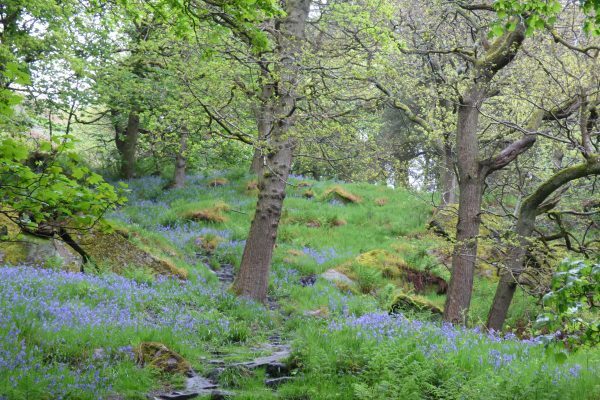 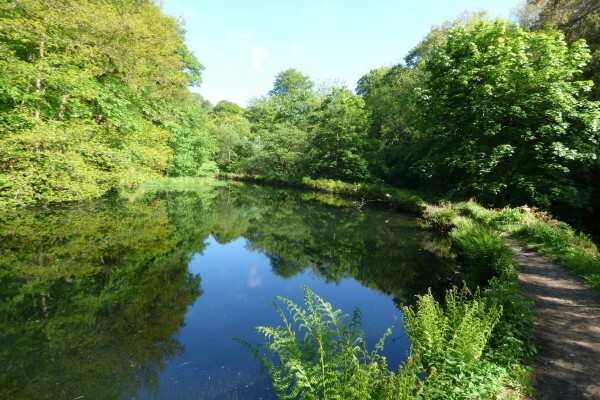 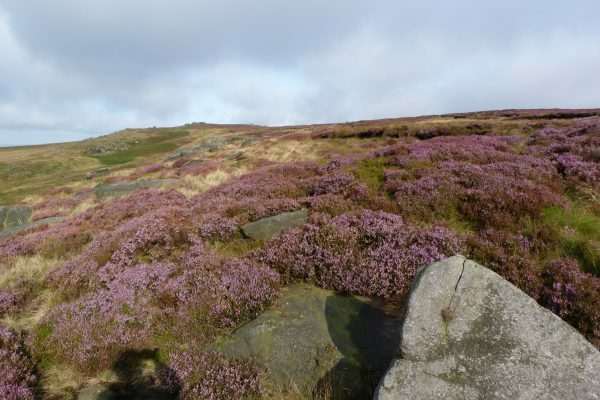 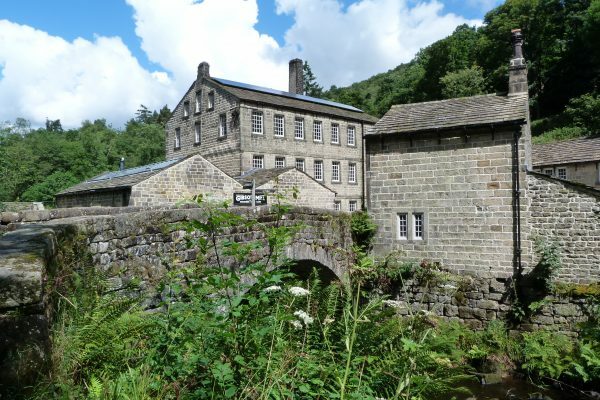 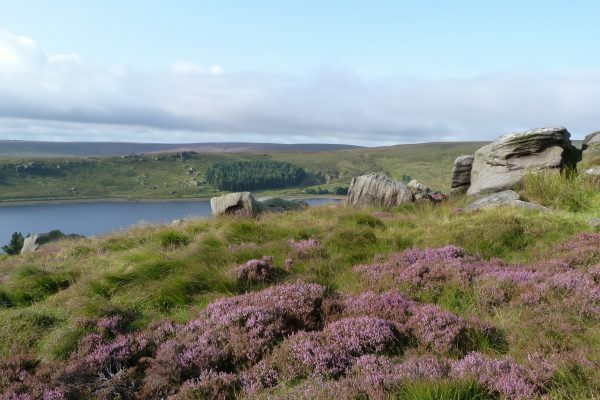 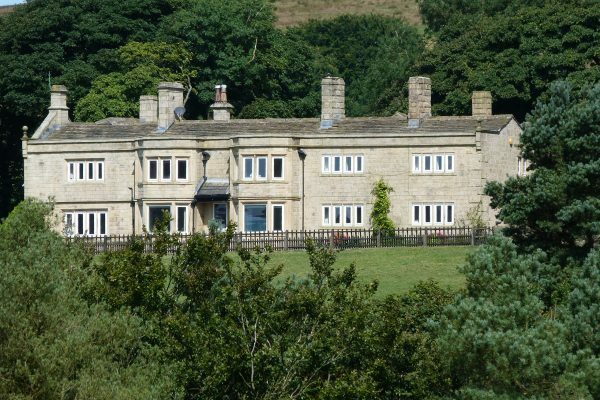 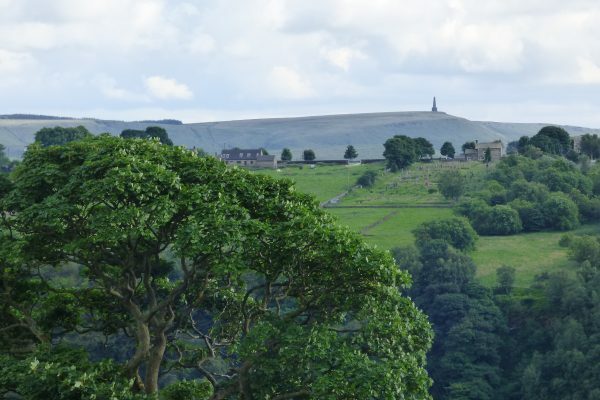 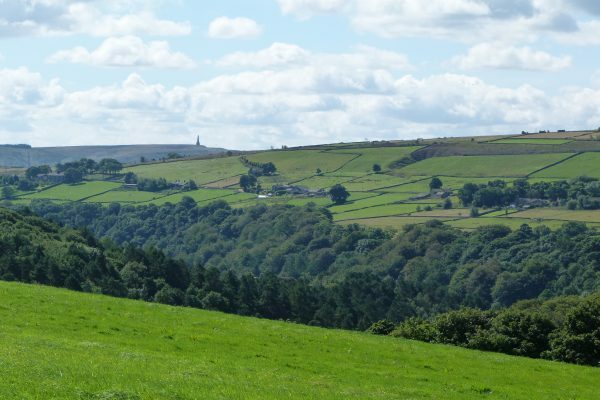 The idyllic National Trust estate of Hardcastle Crags near Hebden Bridge is not to be missed. 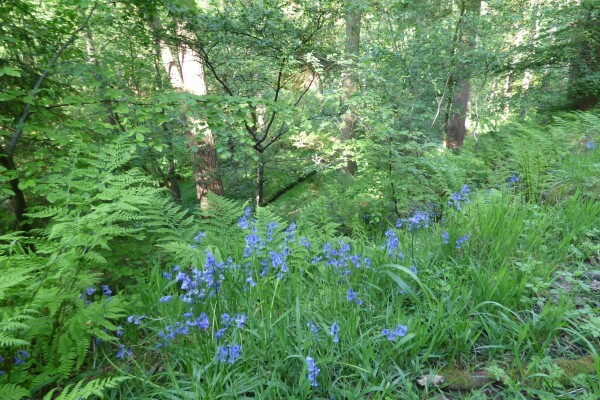 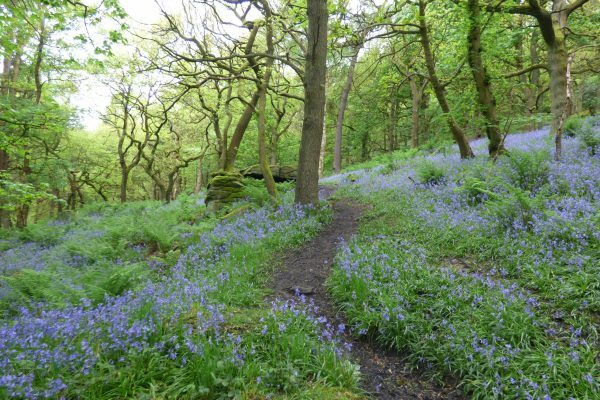 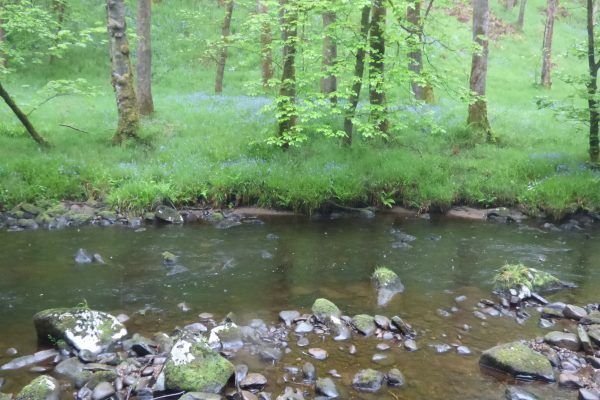 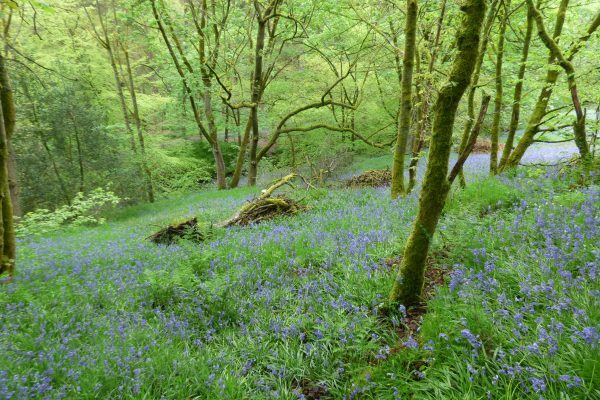 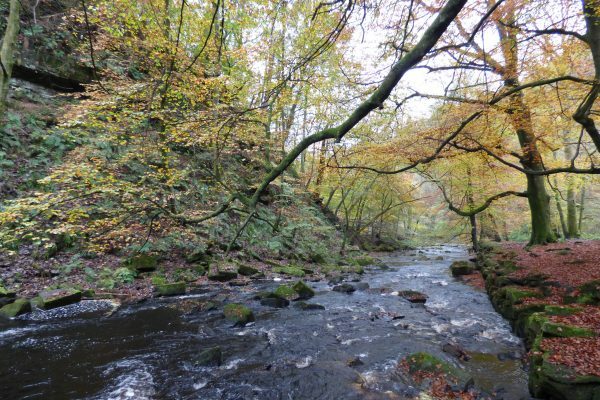 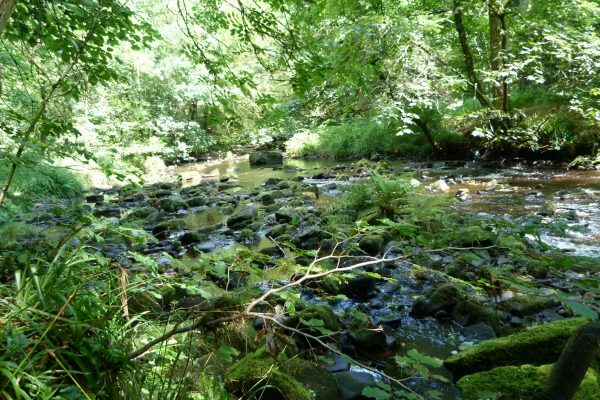 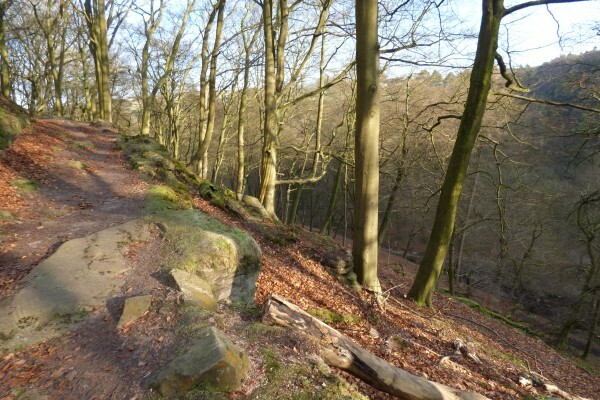 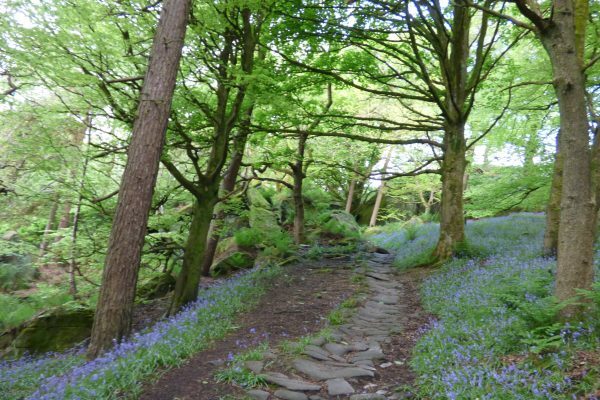 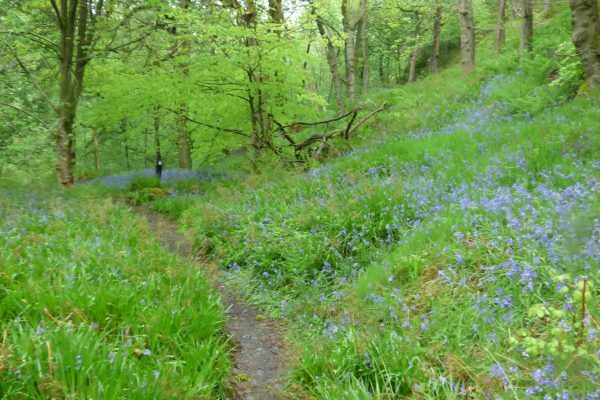 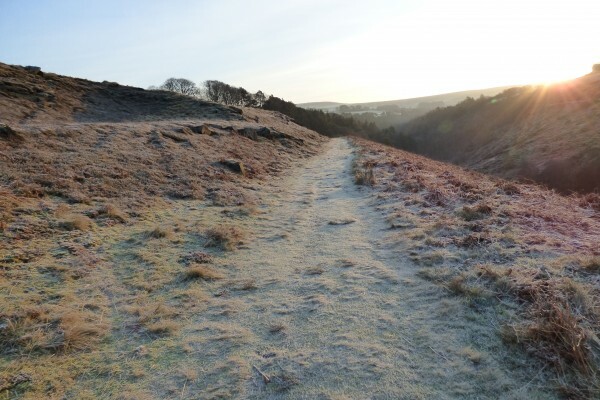 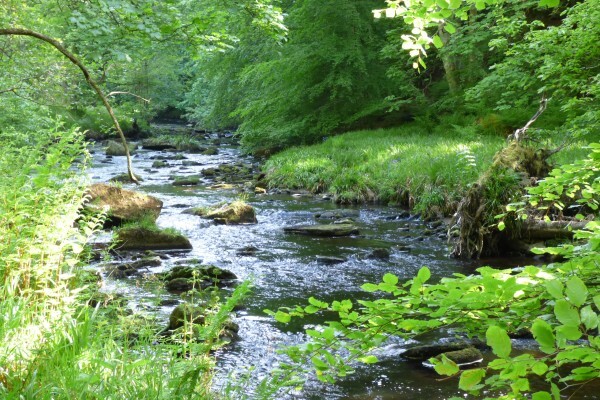 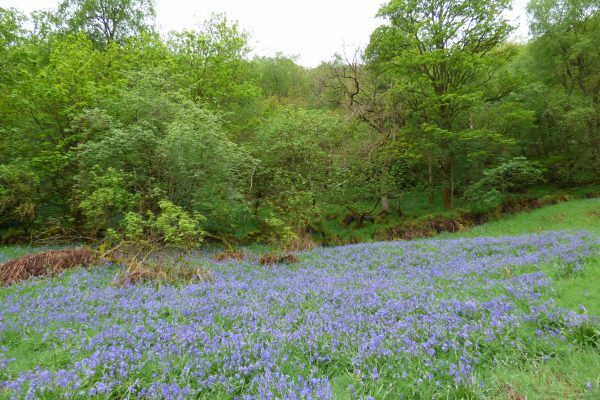 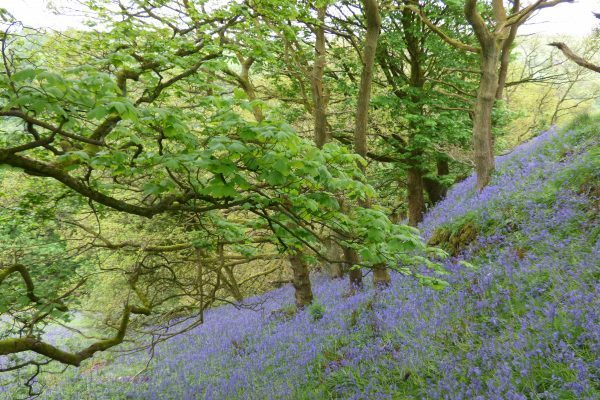 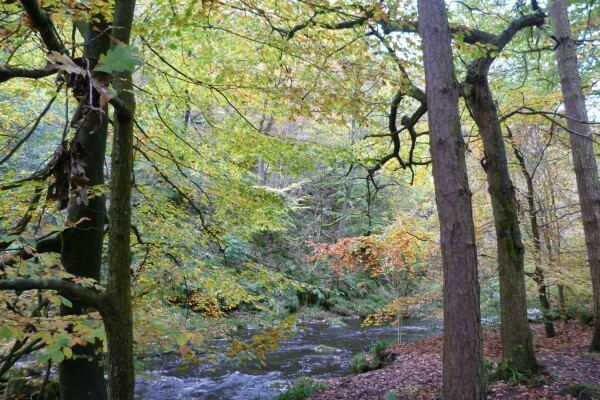 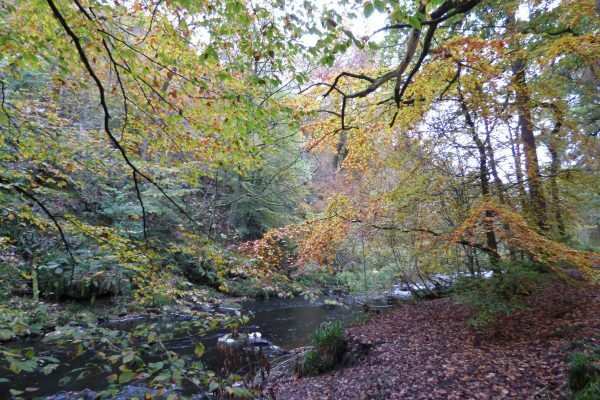 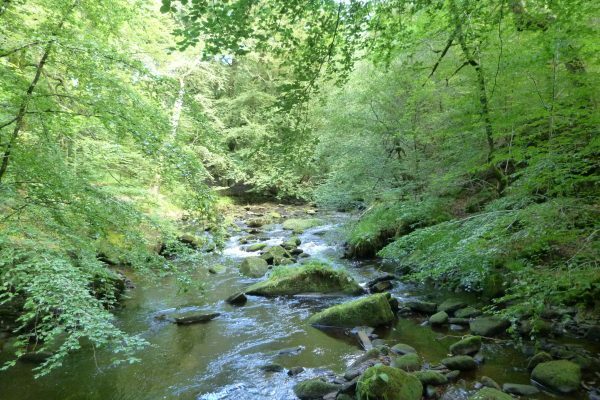 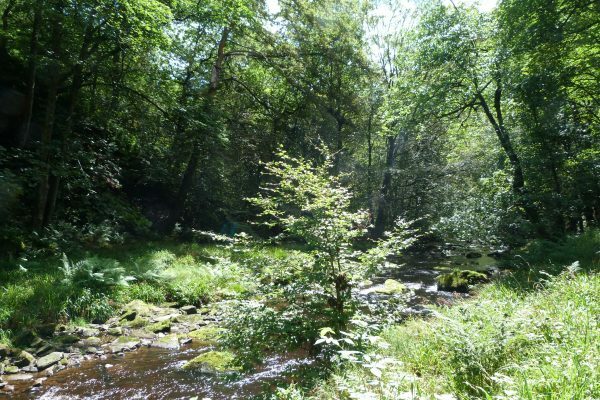 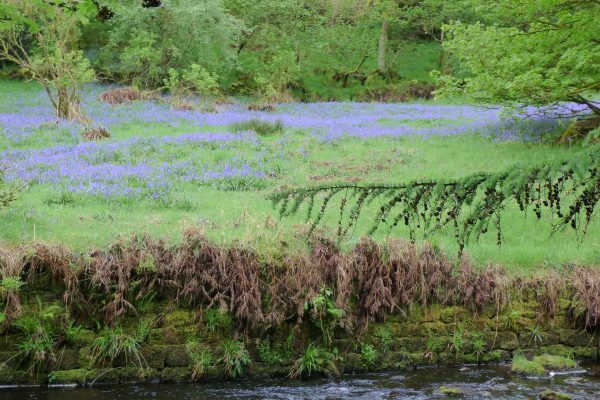 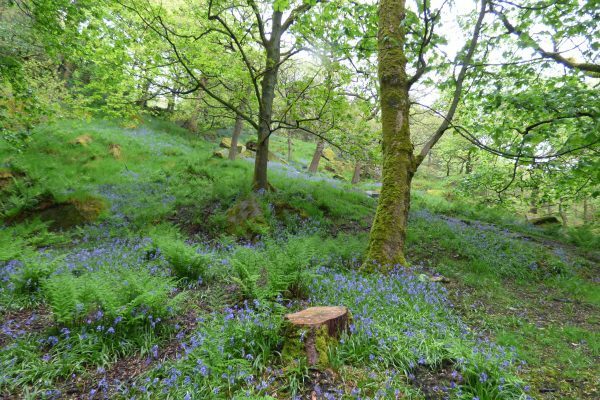 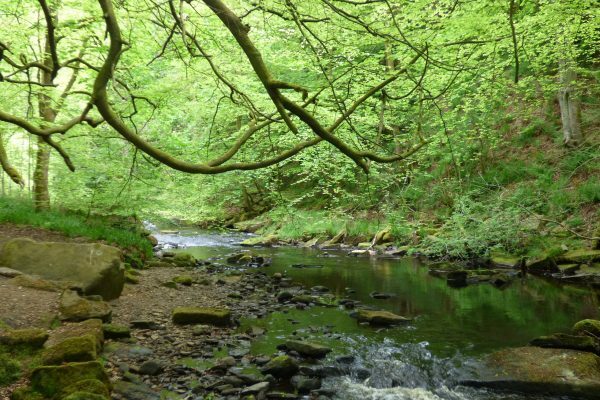 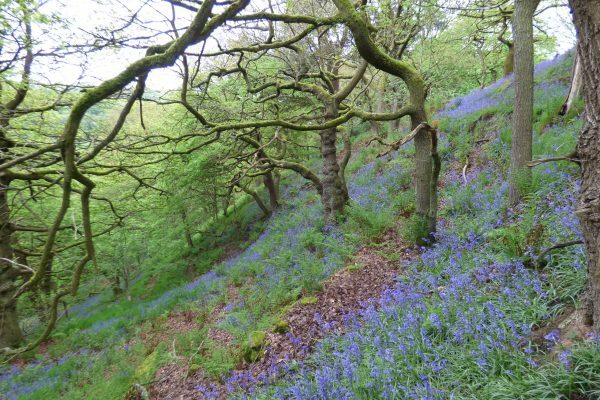 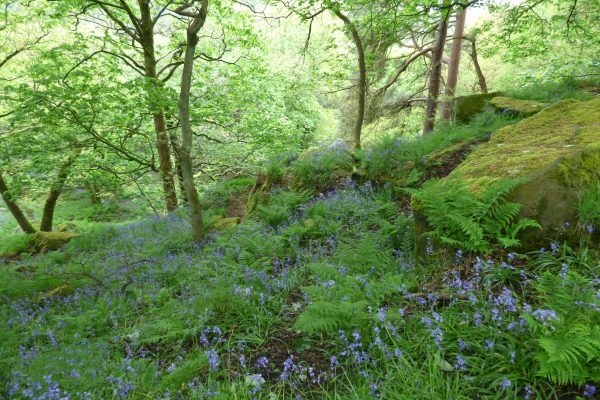 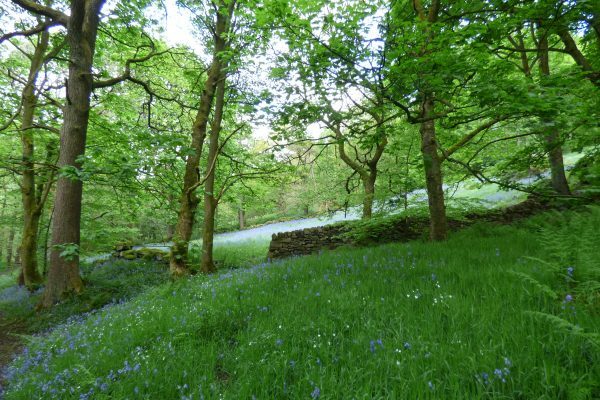 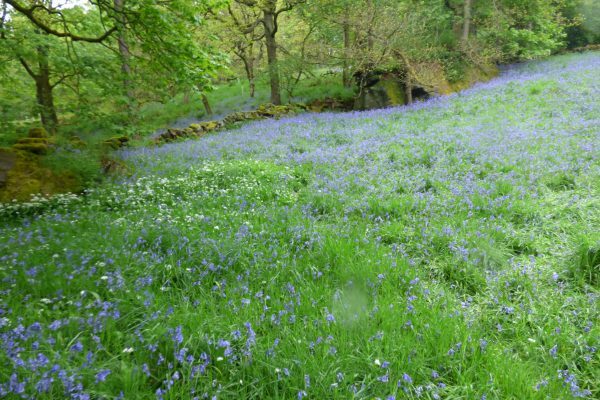 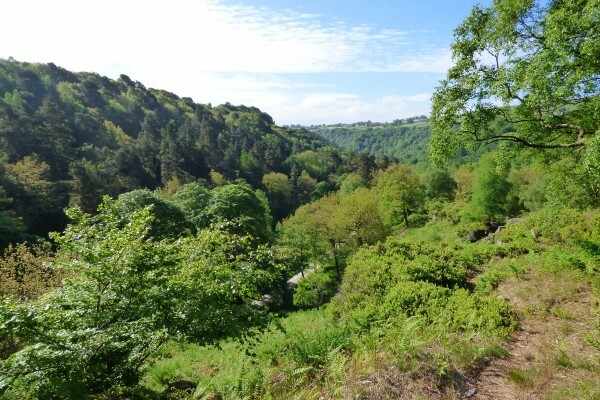 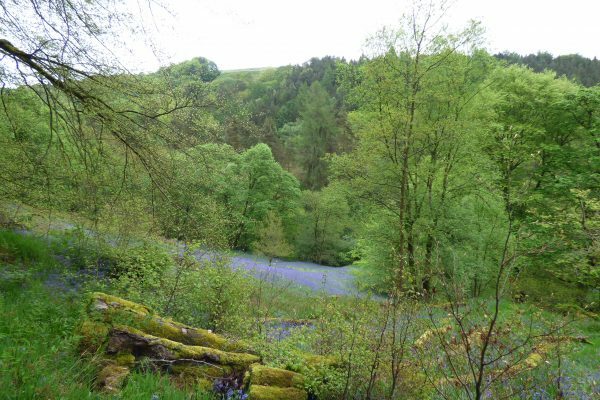 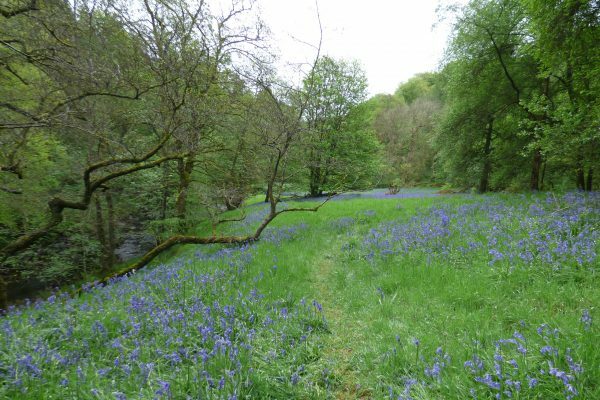 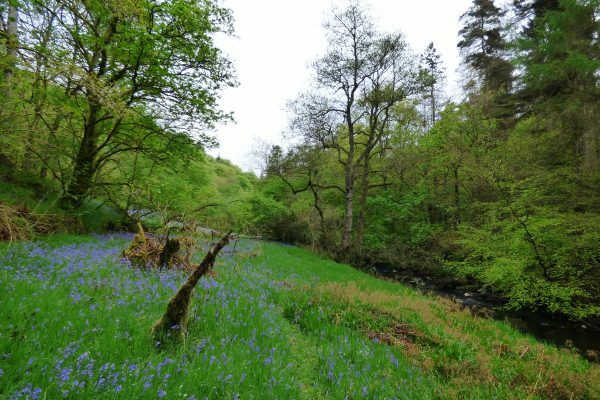 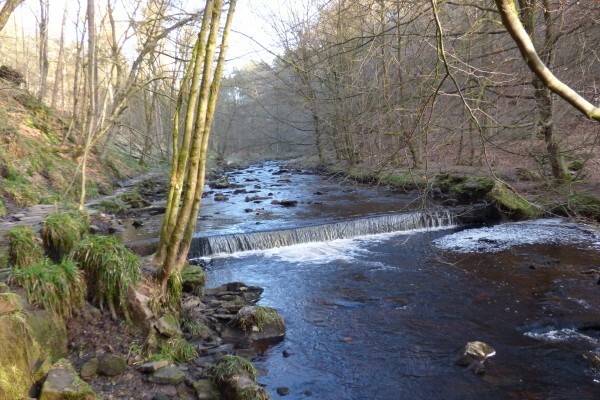 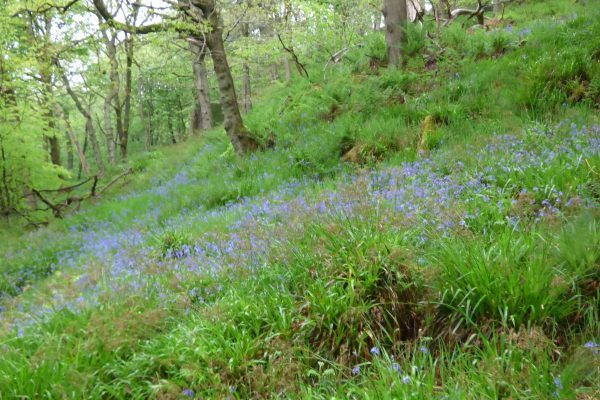 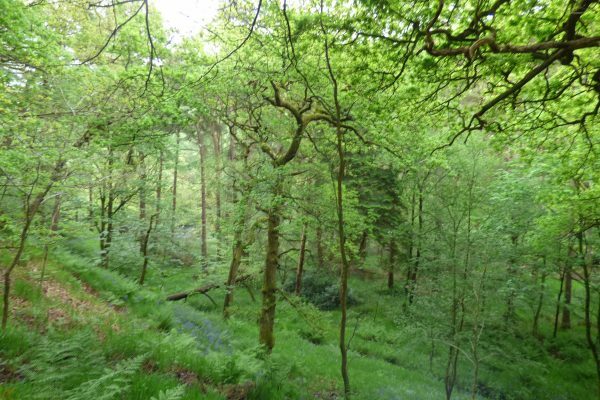 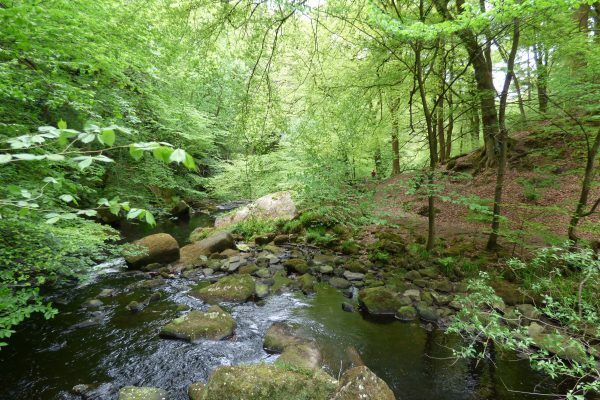 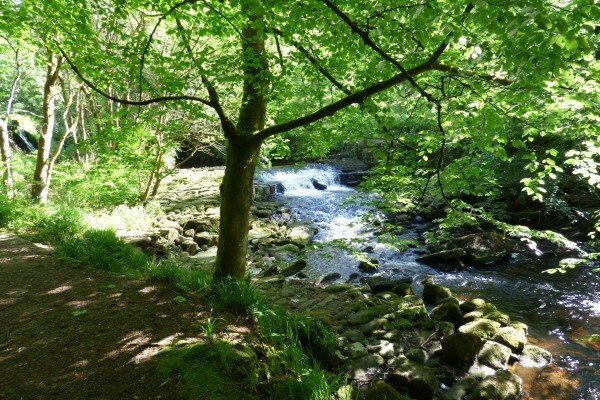 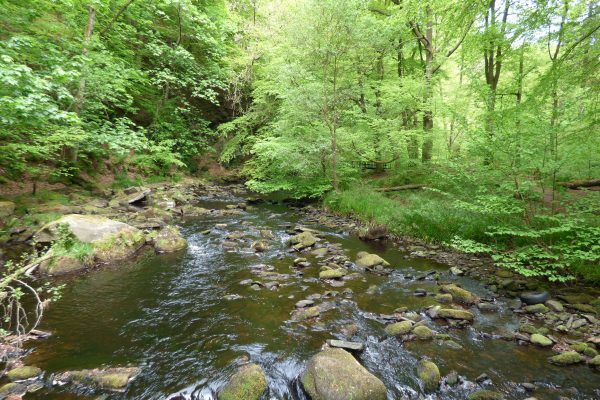 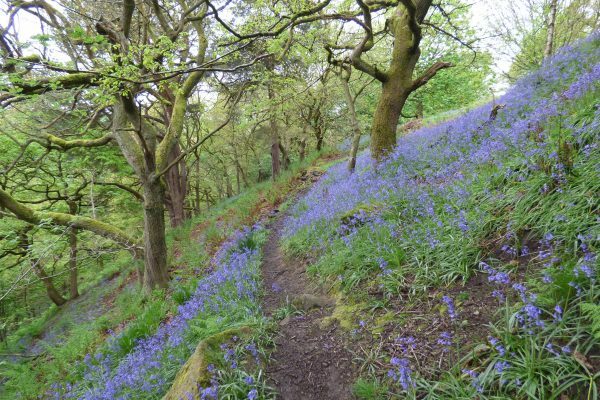 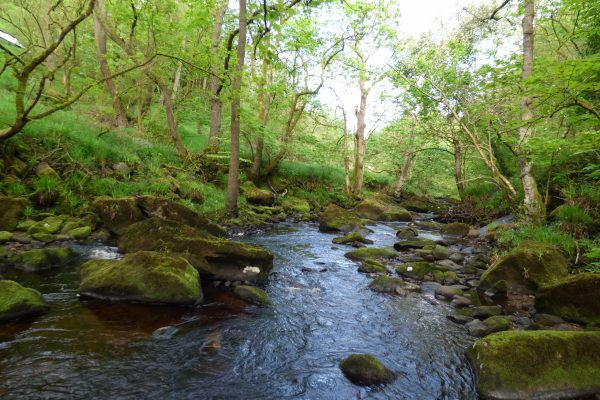 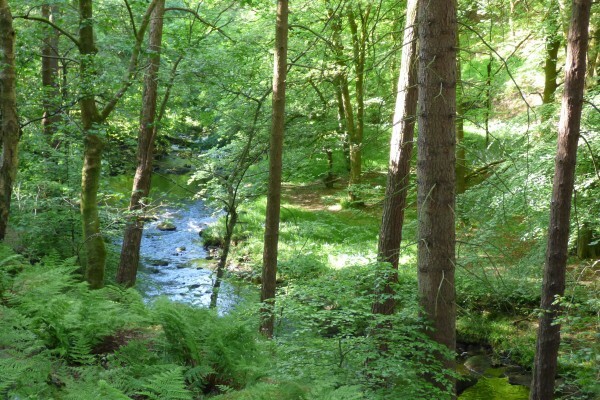 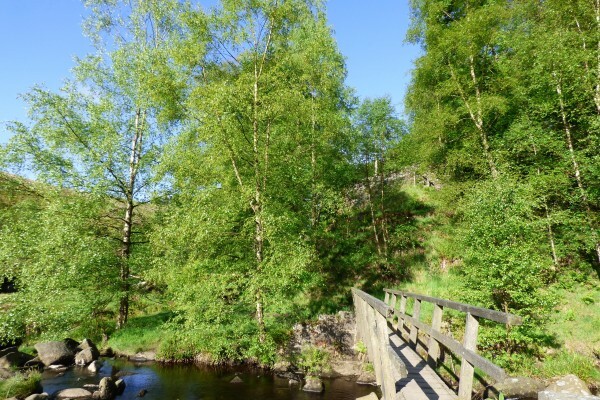 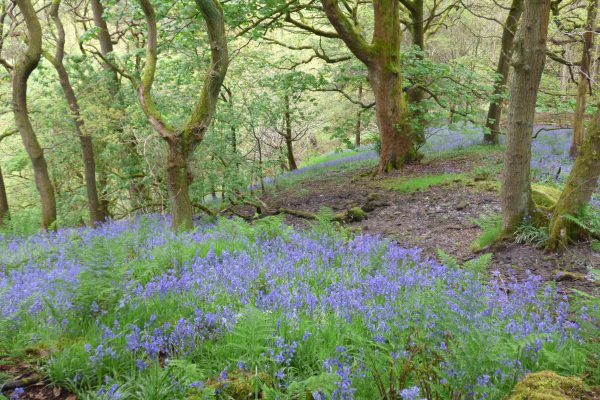 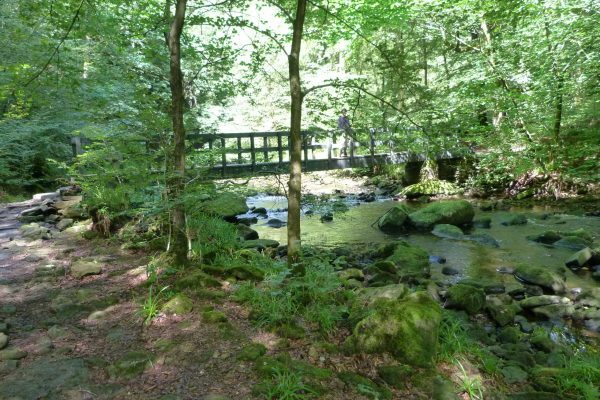 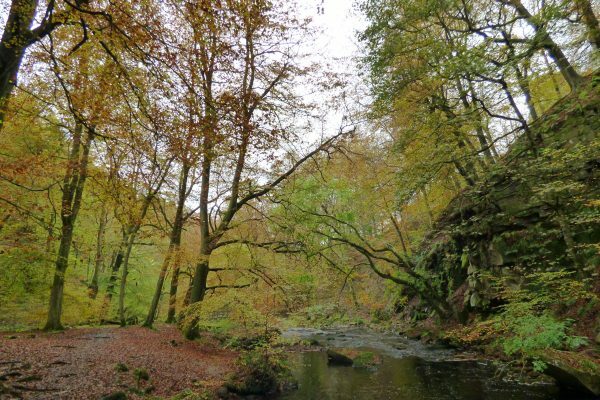 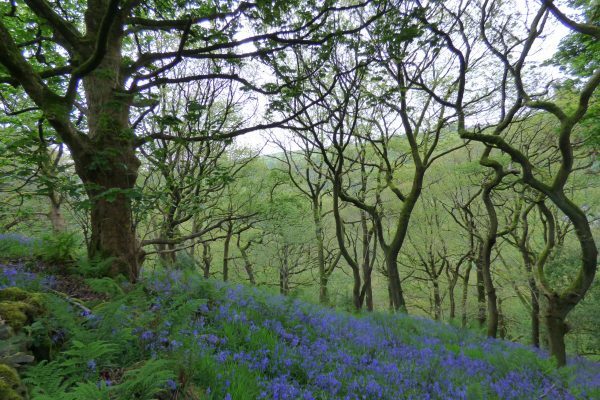 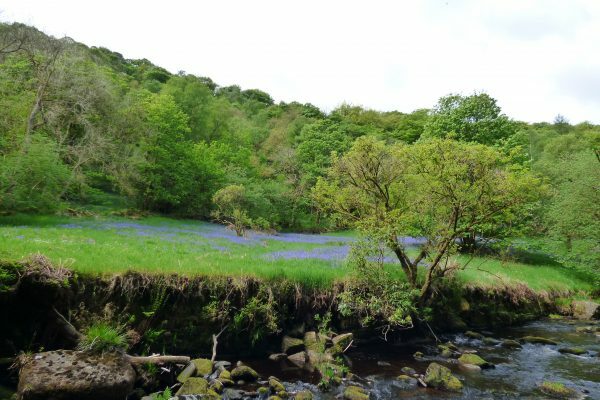 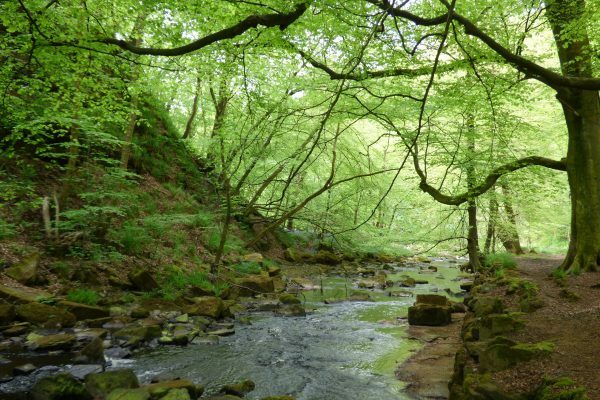 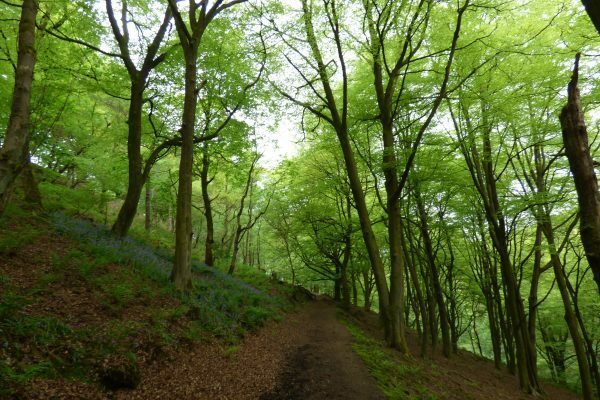 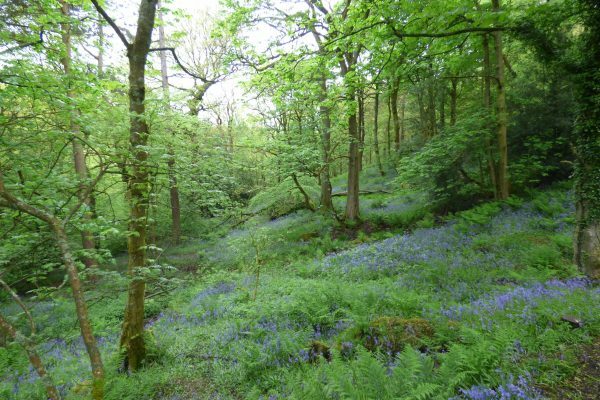 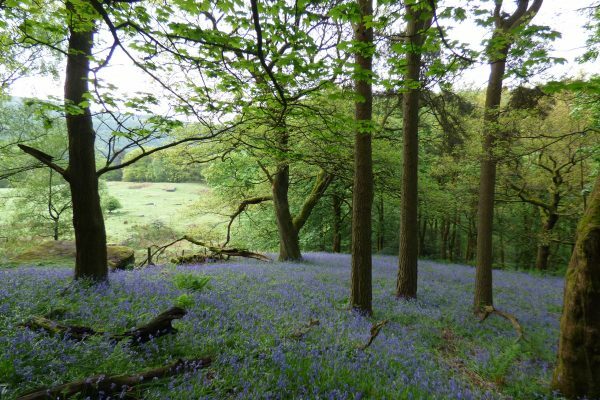 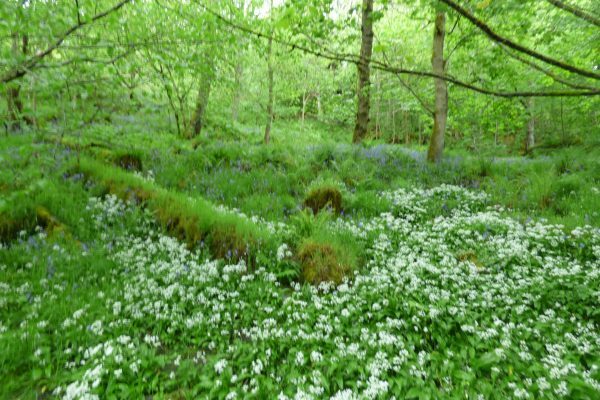 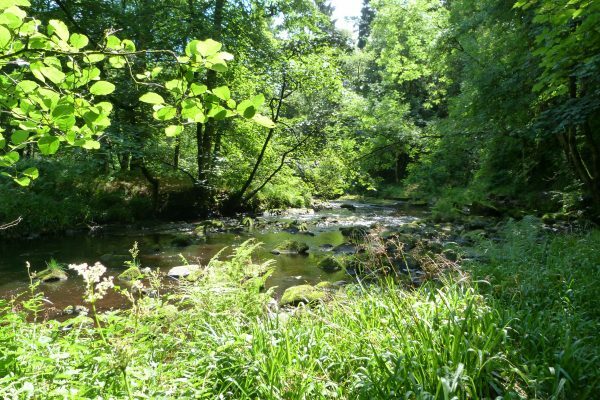 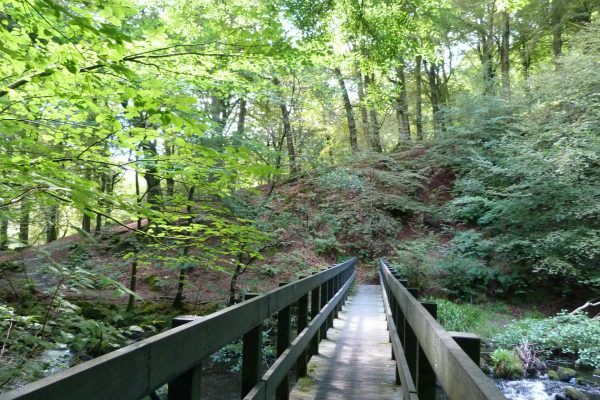 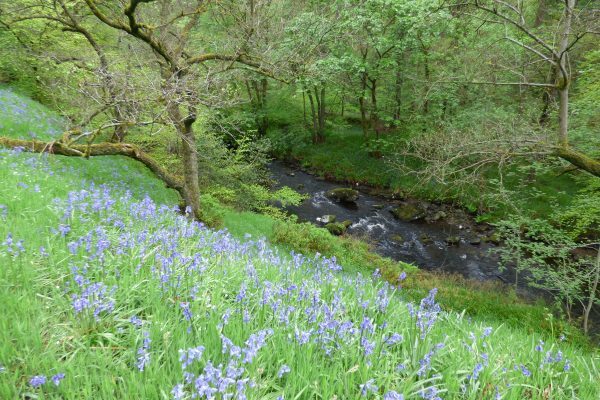 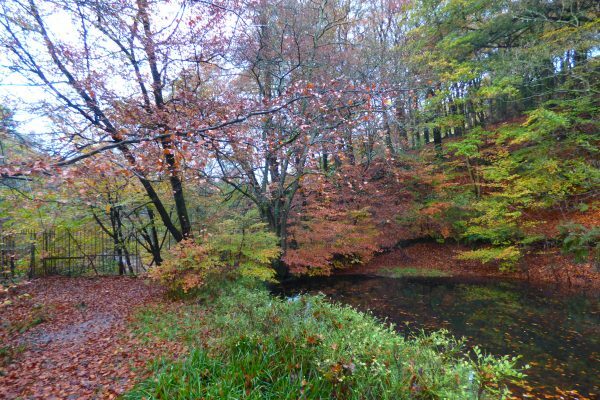 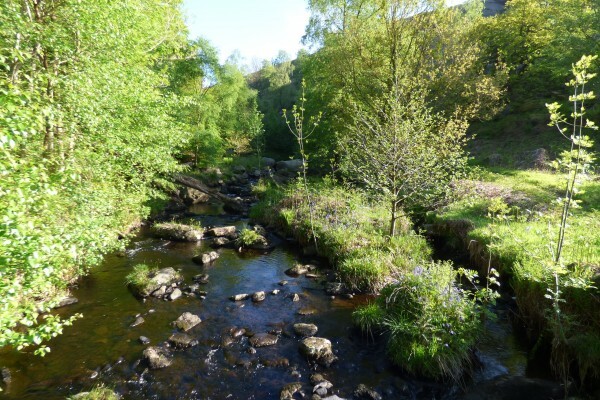 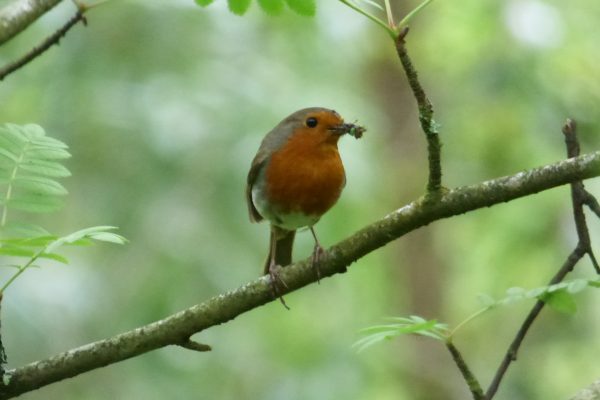 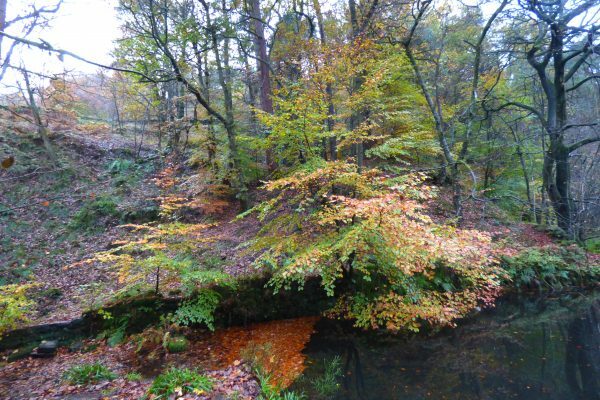 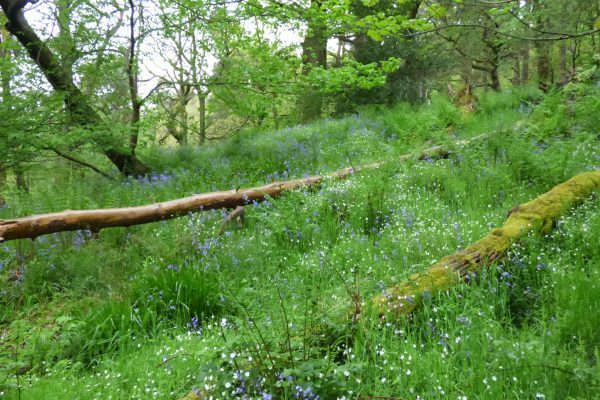 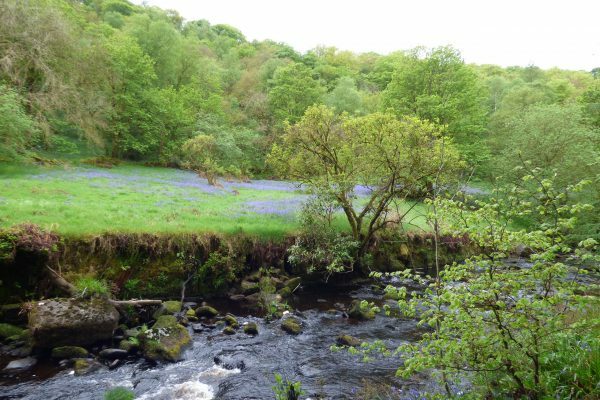 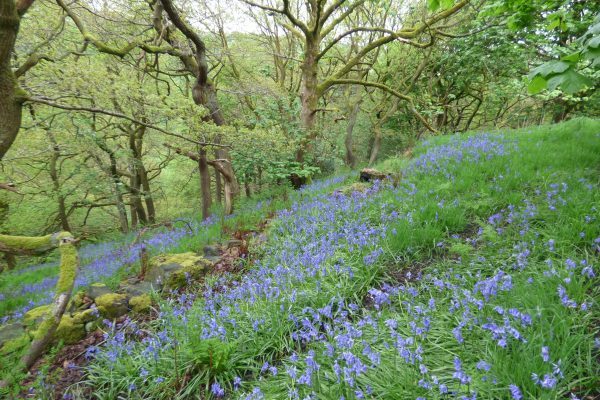 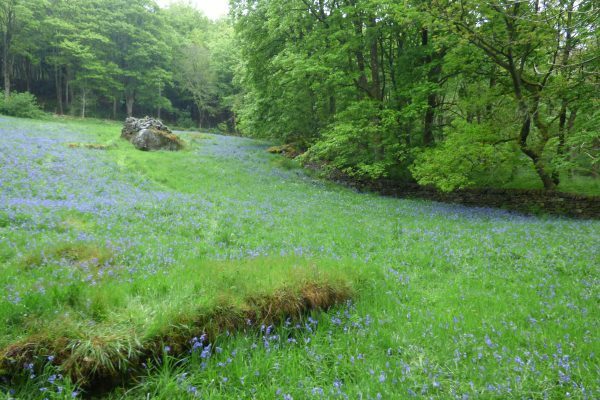 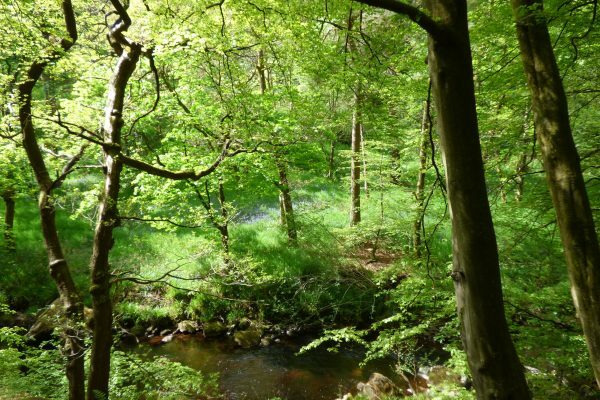 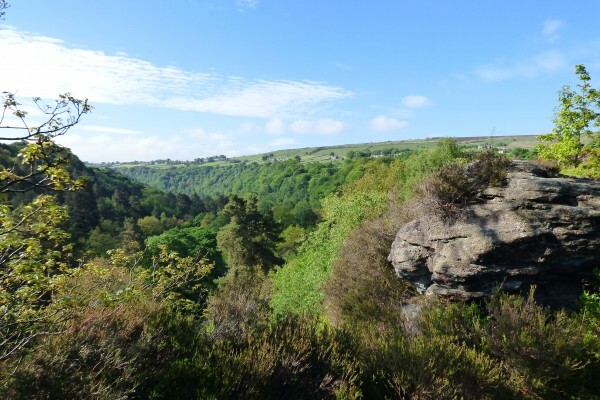 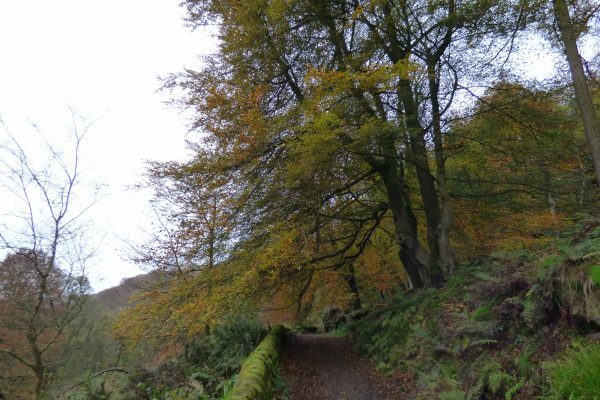 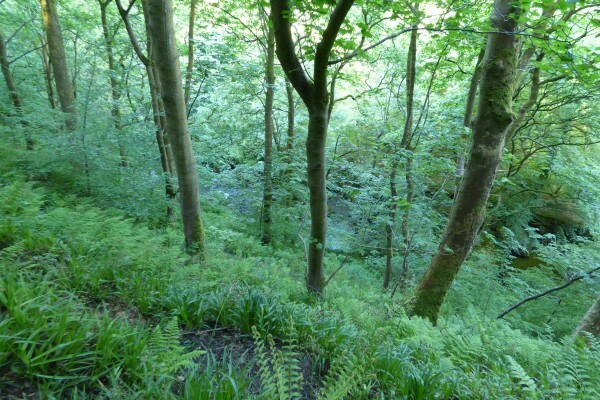 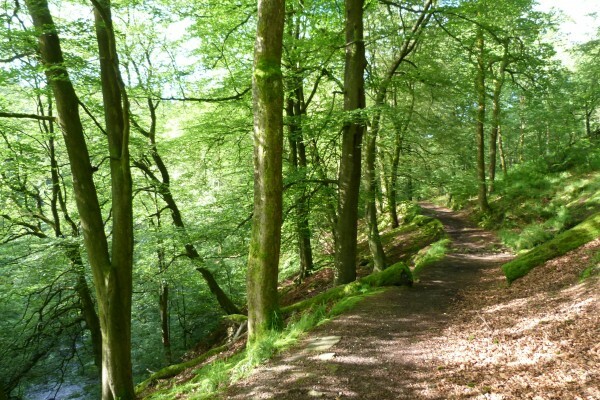 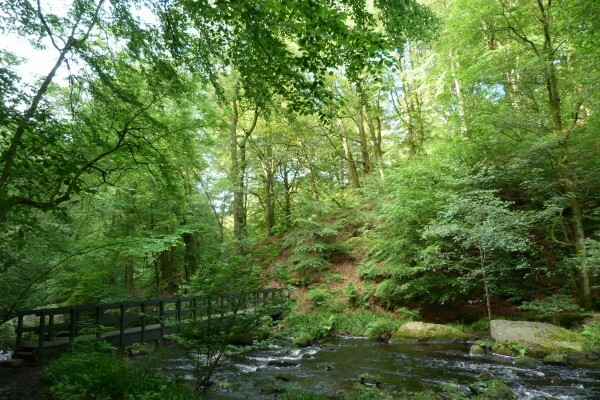 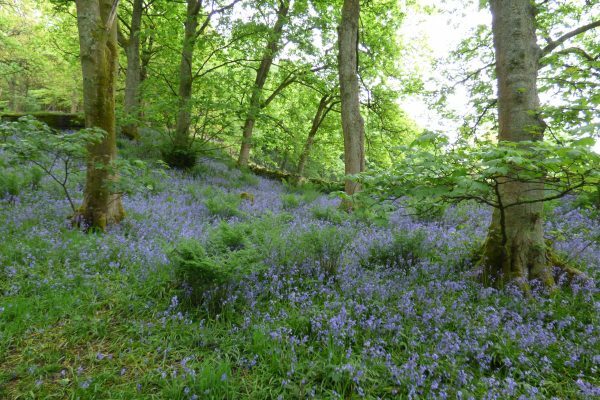 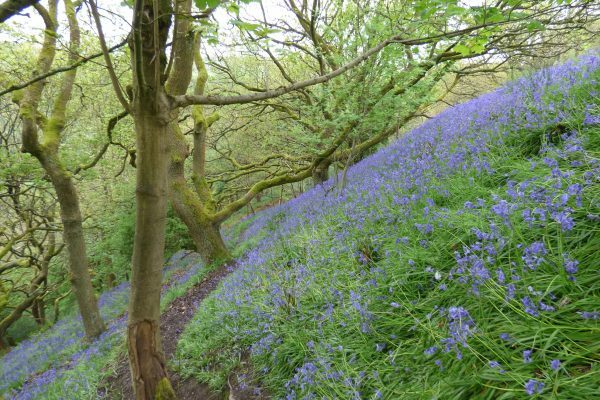 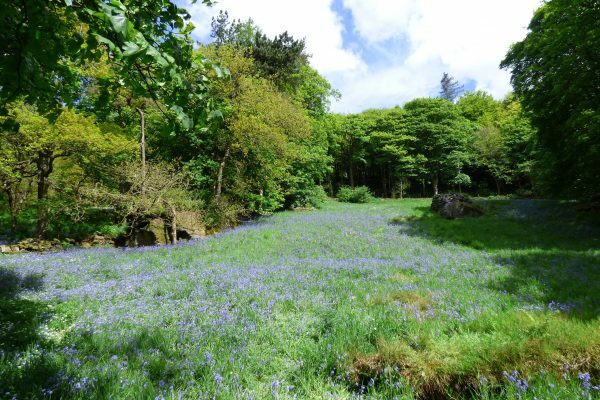 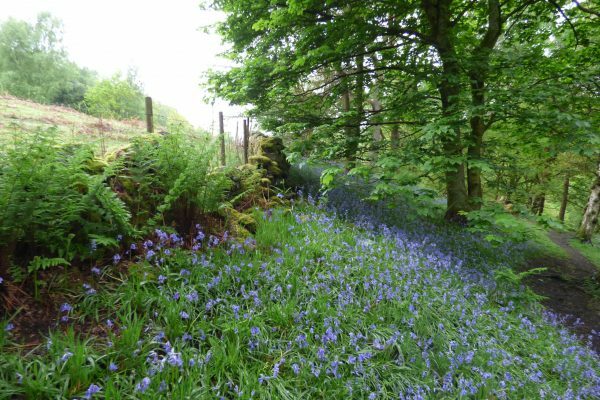 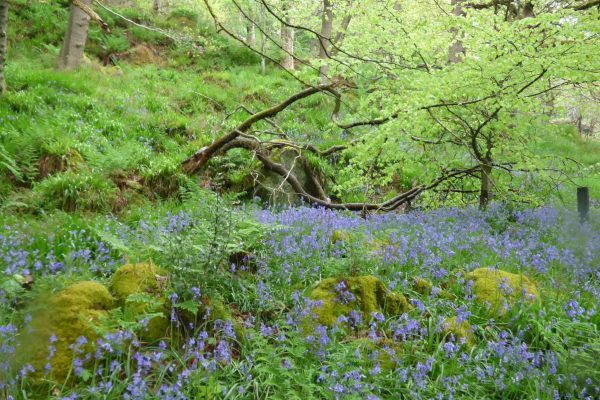 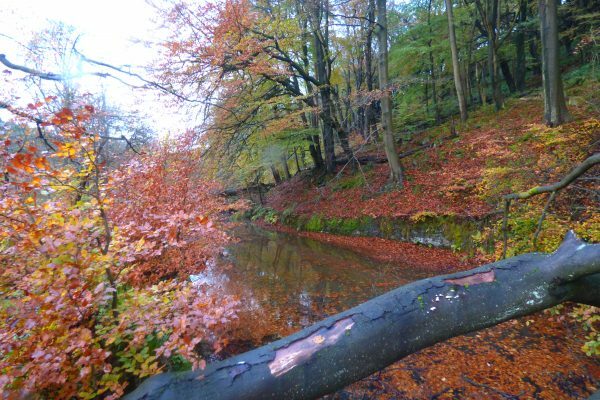 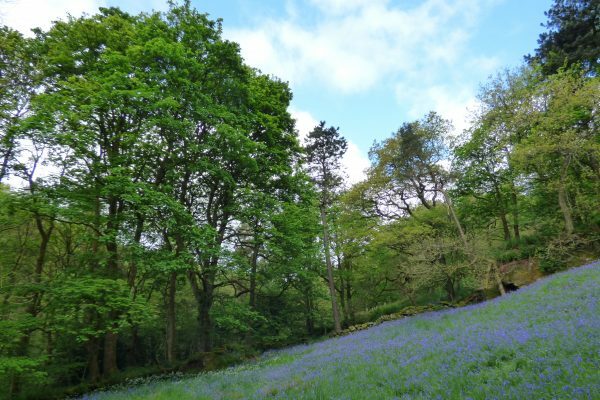 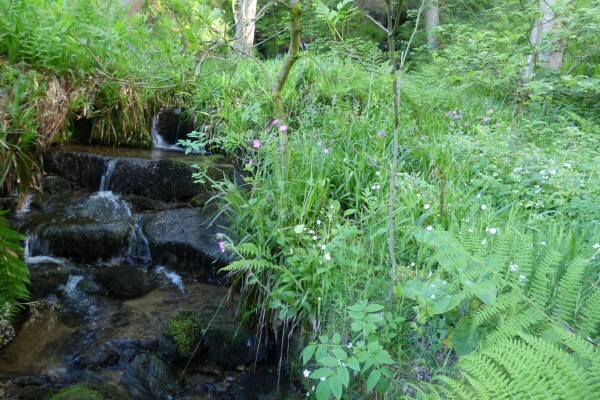 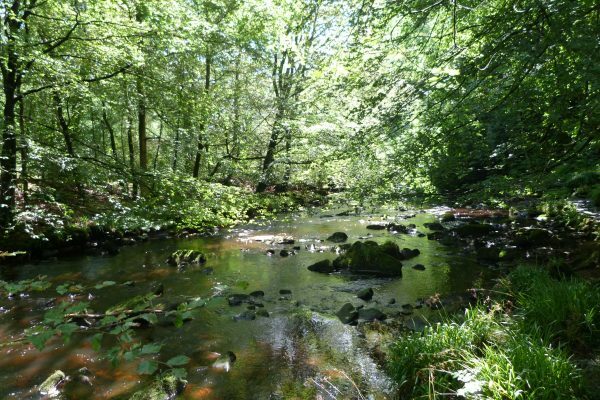 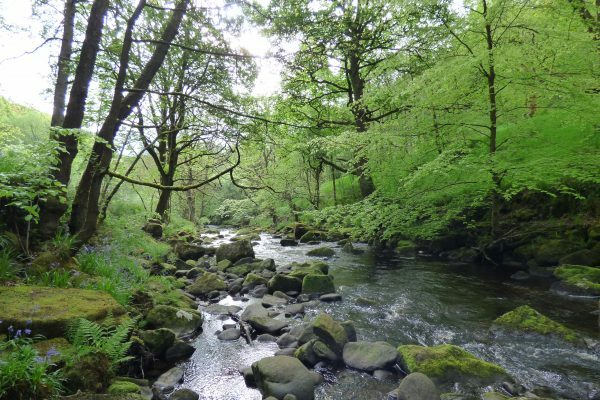 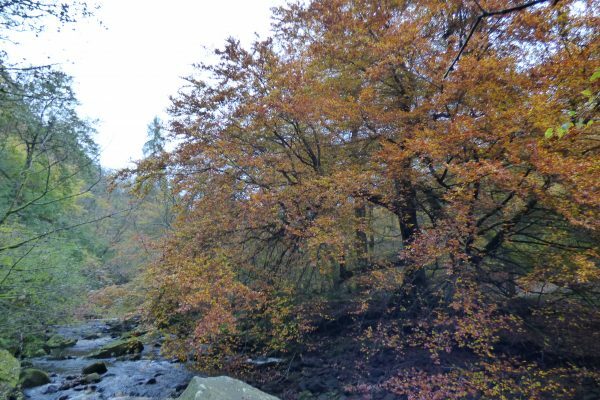 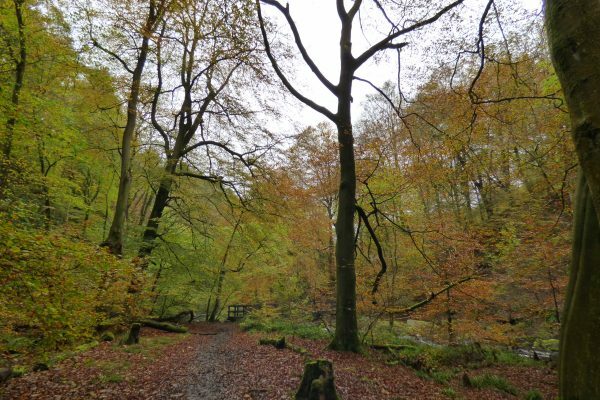 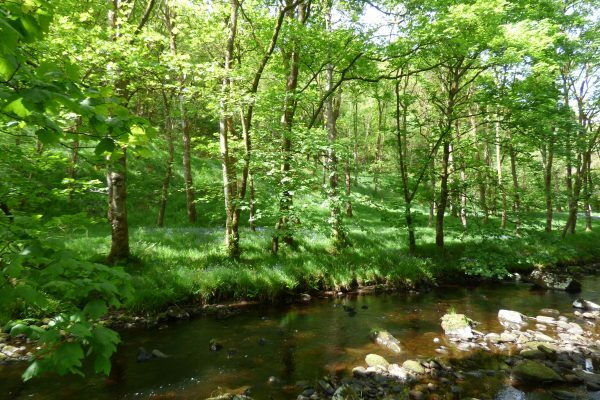 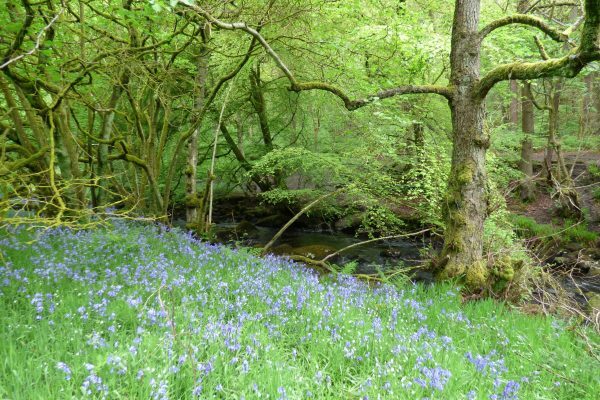 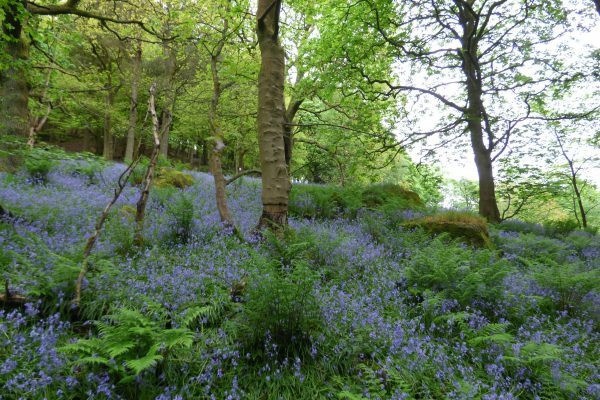 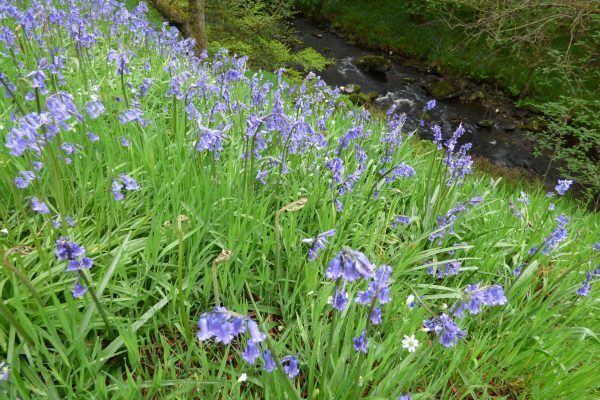 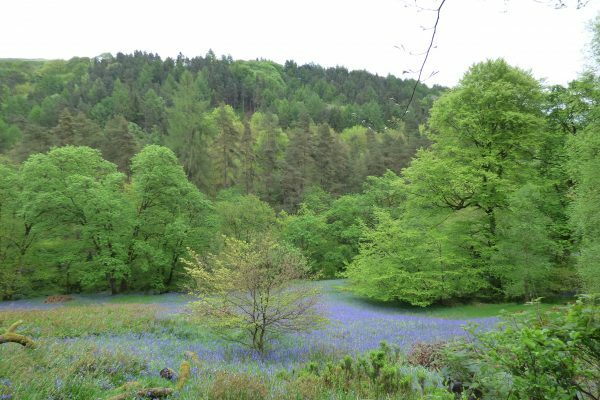 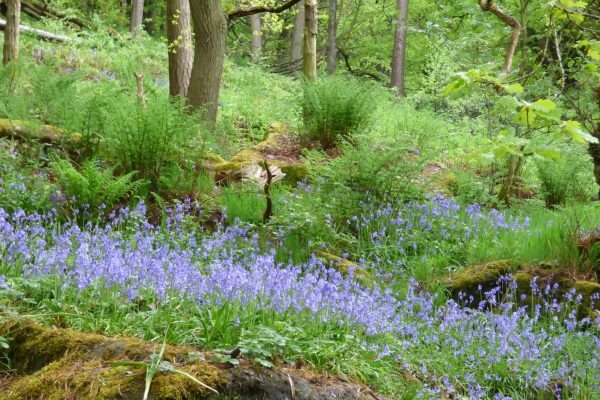 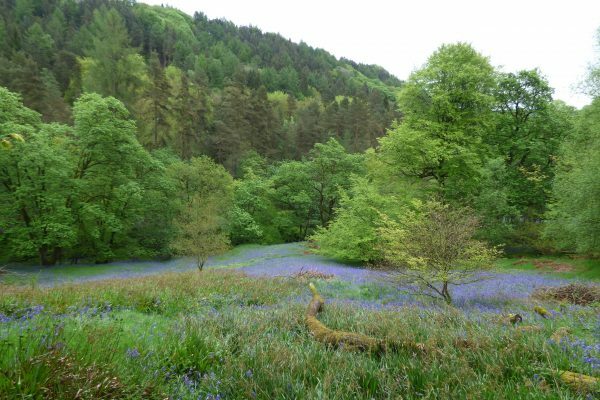 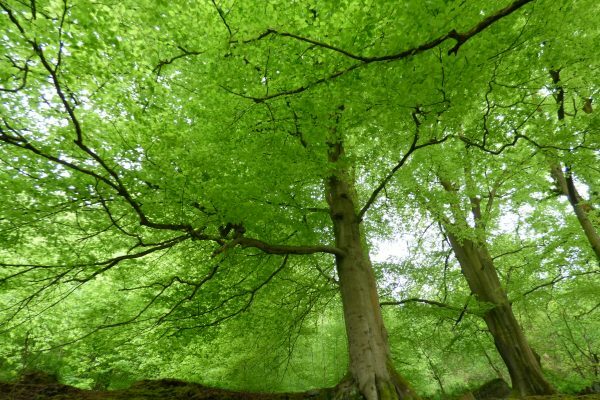 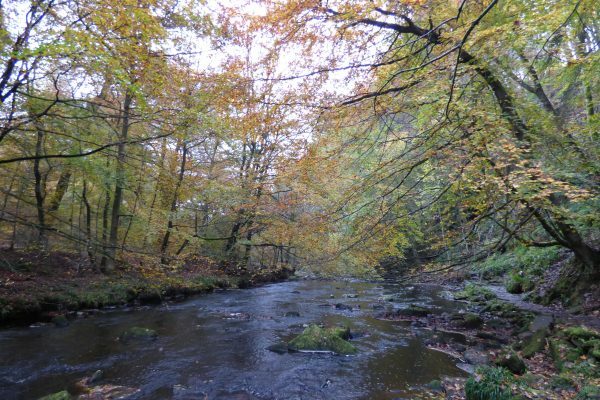 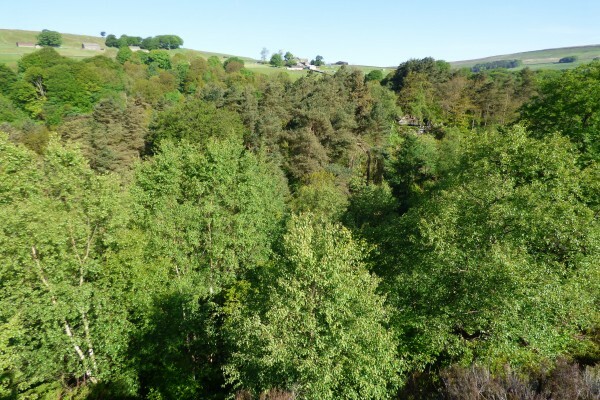 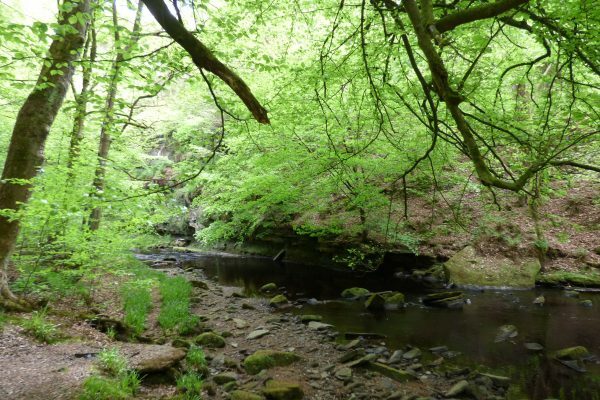 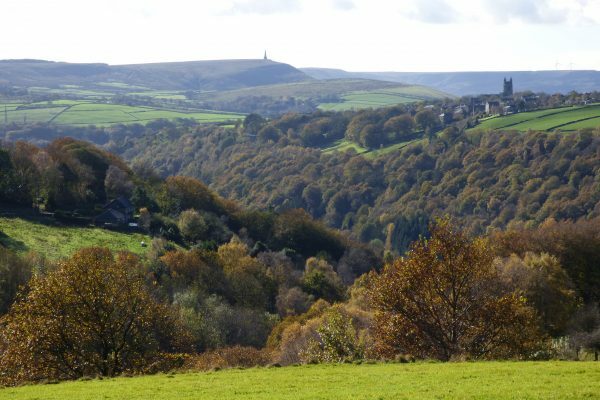 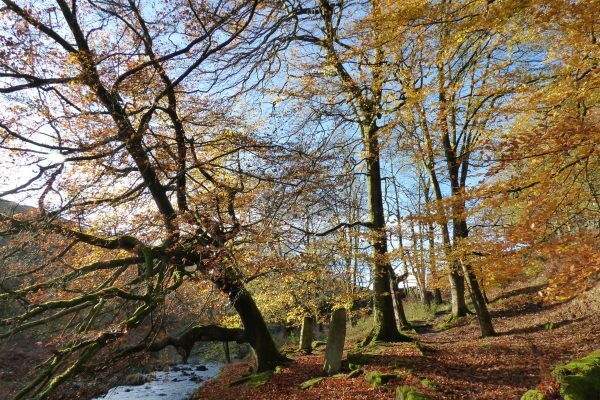 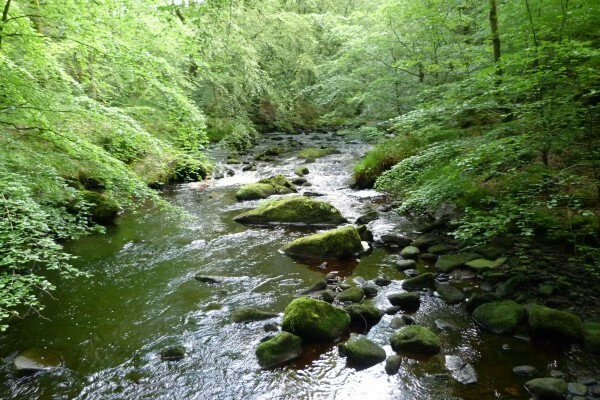 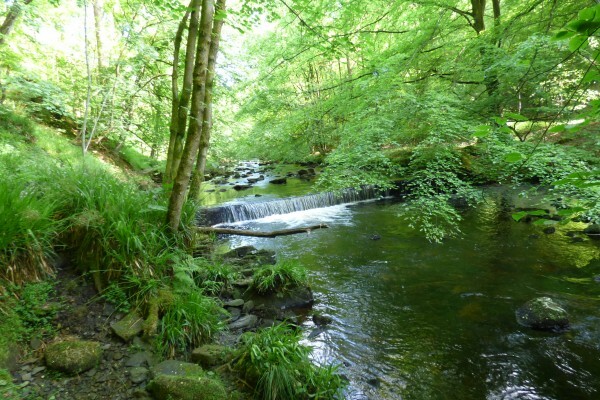 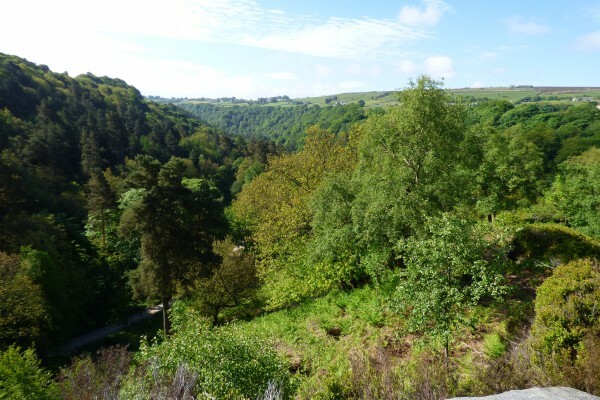 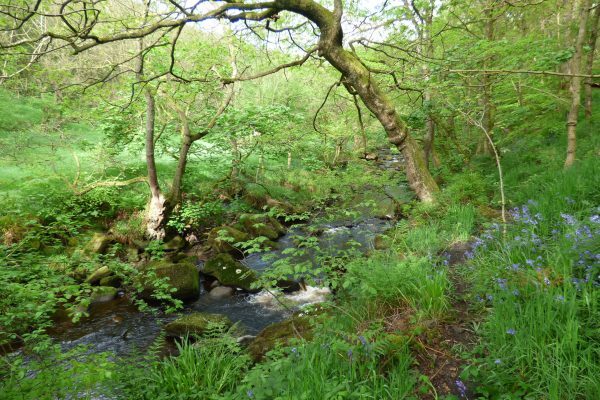 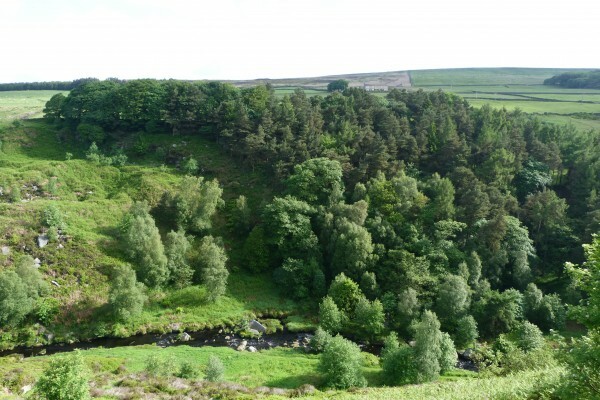 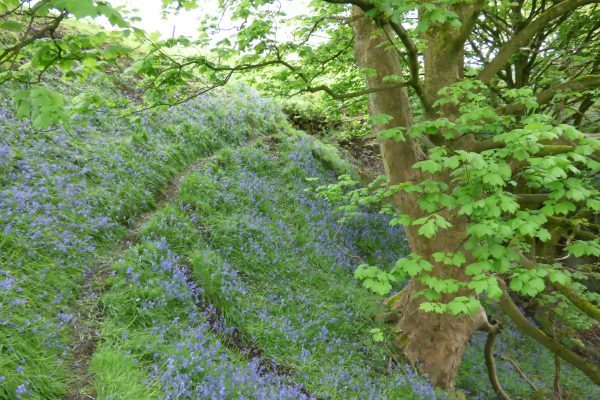 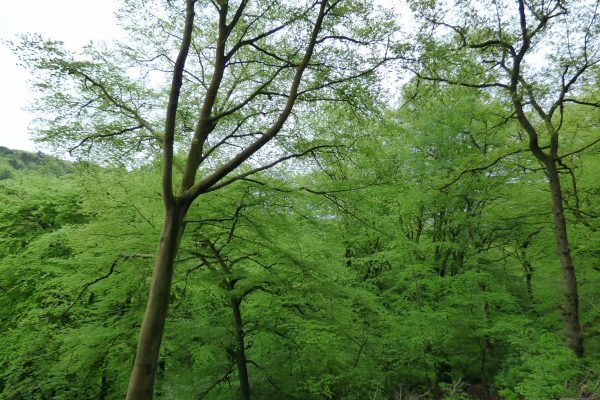 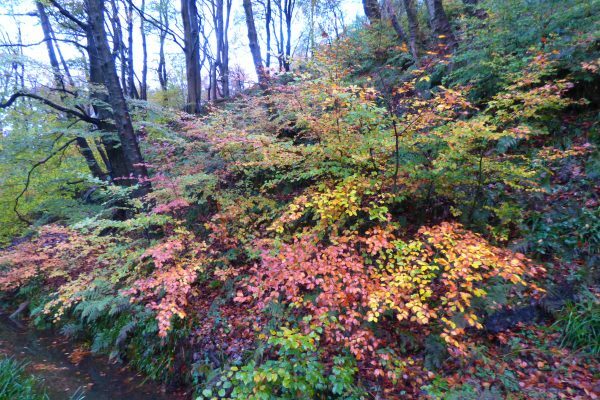 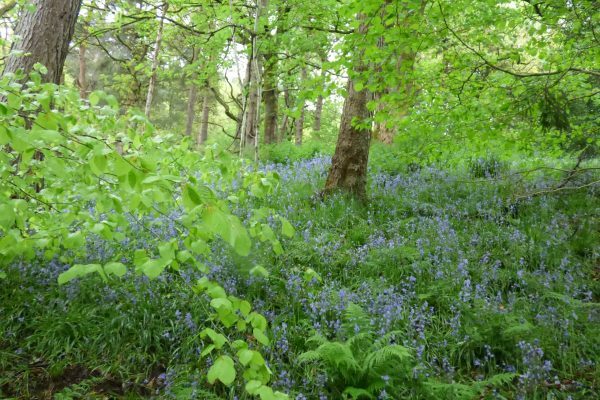 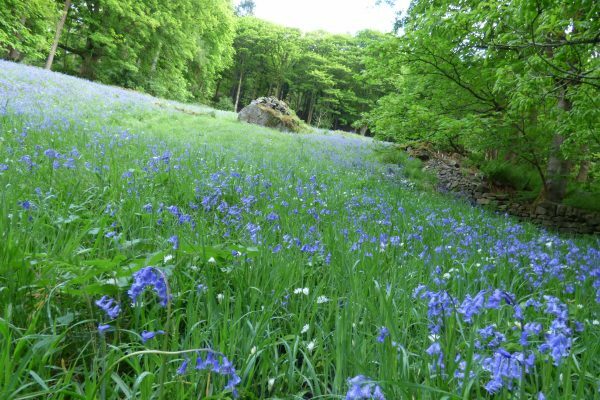 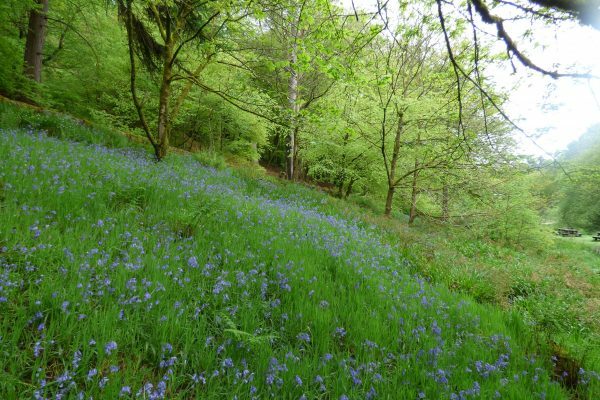 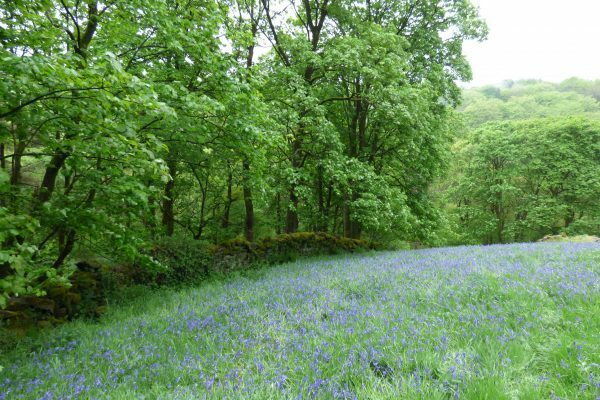 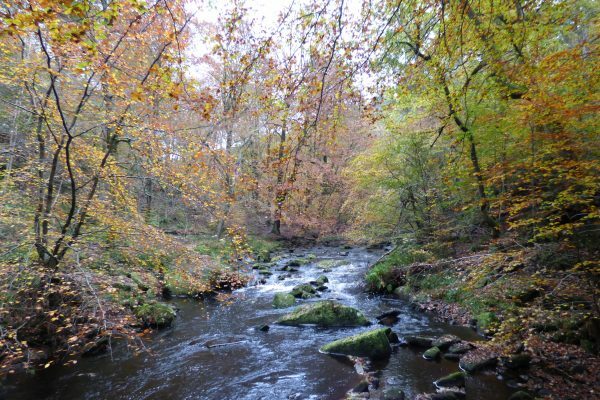 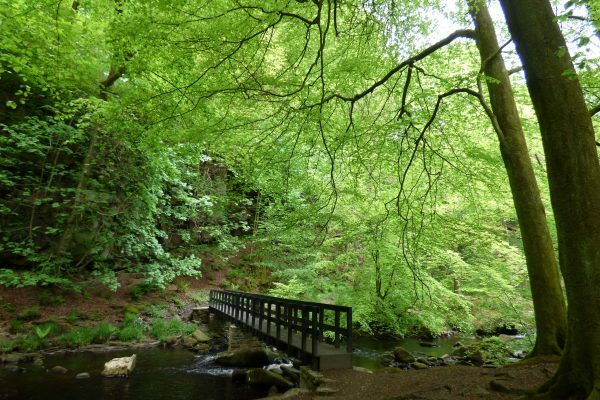 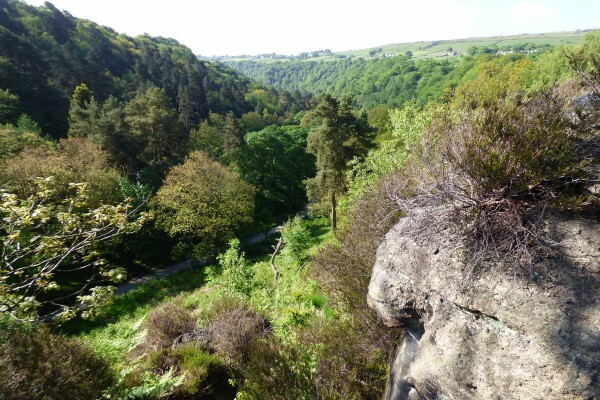 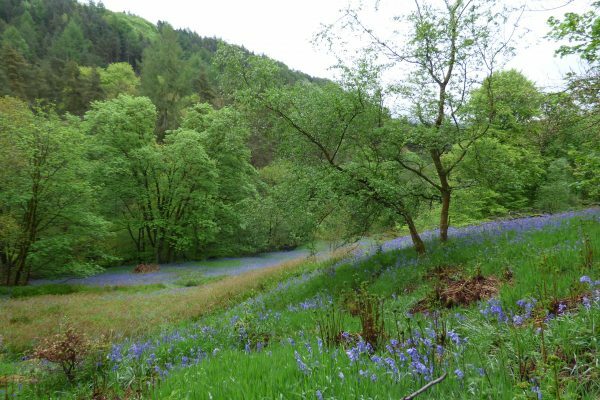 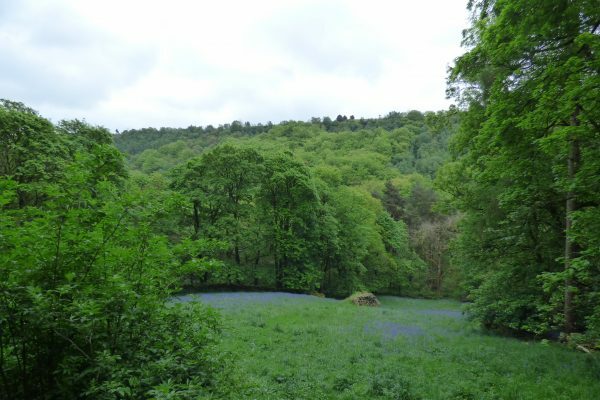 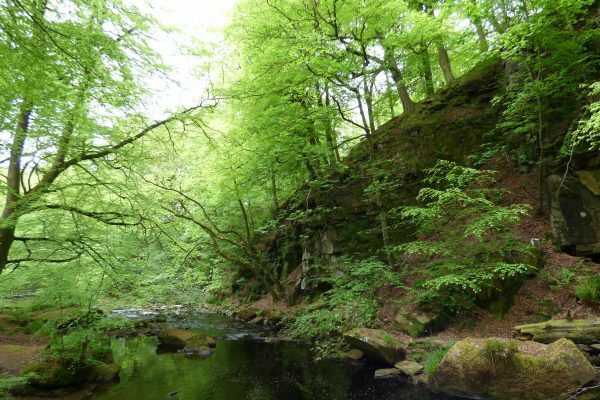 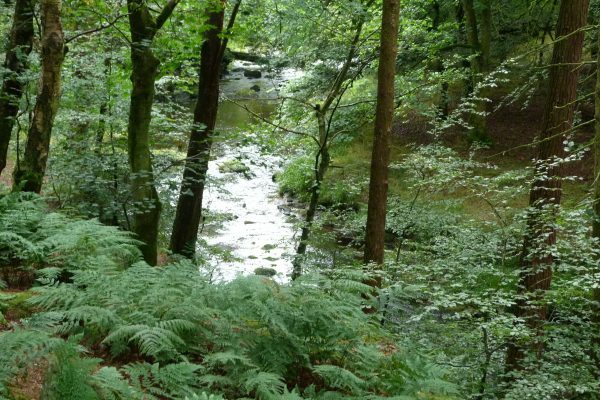 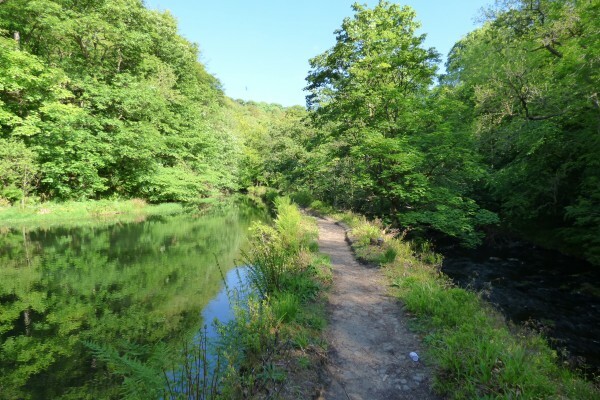 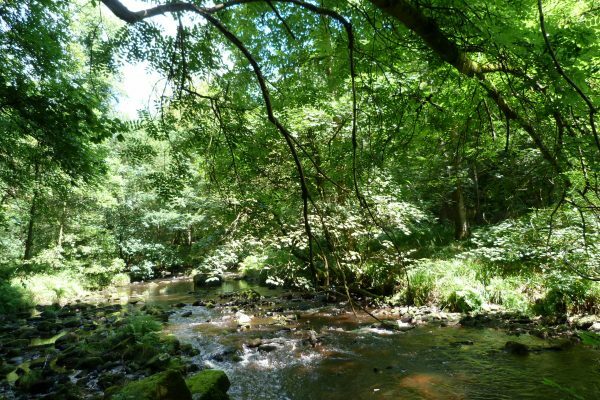 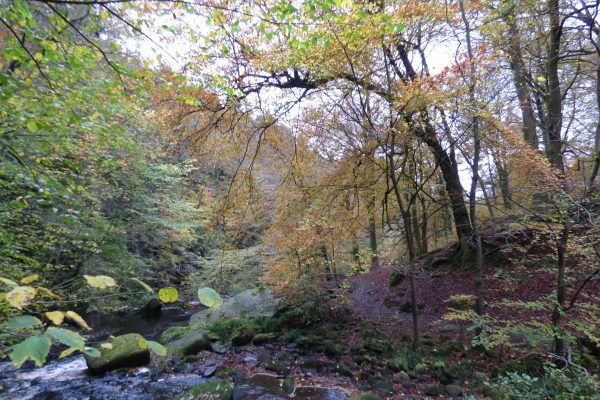 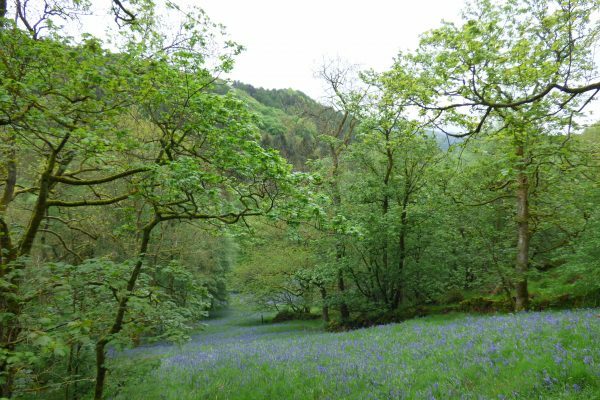 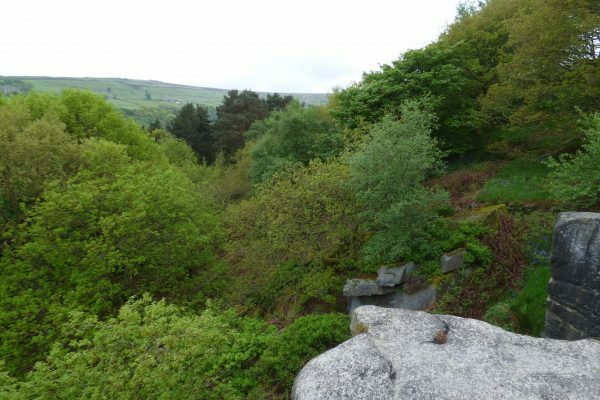 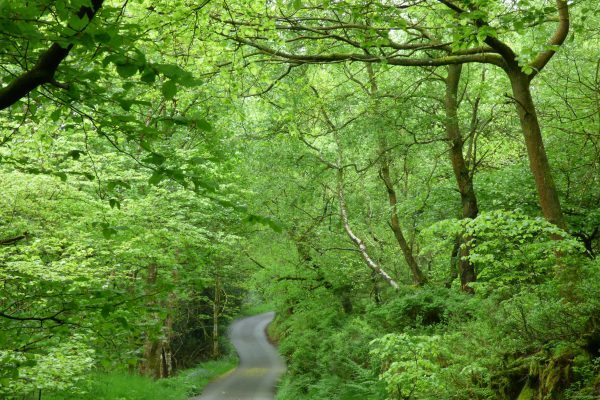 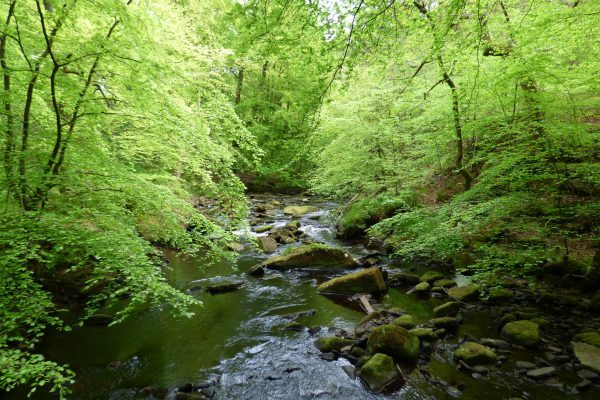 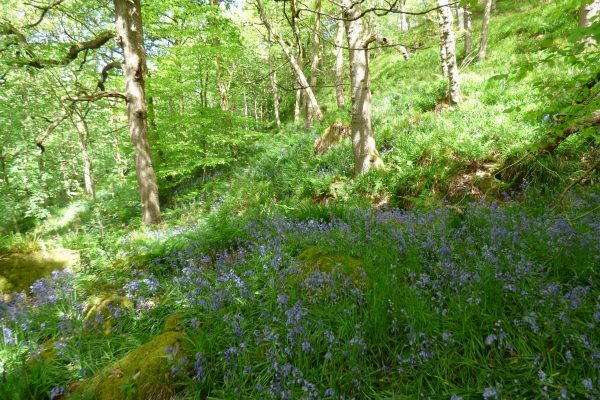 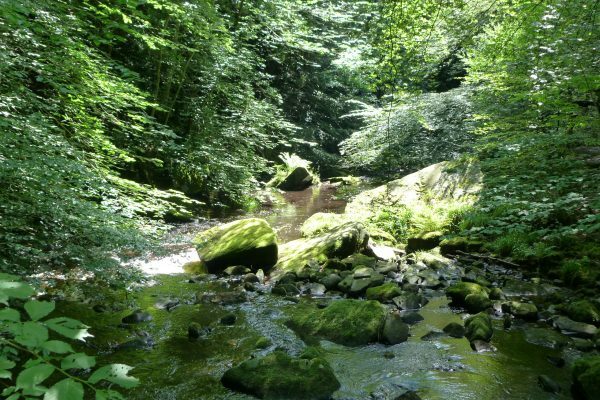 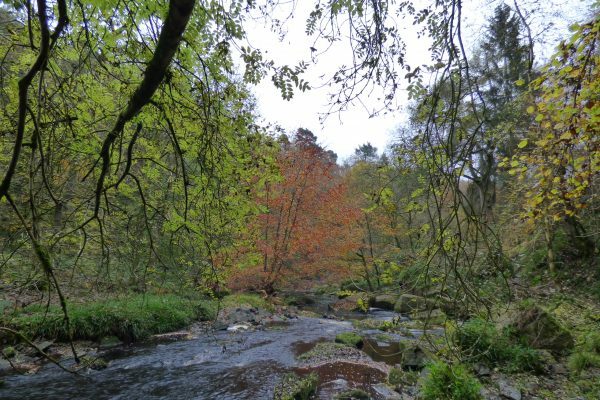 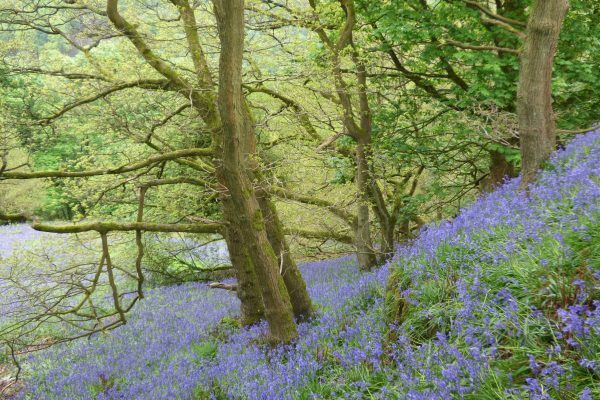 A woodland paradise in the dramatic steep-sided valley of Hebden Dale, Hardcastle Crags has over 20 miles of footpaths running along by the river, across waterfalls and weaving up and down the hillsides. 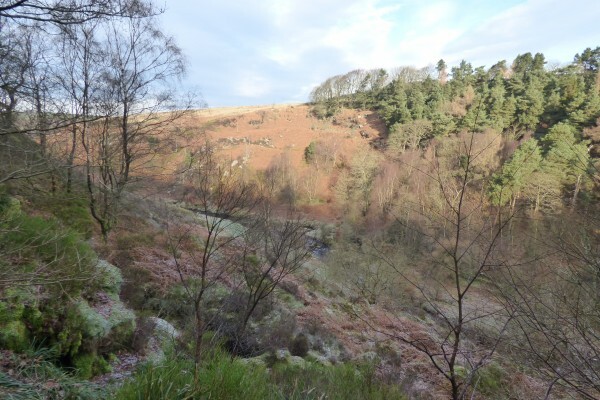 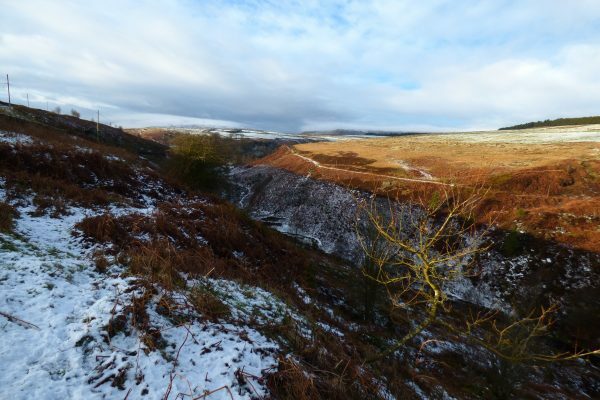 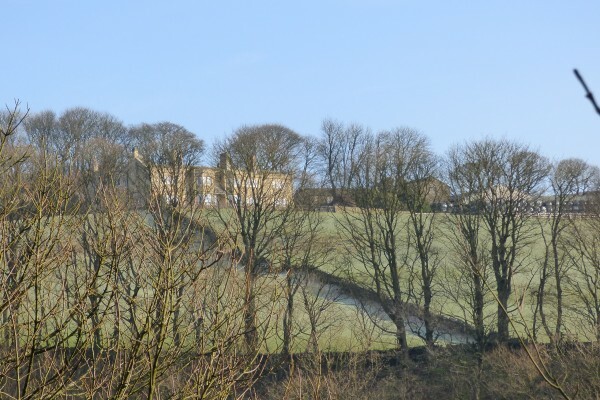 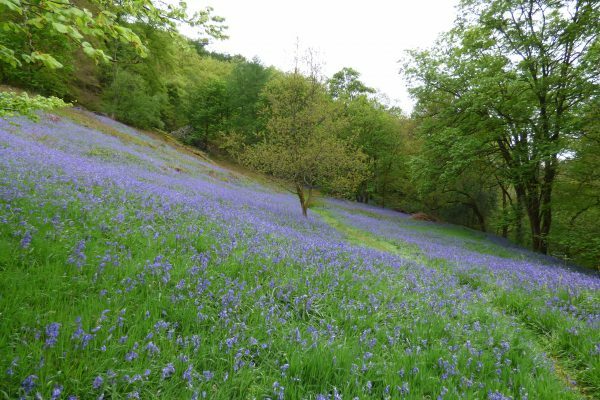 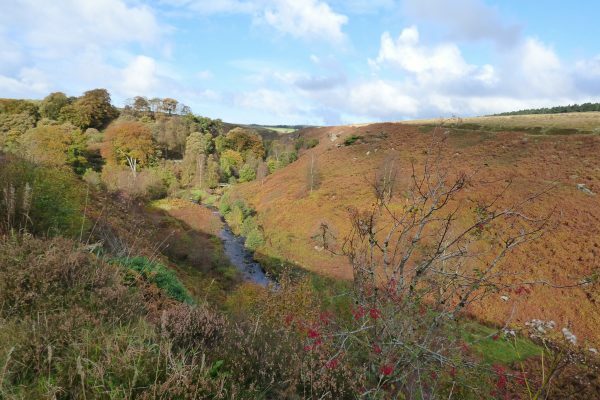 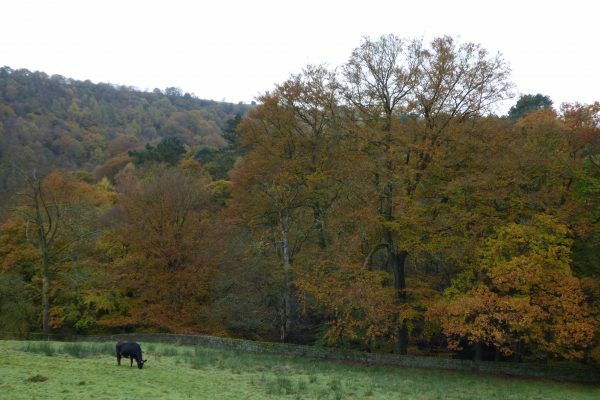 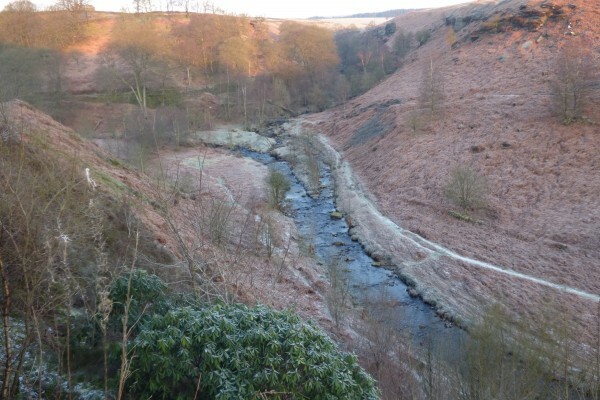 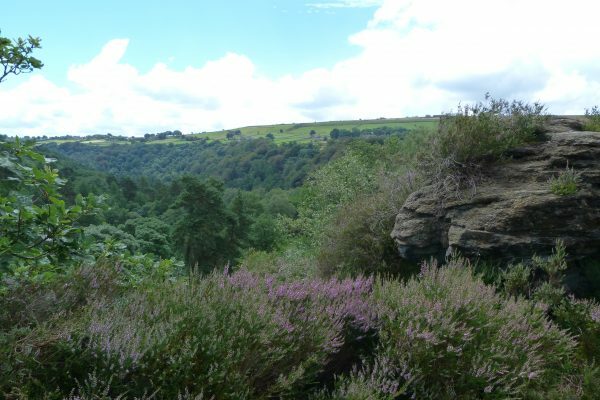 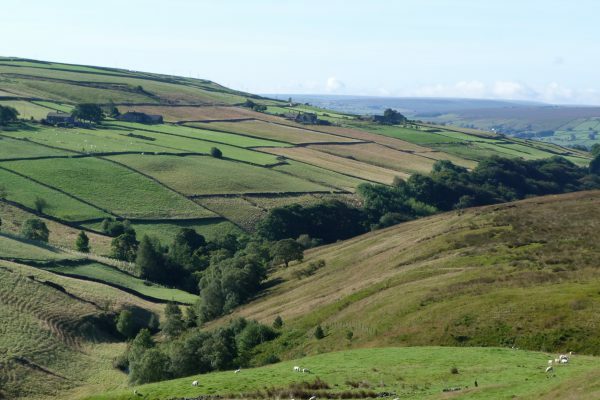 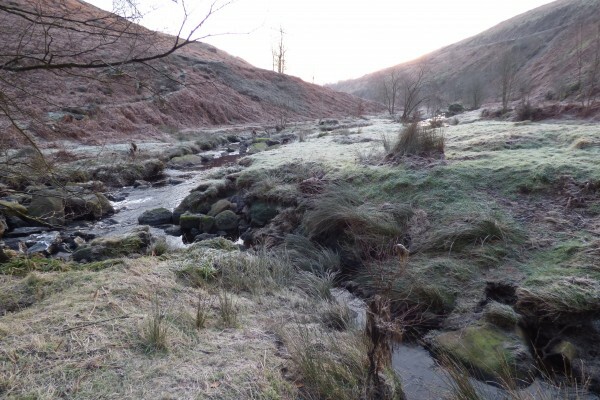 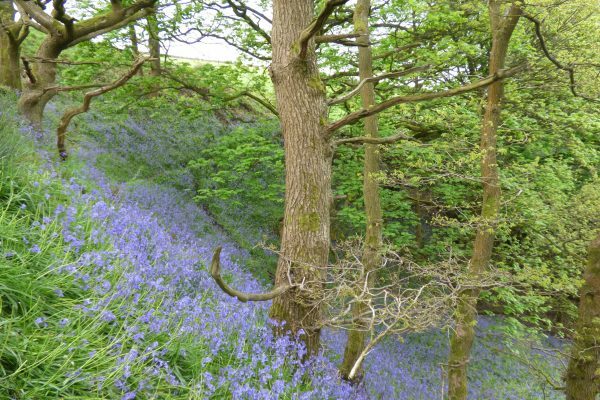 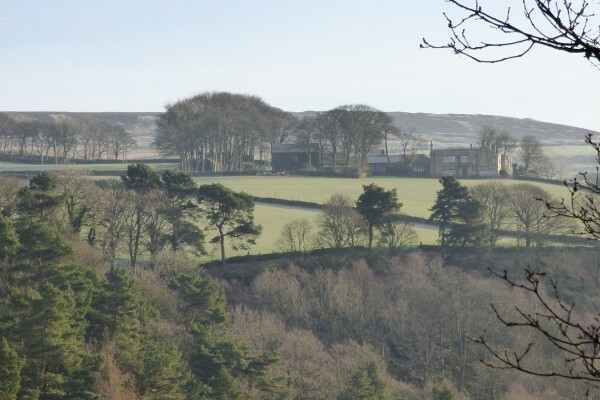 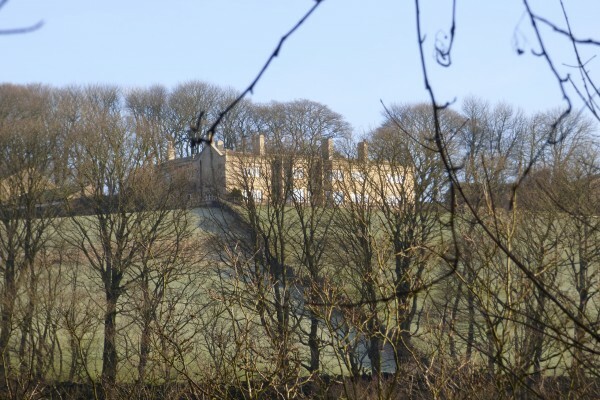 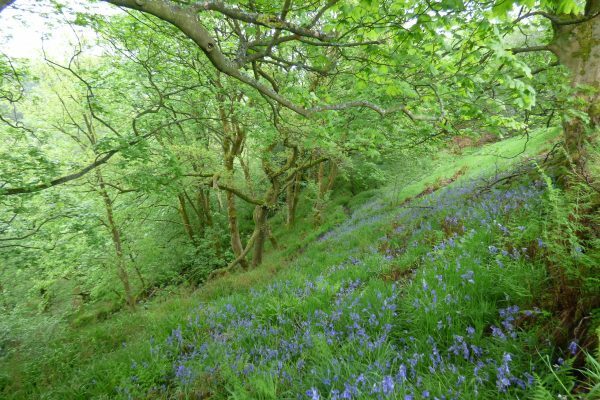 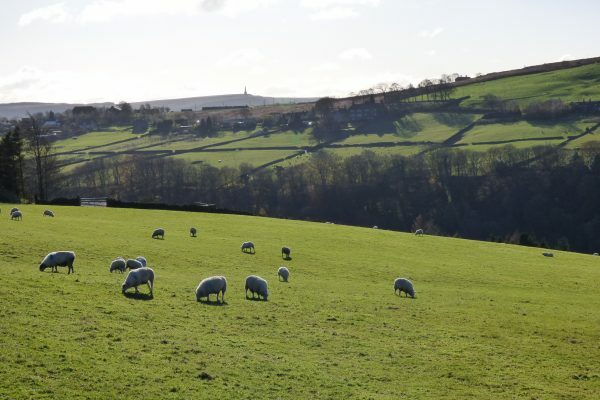 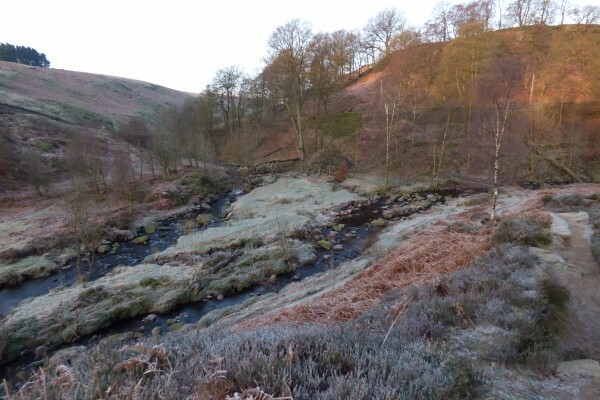 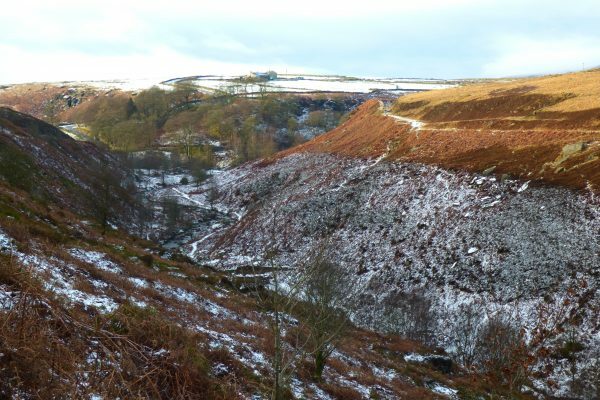 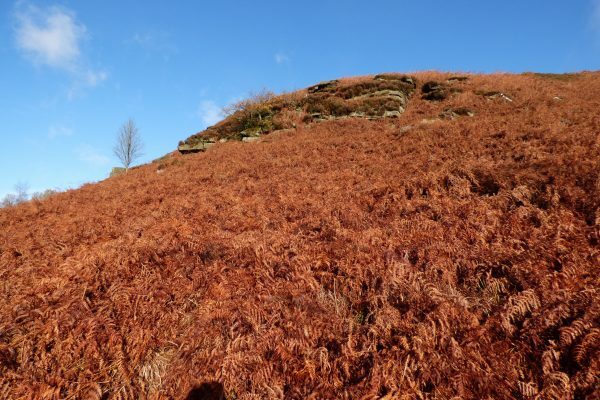 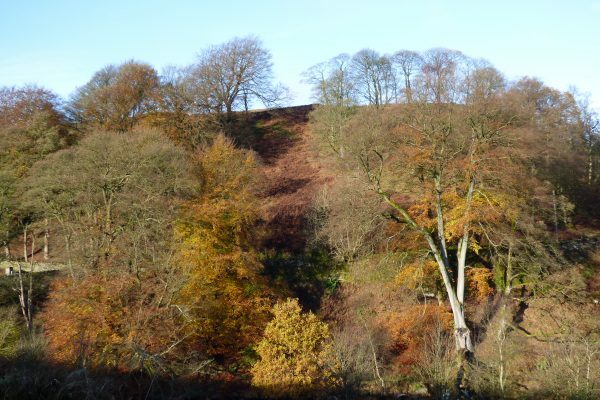 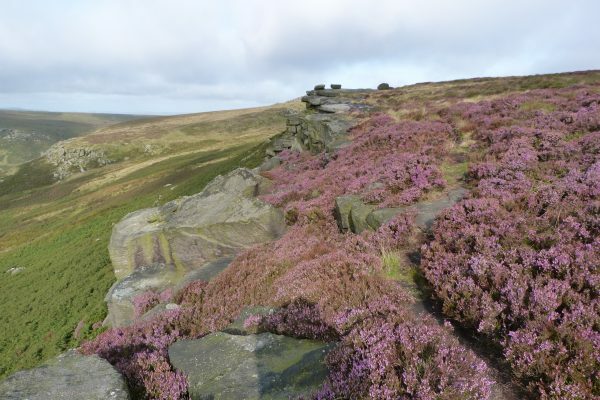 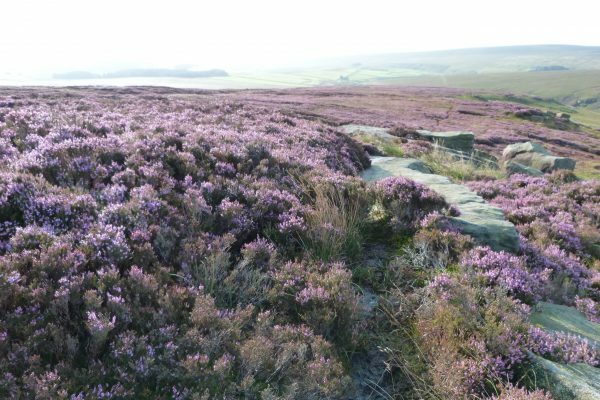 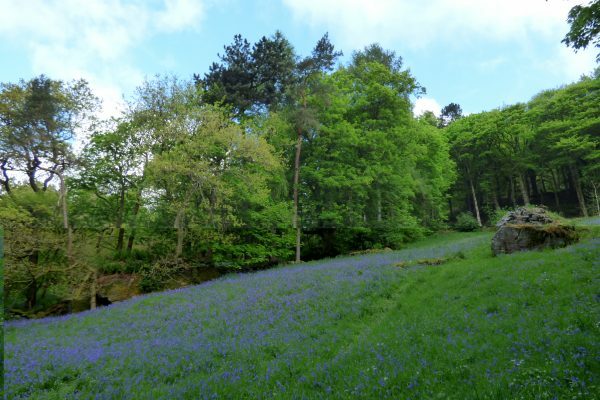 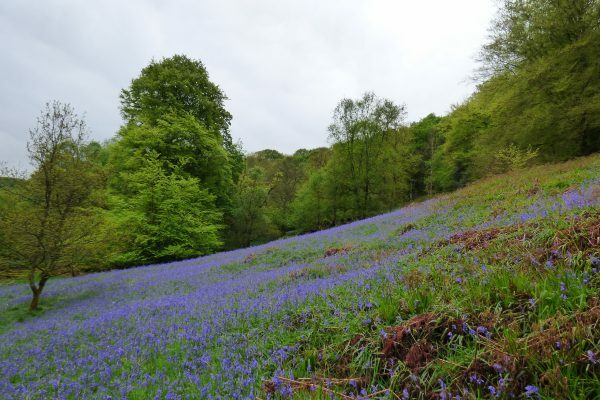 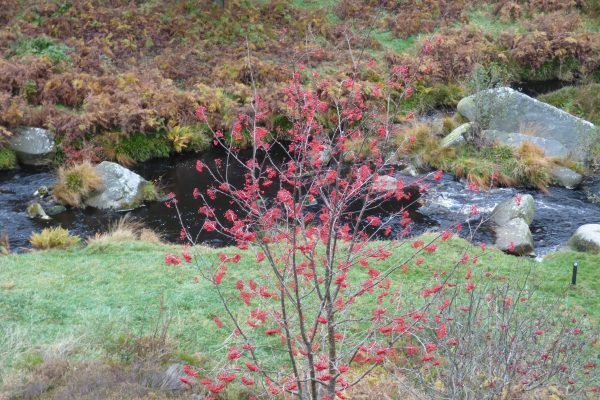 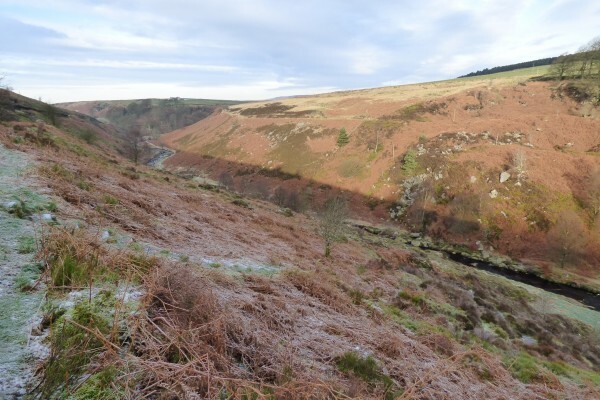 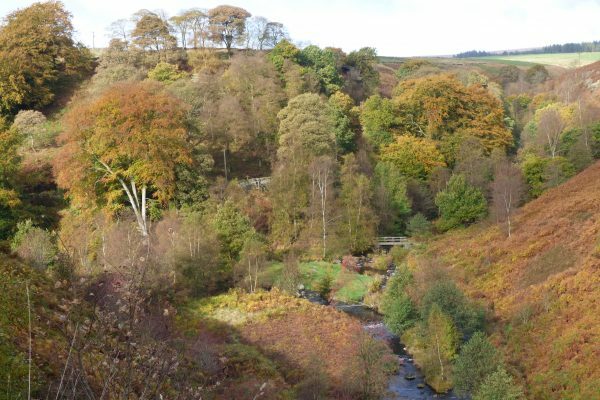 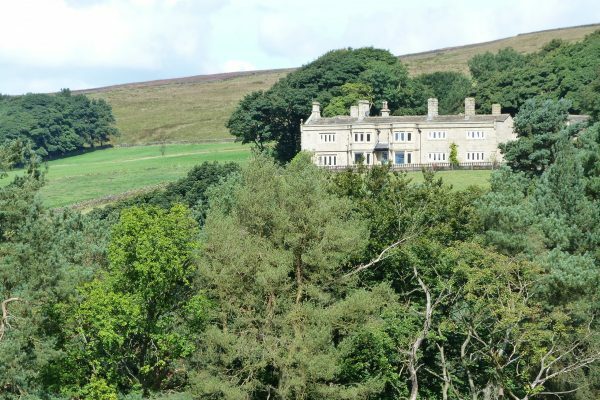 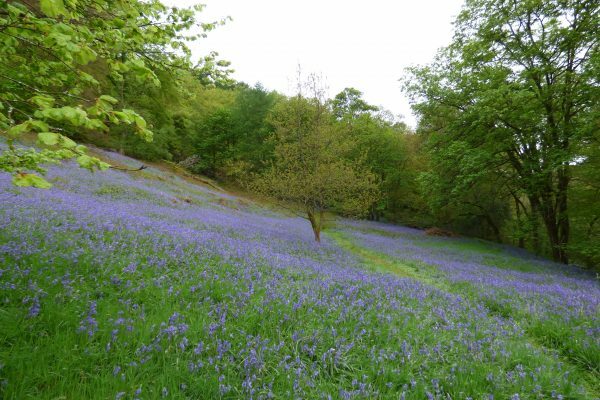 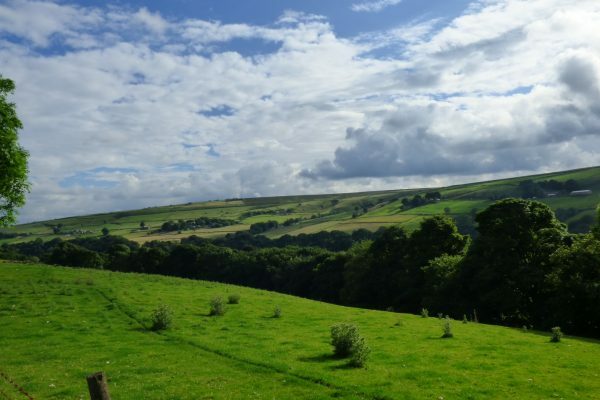 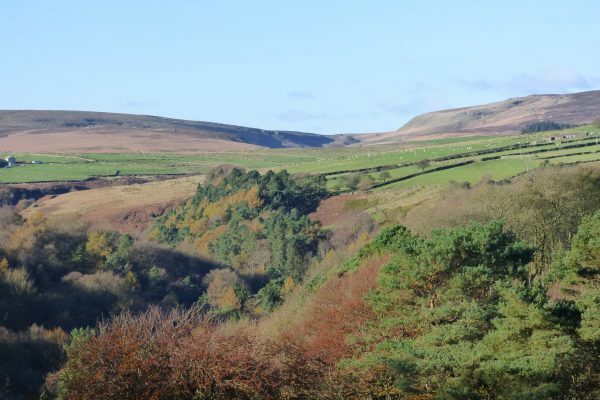 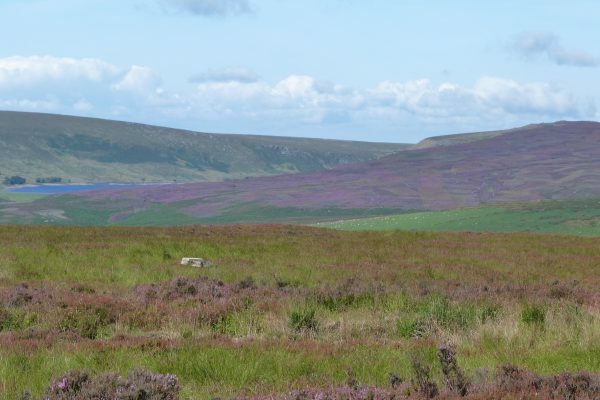 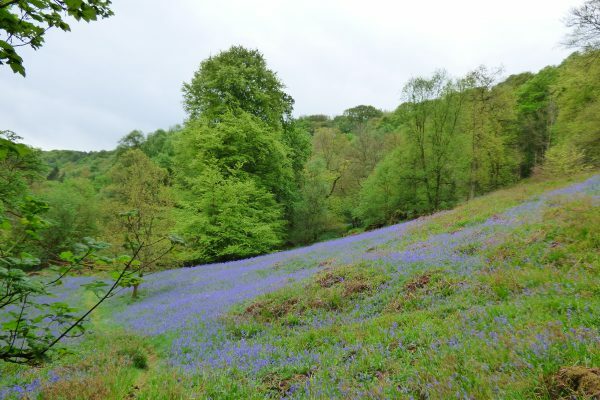 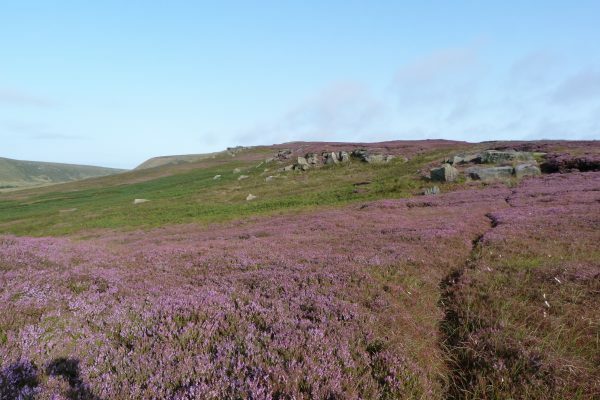 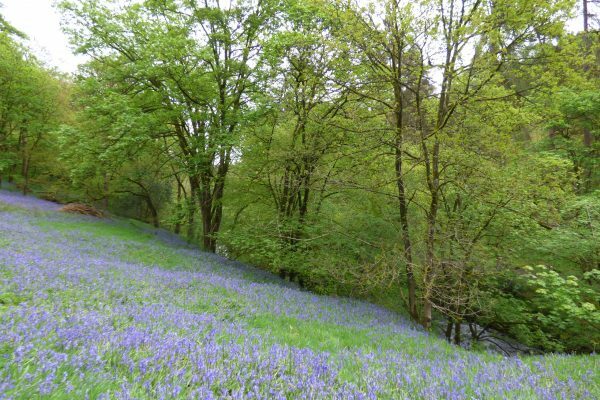 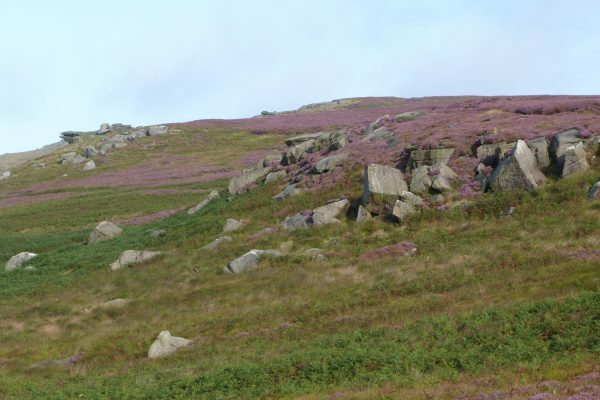 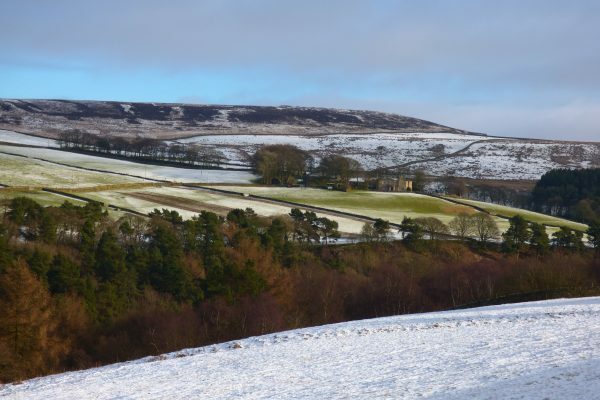 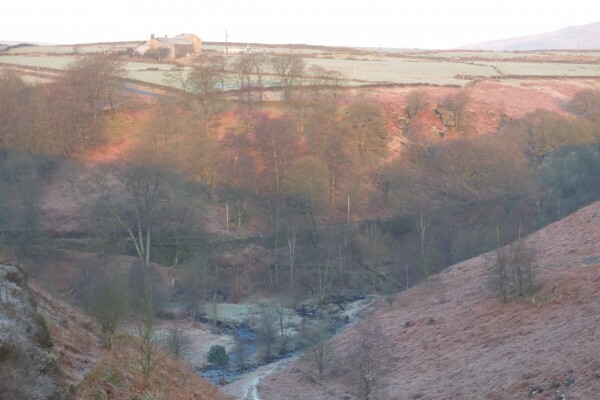 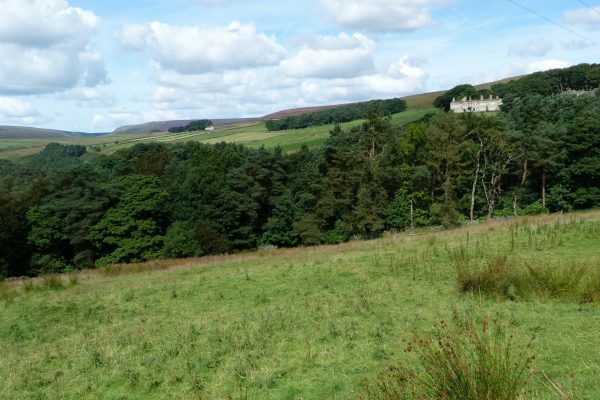 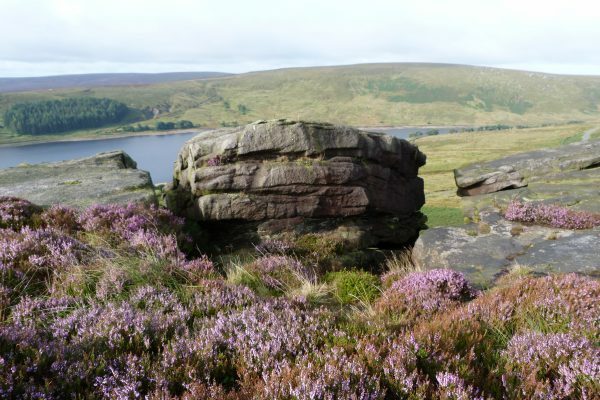 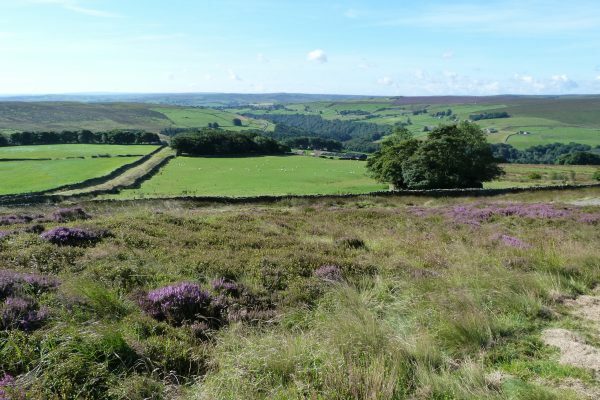 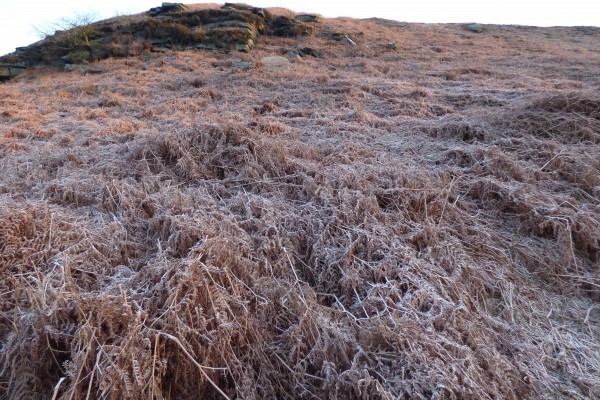 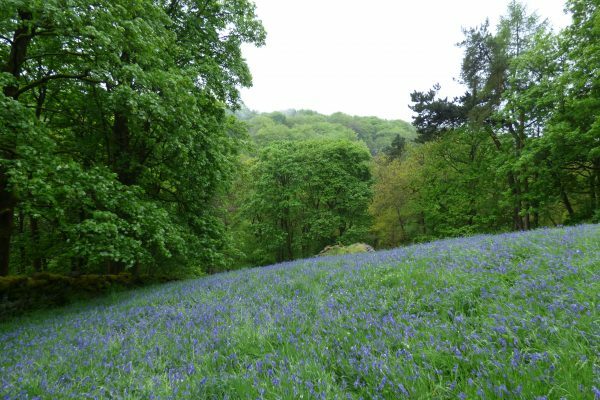 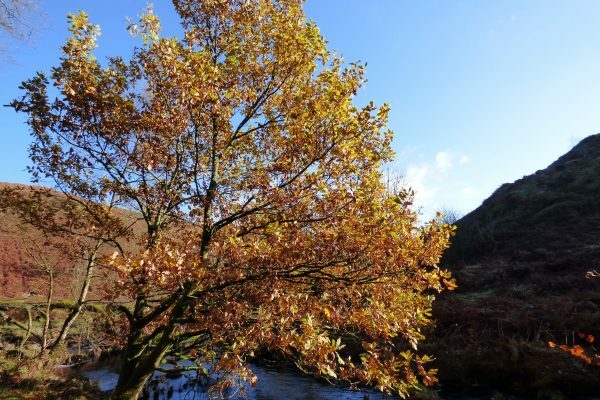 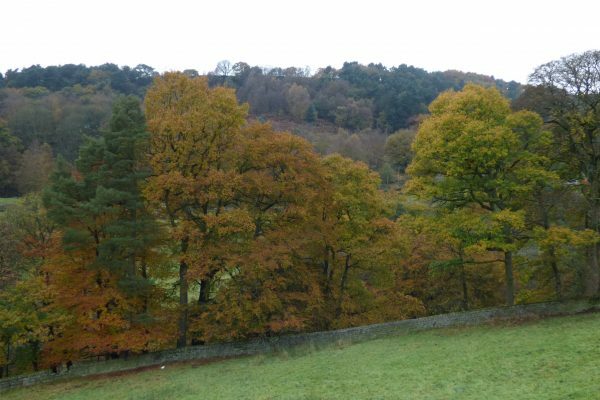 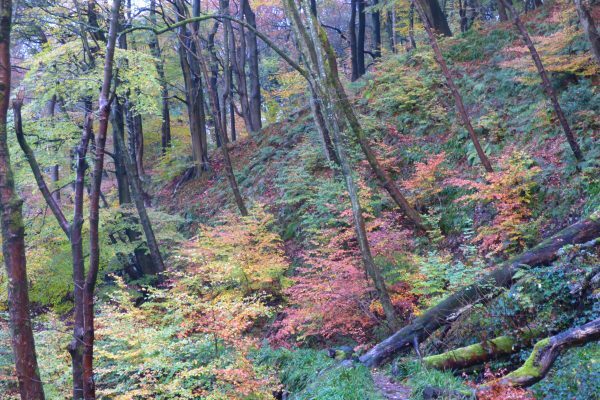 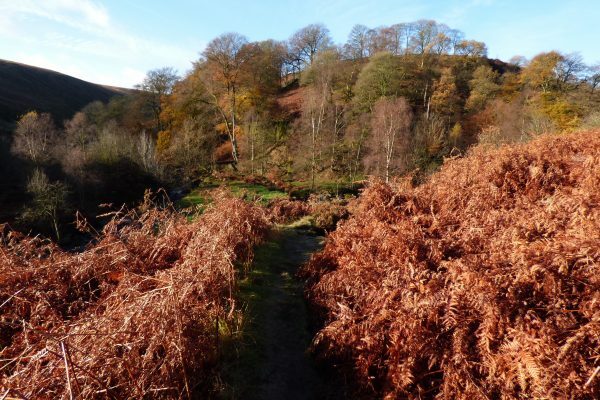 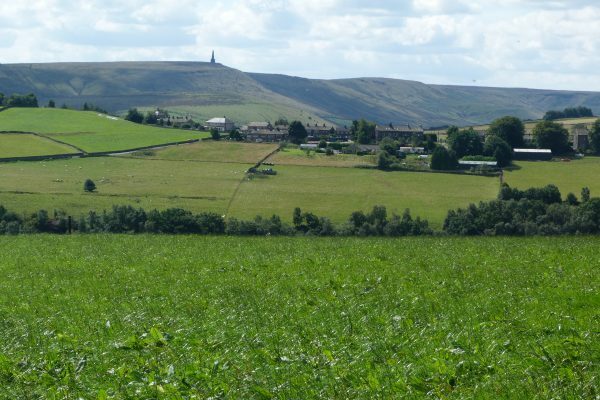 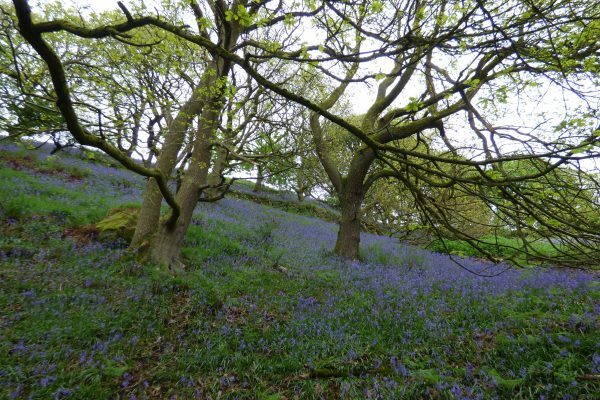 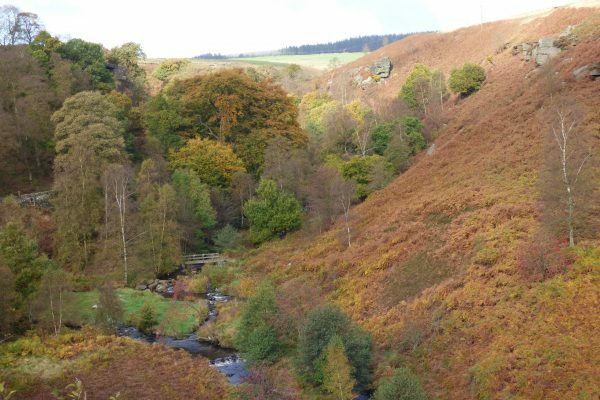 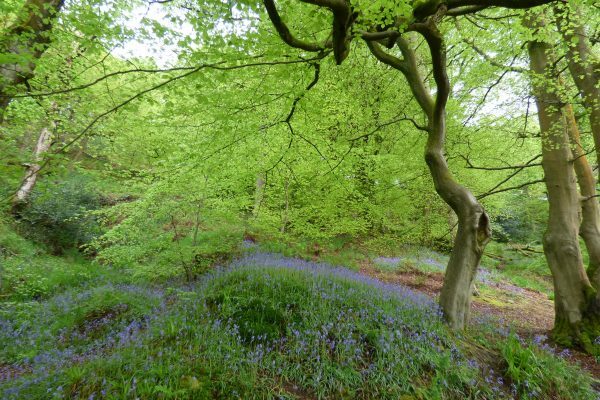 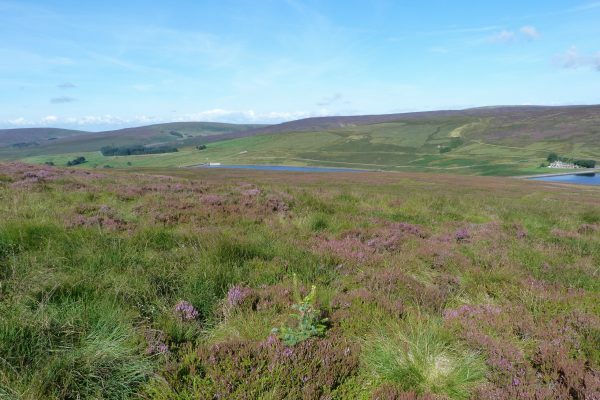 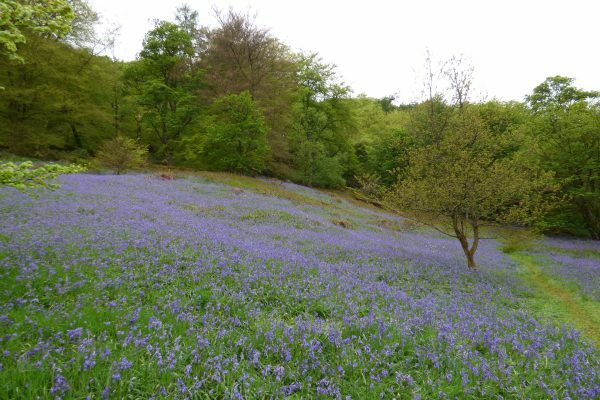 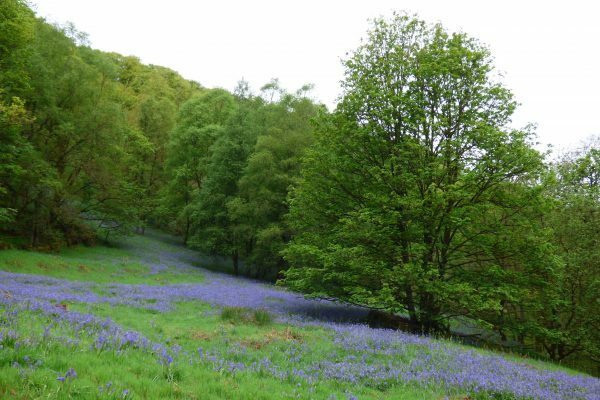 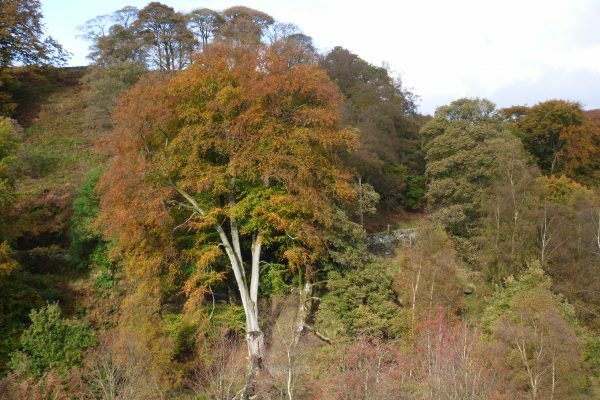 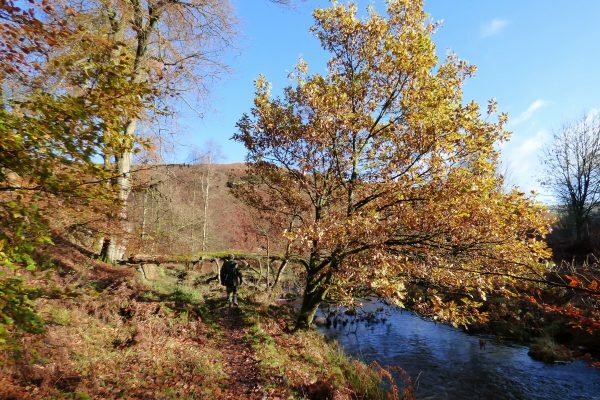 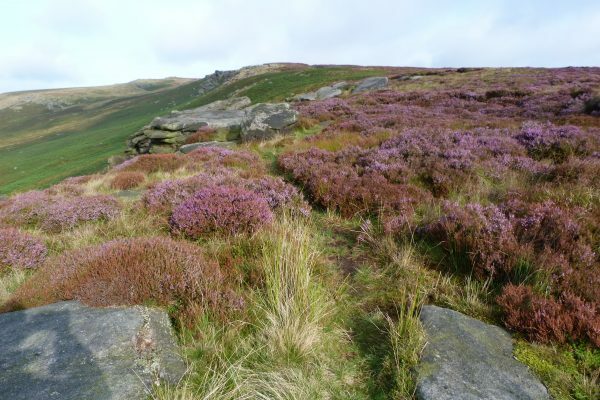 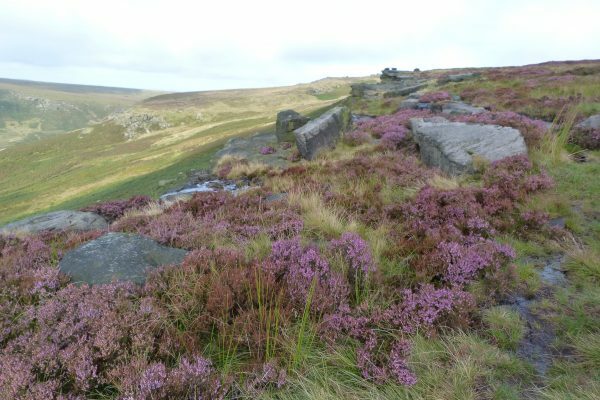 Nestling in the valley just below Elmet Farmhouse, Hardcastle Crags is spectacularly beautiful all year round. 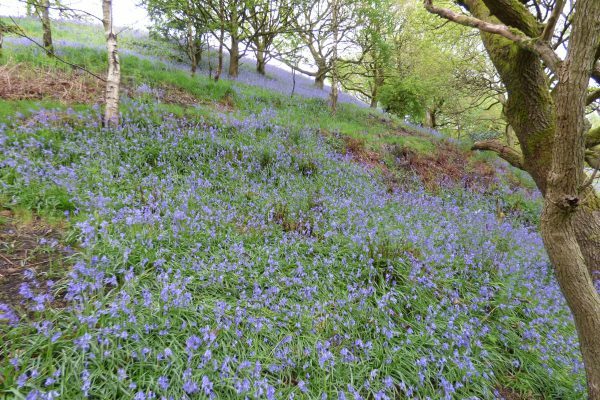 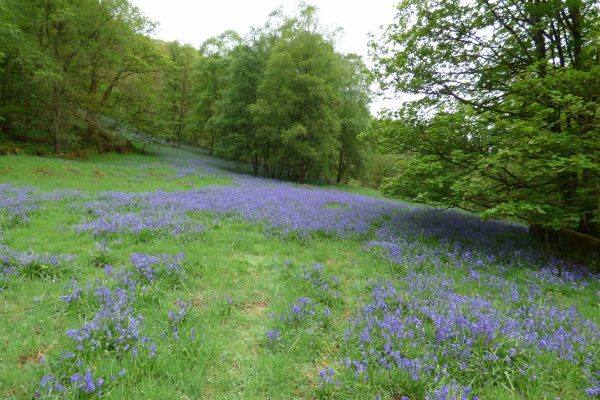 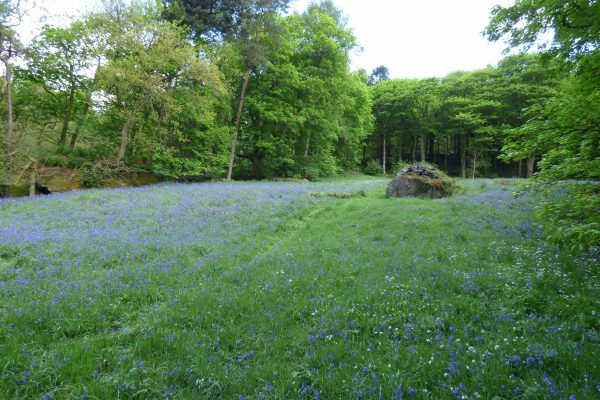 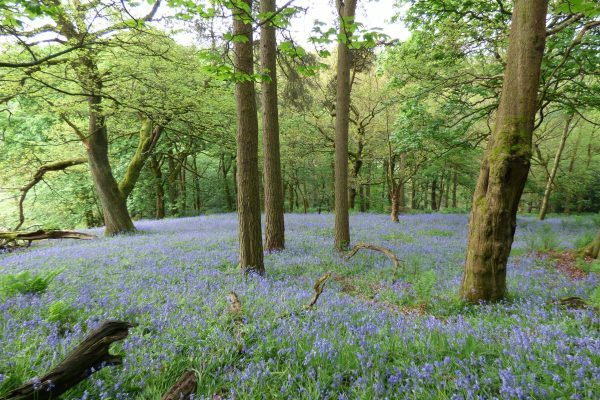 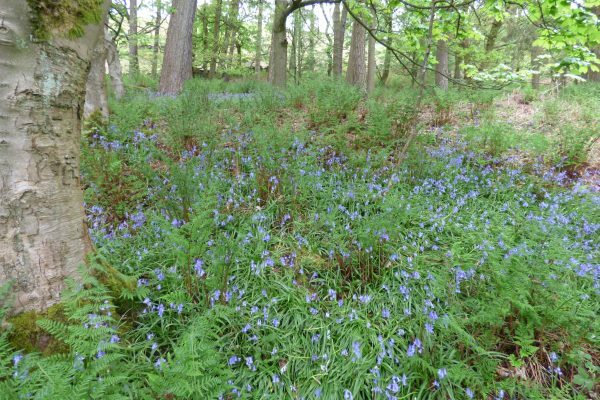 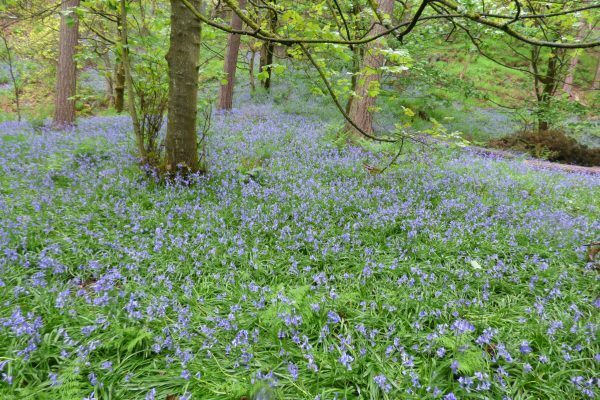 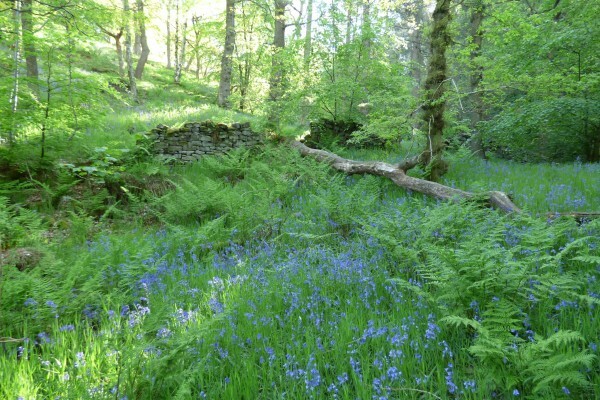 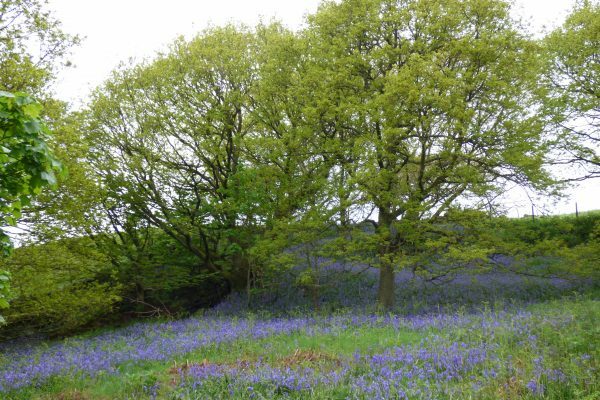 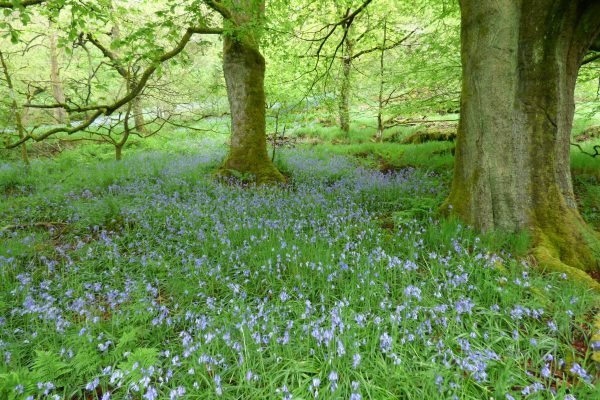 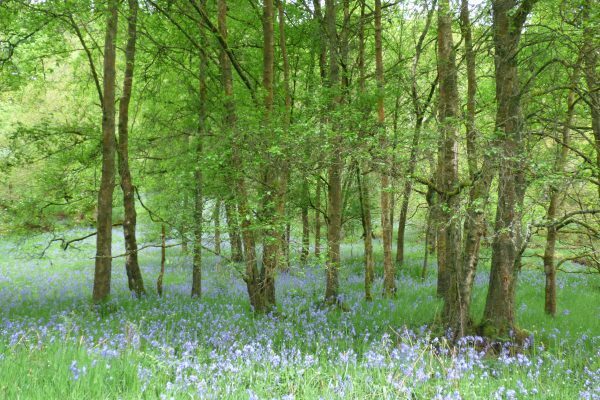 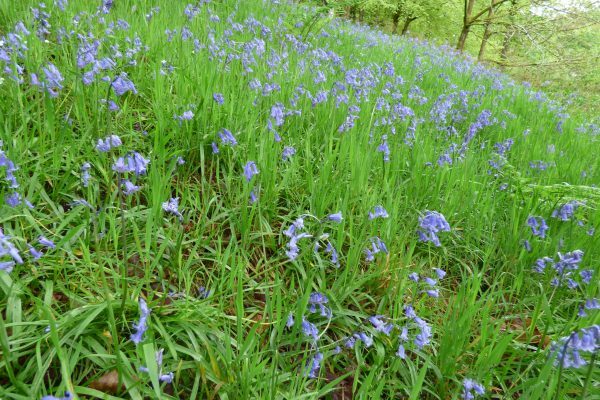 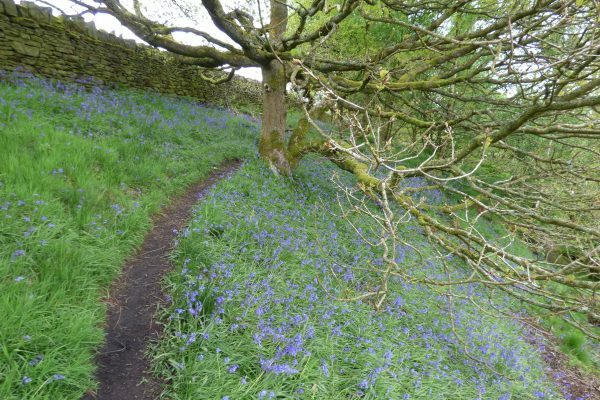 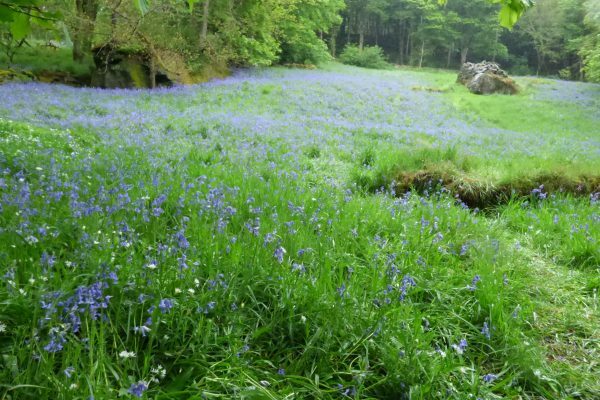 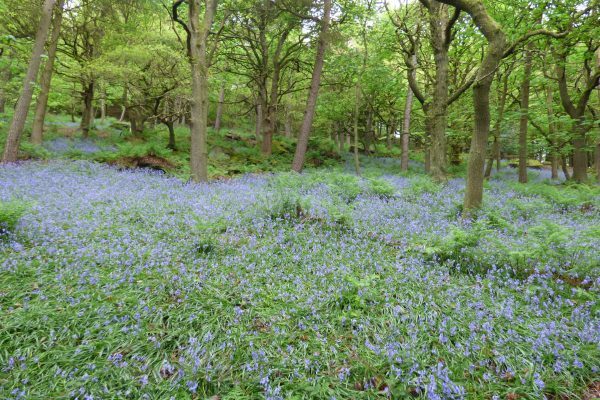 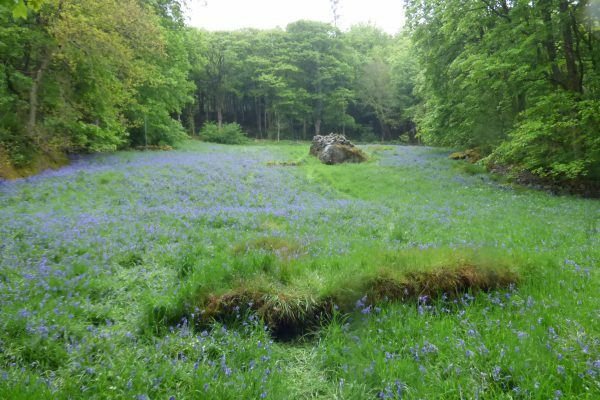 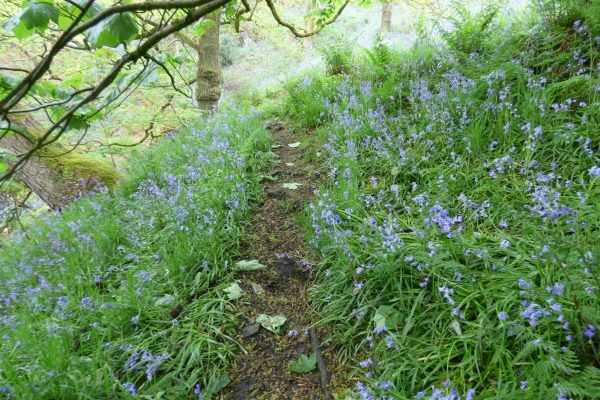 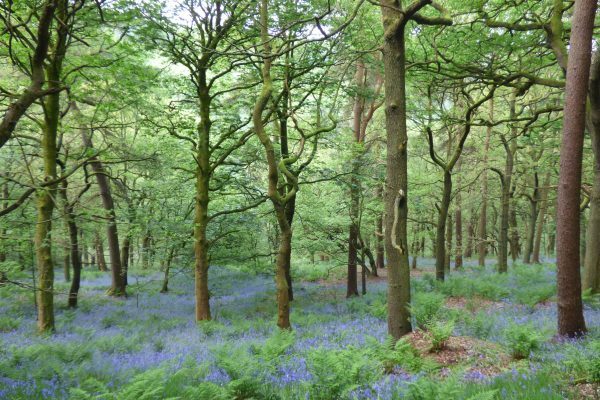 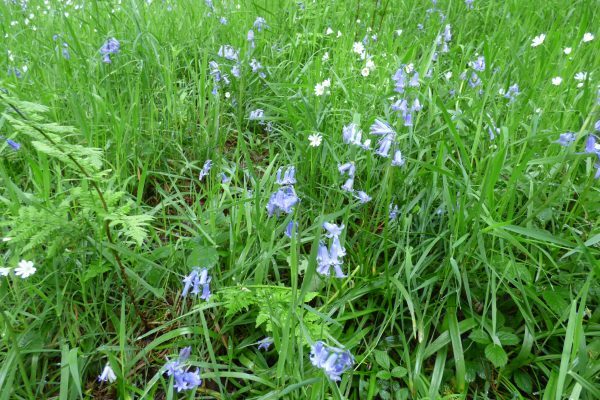 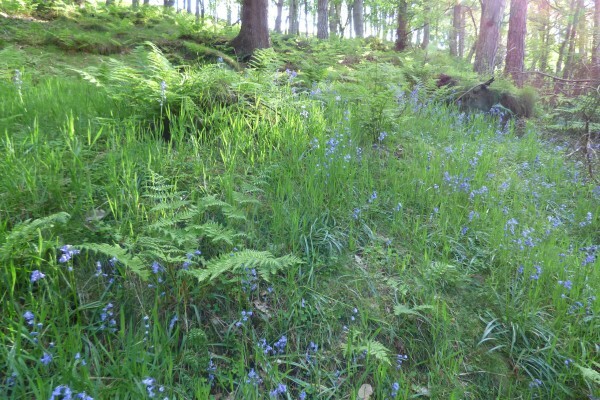 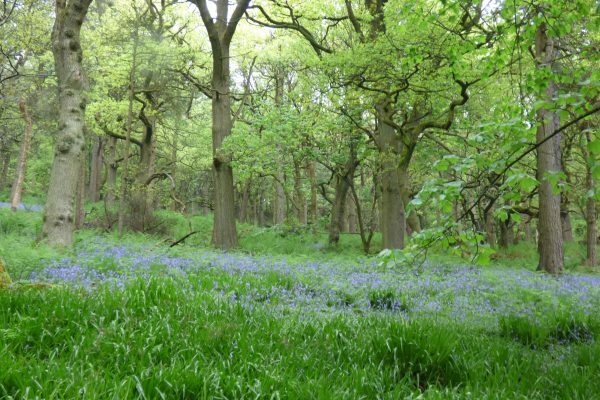 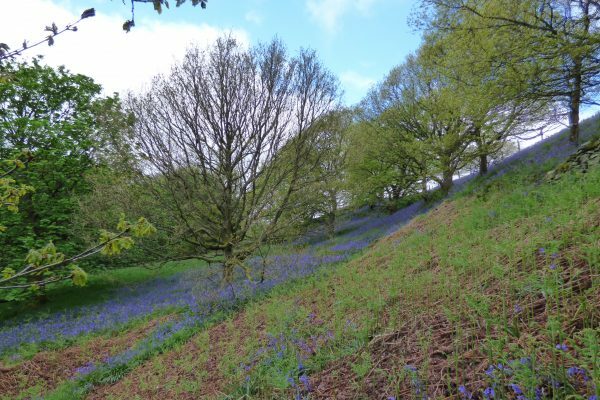 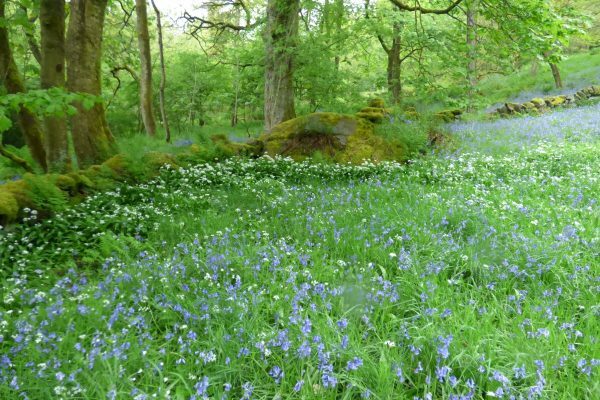 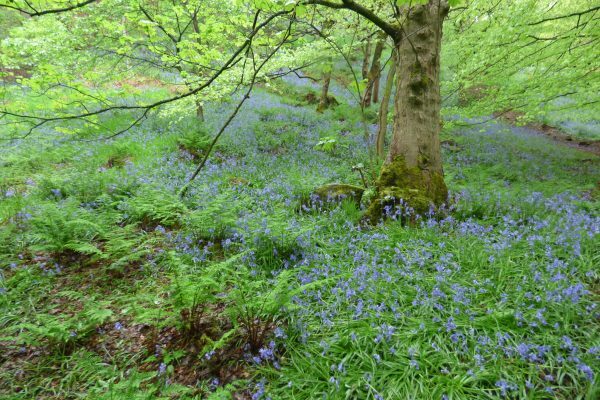 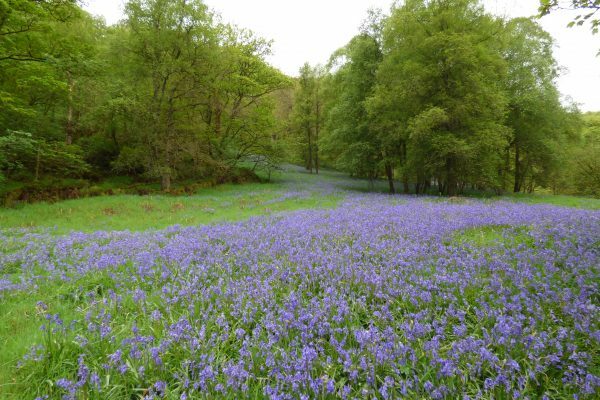 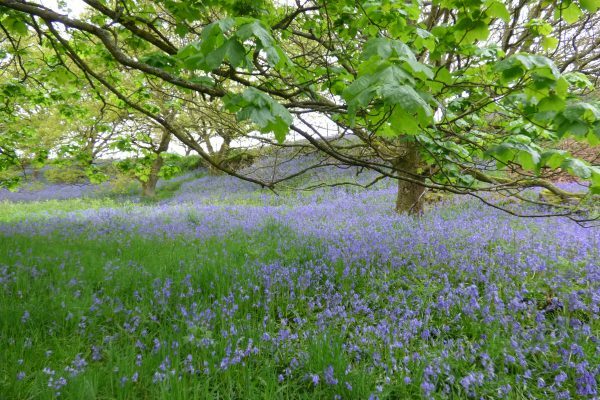 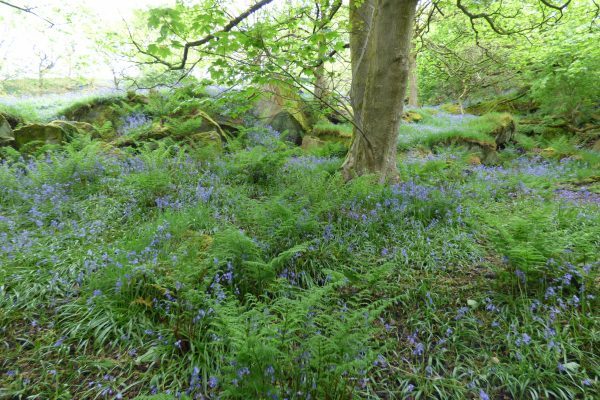 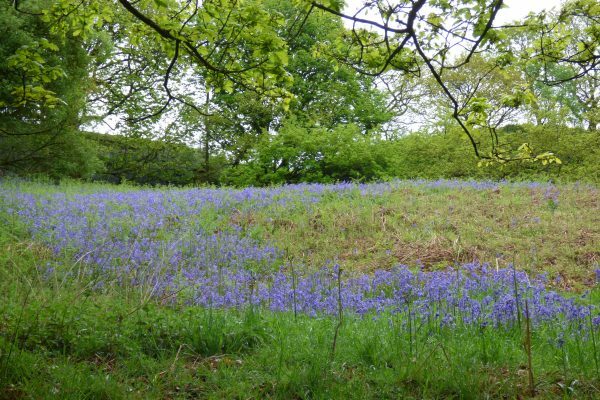 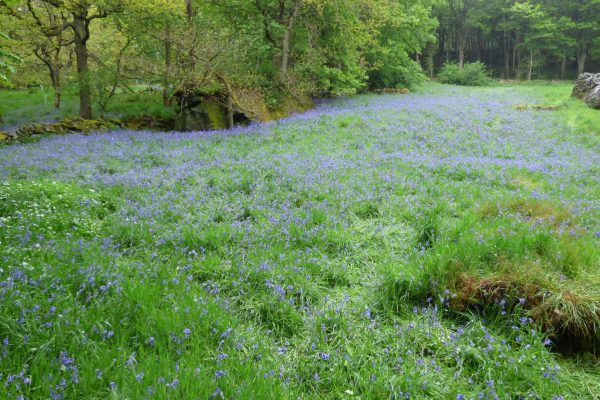 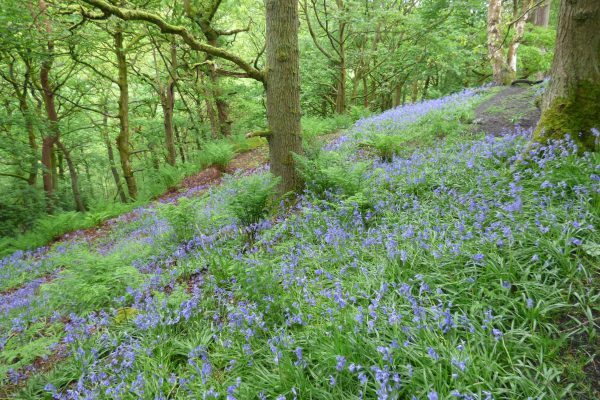 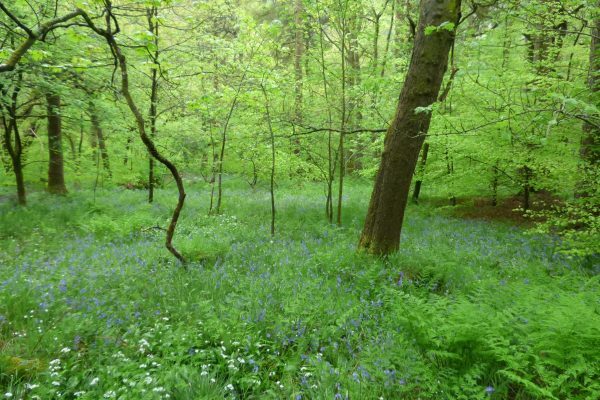 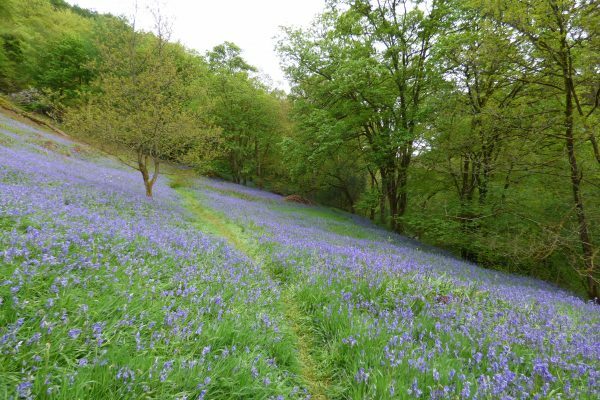 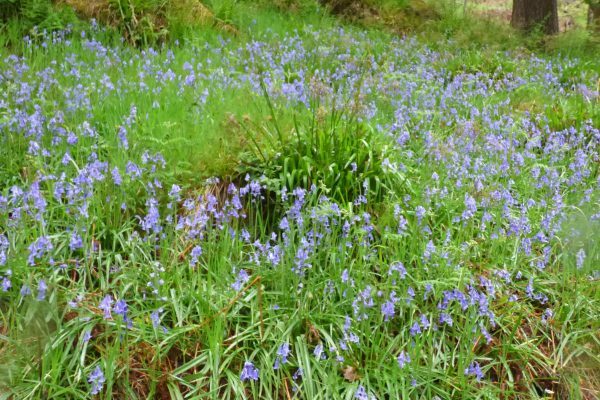 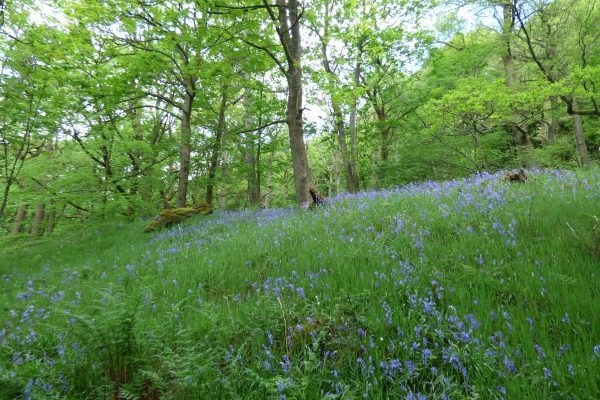 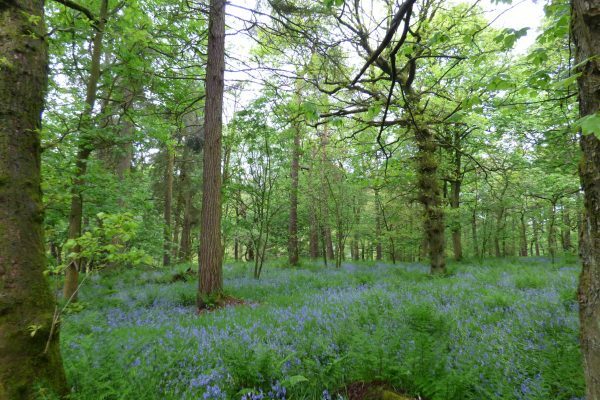 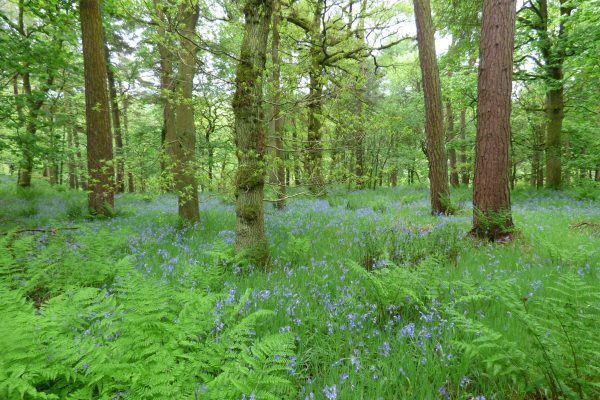 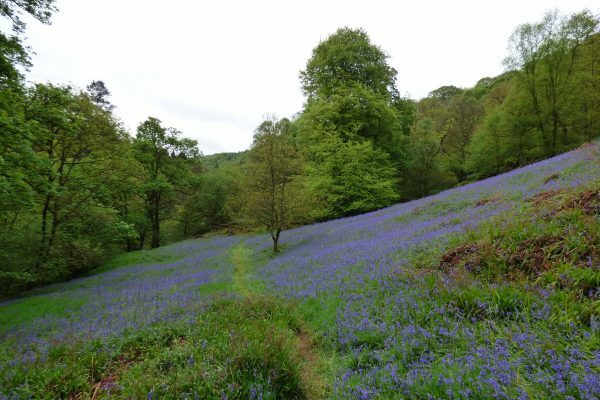 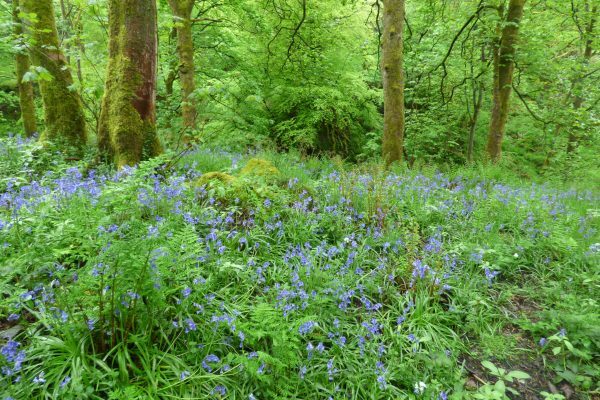 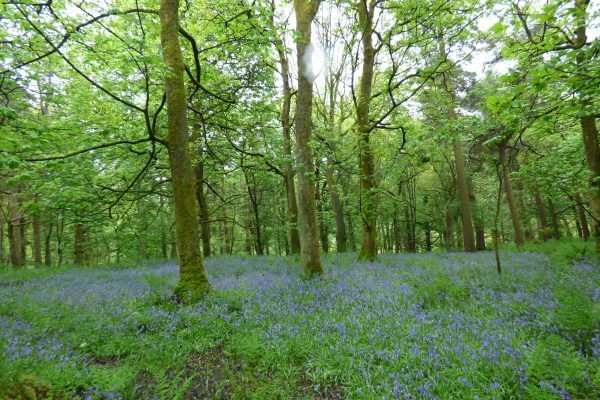 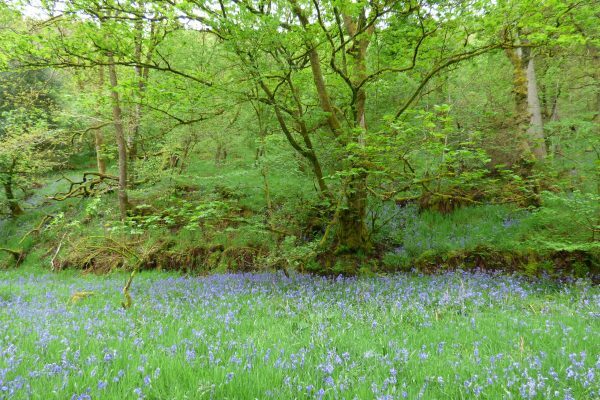 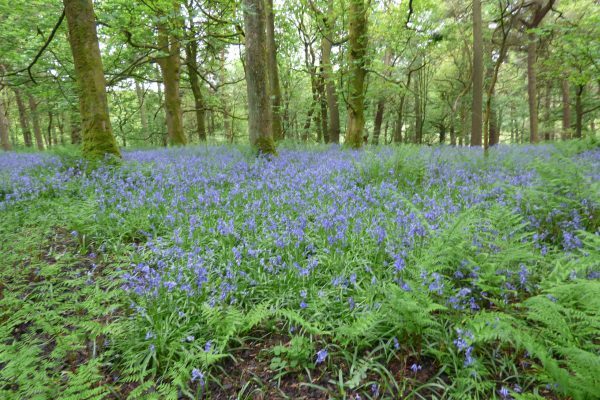 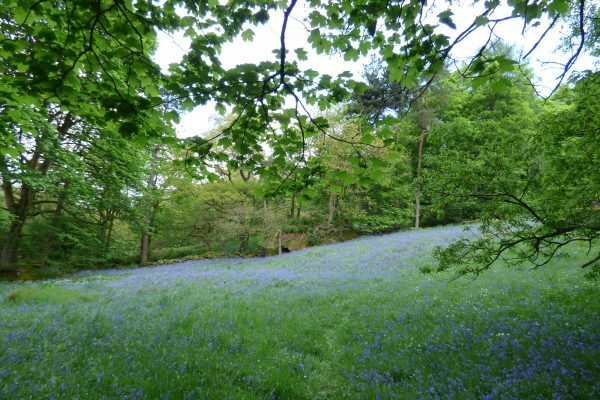 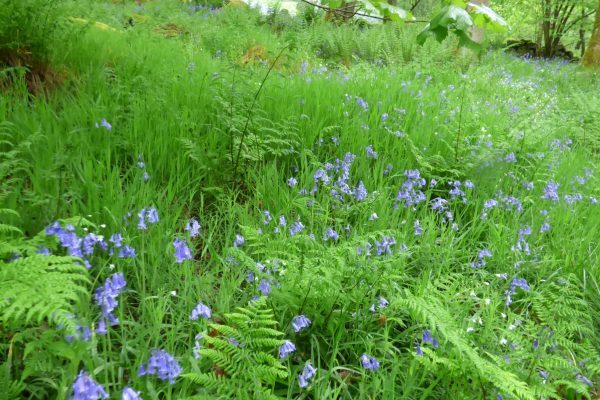 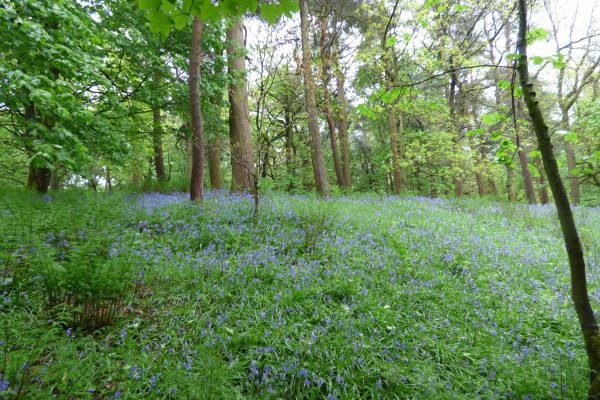 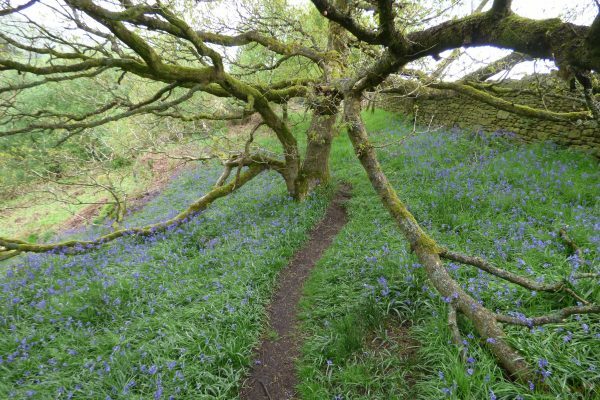 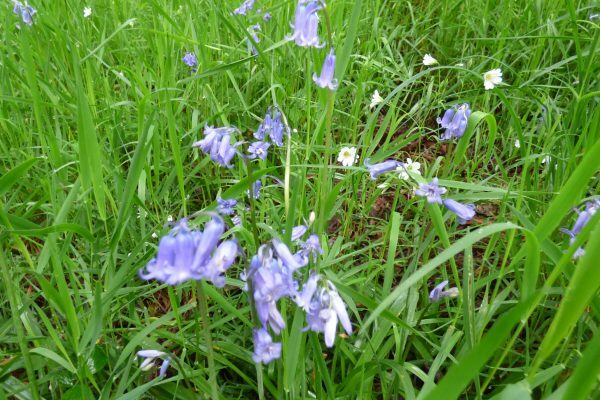 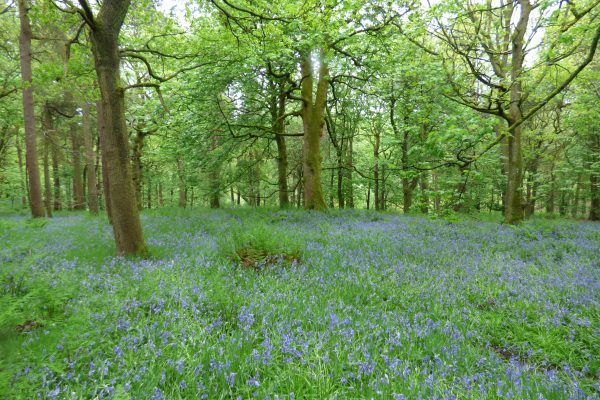 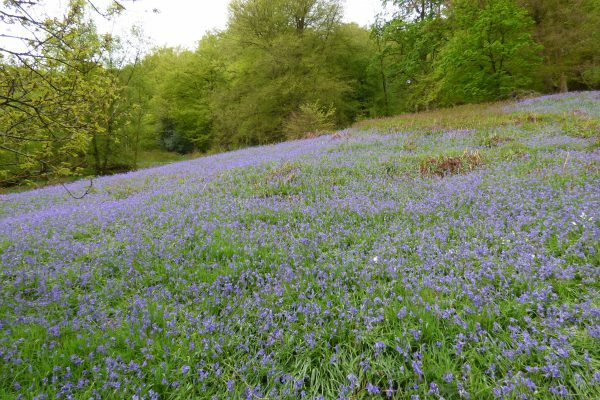 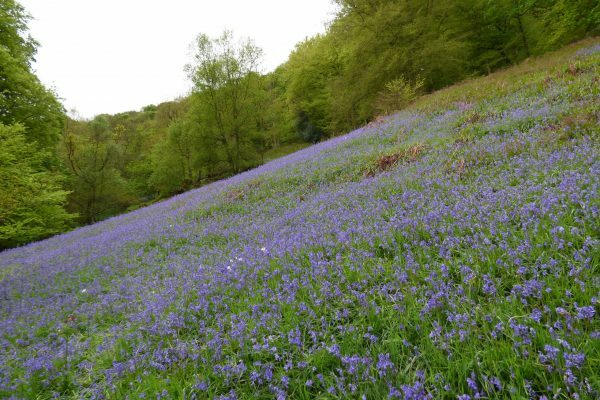 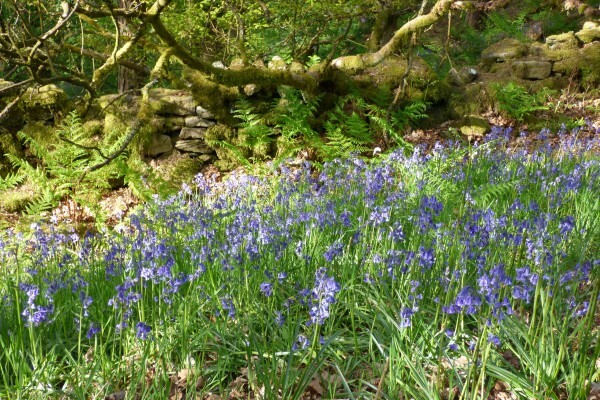 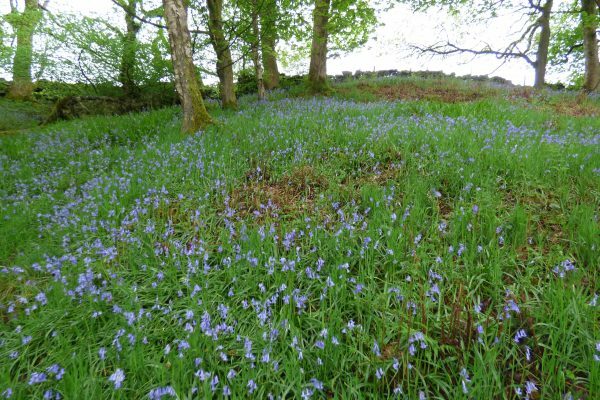 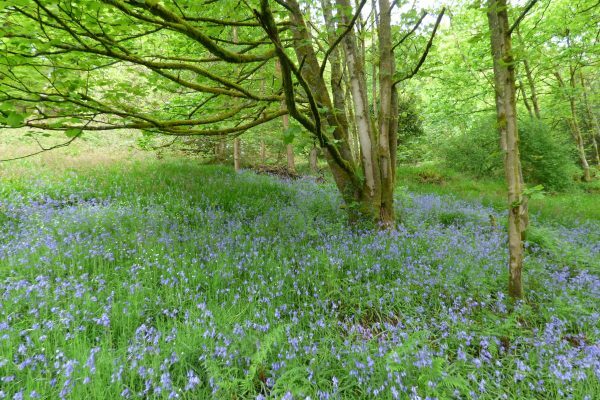 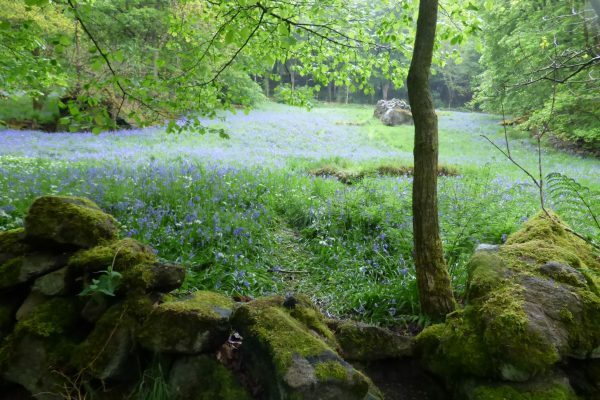 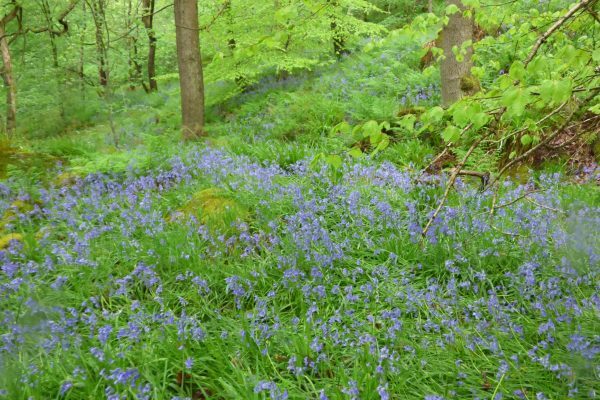 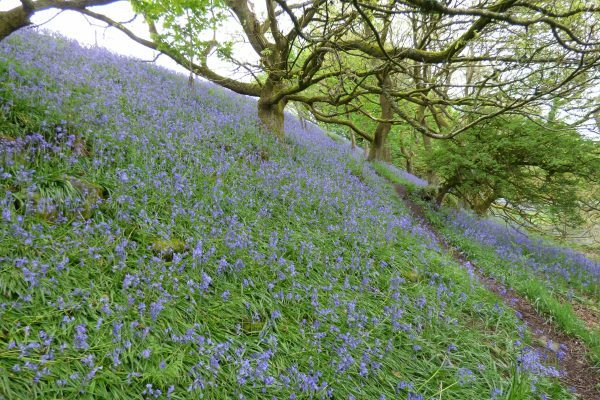 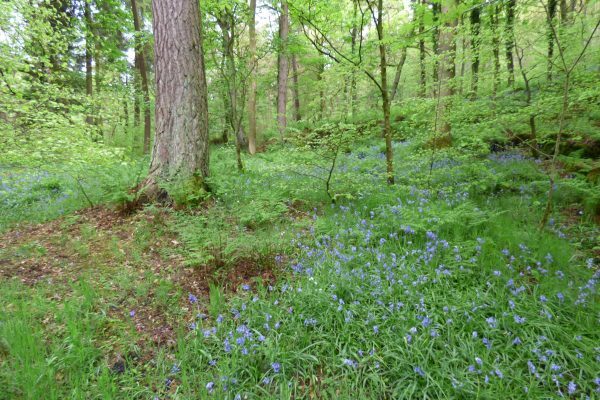 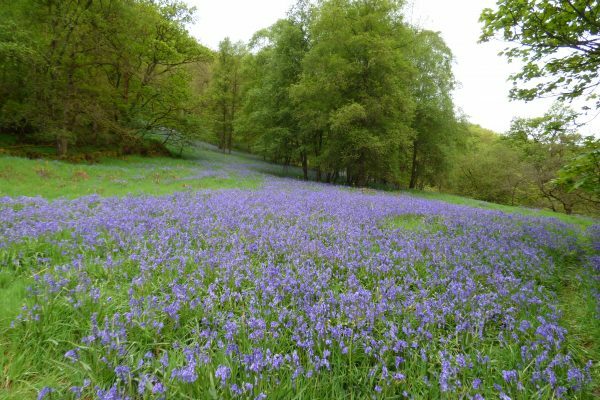 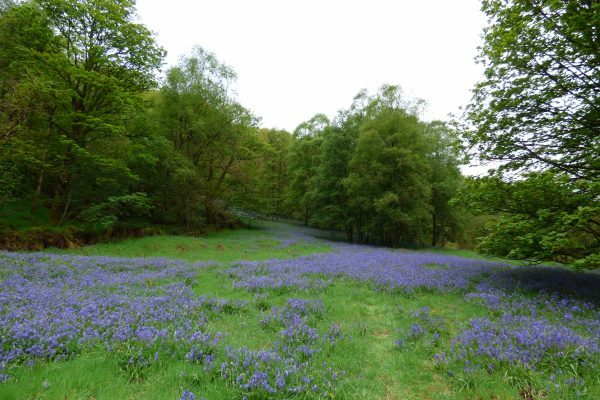 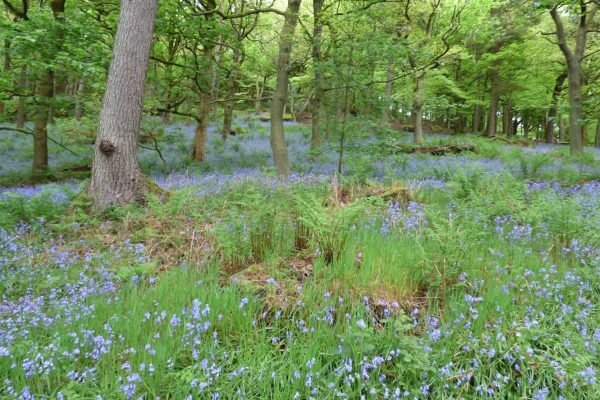 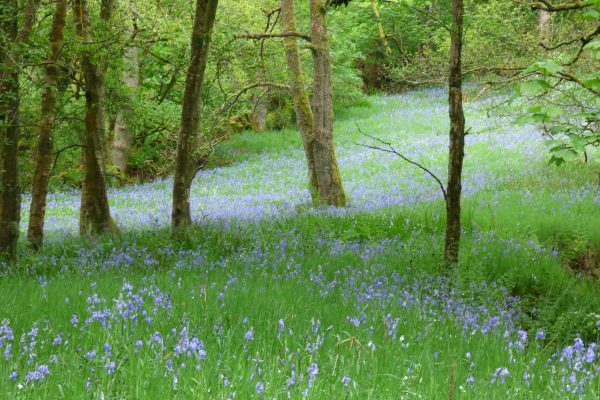 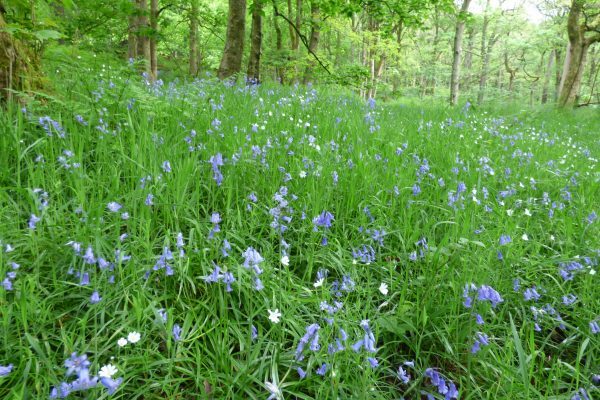 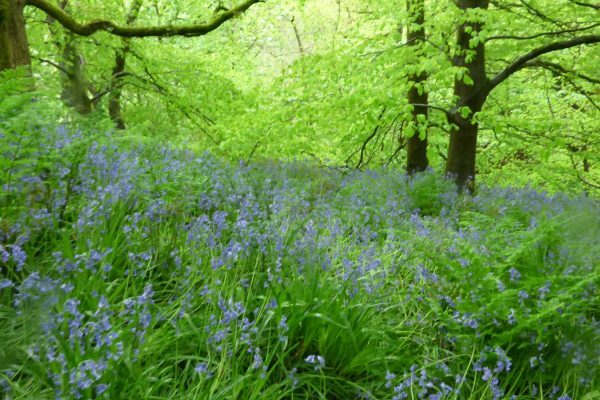 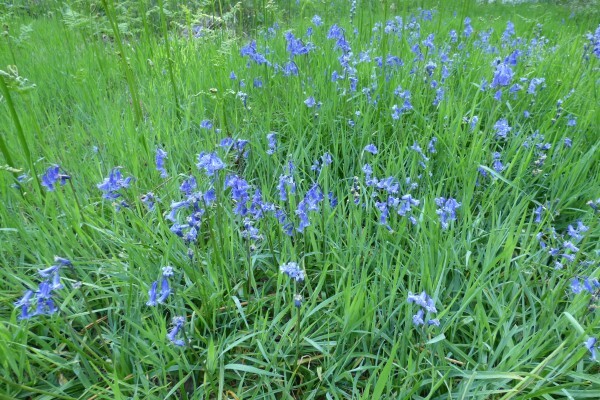 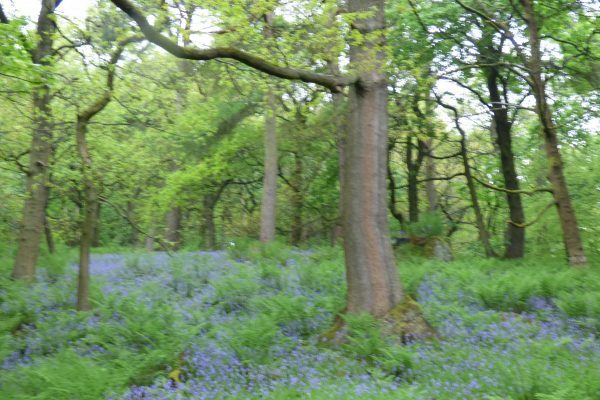 In spring the ground is carpeted with bluebells. 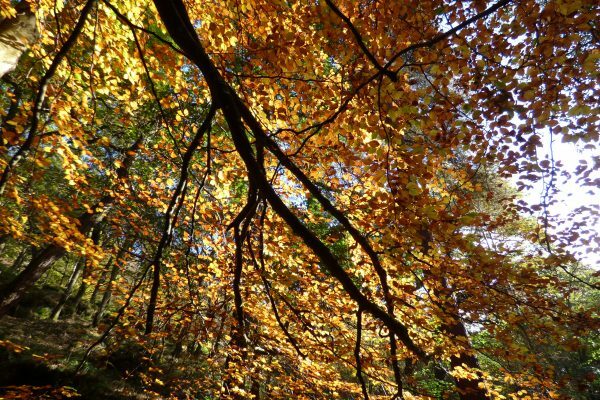 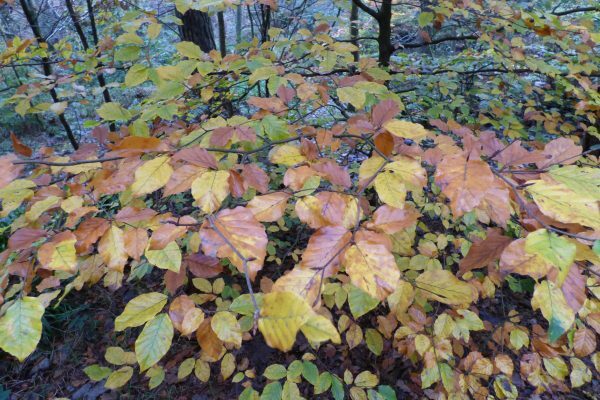 In summer the trees provide a lush green canopy, turning to gold in the autumn. 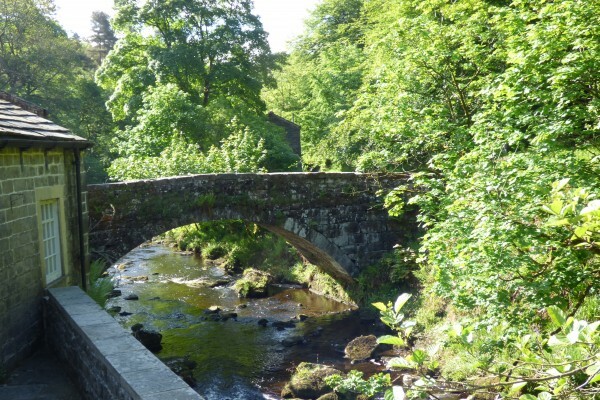 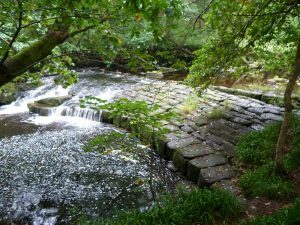 Footbridges criss-cross the river or you can hop across the water on stepping stones. 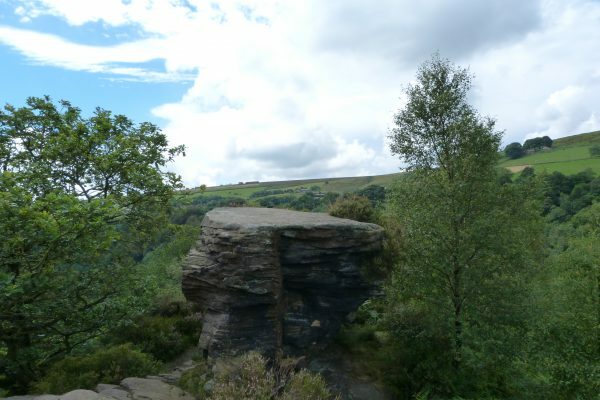 Picnic on the craggy rocks high above the trees. 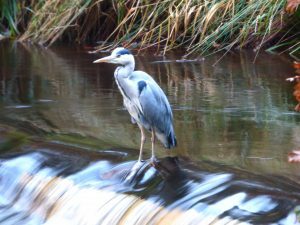 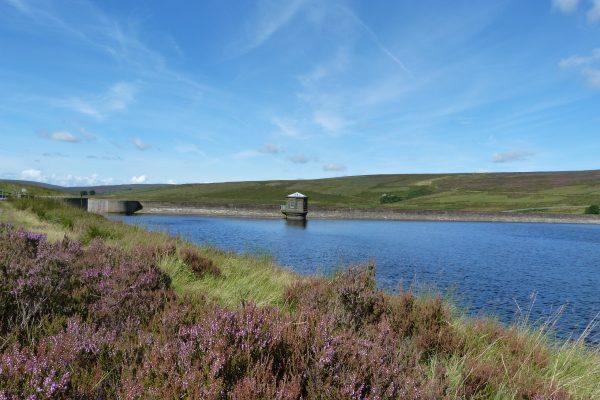 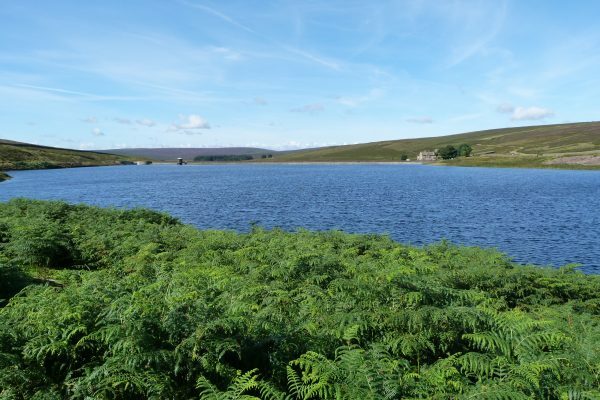 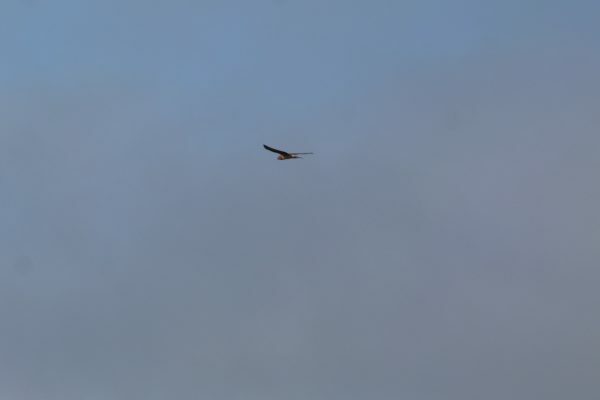 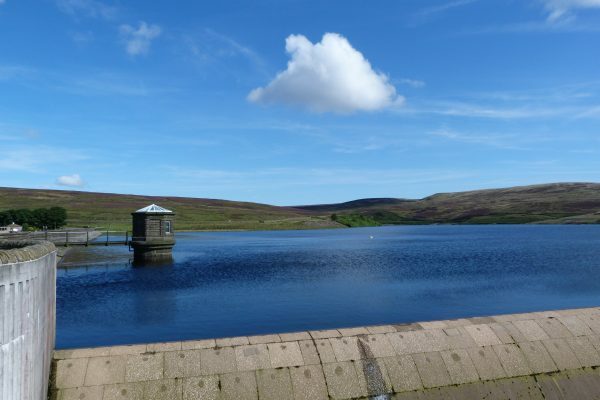 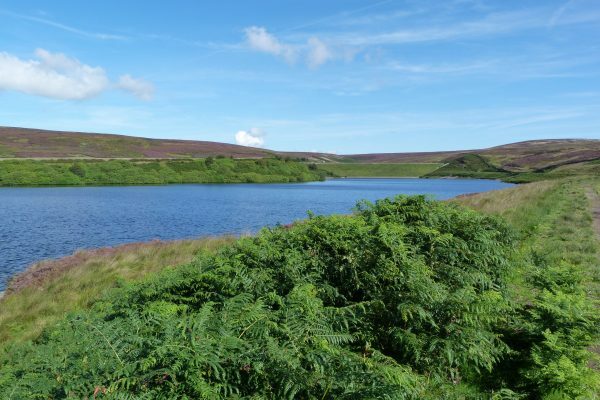 Watch herons fishing and dippers flitting from stone to stone on Hebden Water. 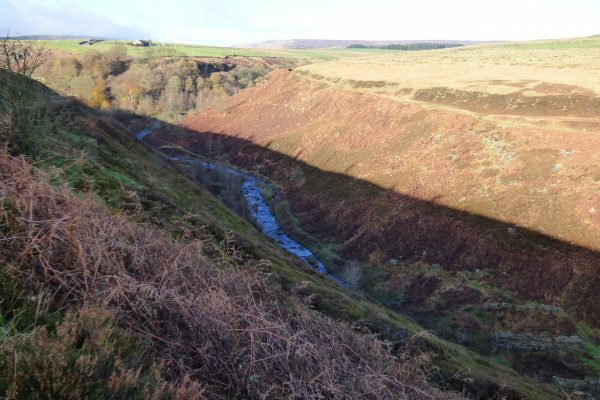 The narrow gorge-like valley houses a unique ecosystem. 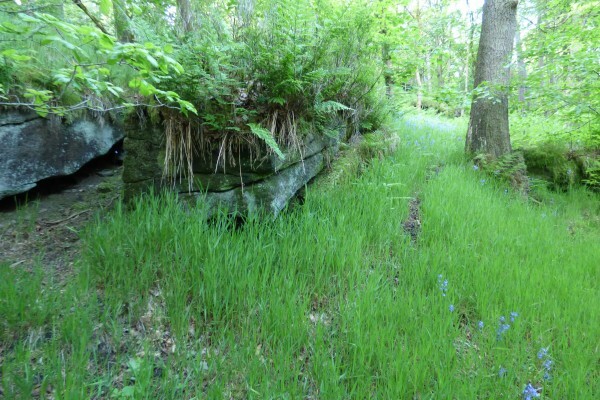 The woods are teaming with wildlife, literally so in the case of the Crags’ most famous residents, the giant hairy wood ants who build amazing mound-shaped nests several feet high. 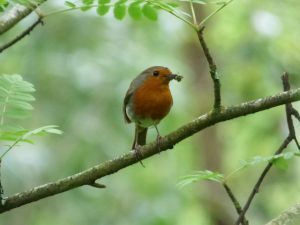 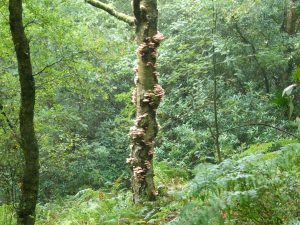 Listen out for woodpeckers and tawny owls and keep your eyes peeled for roe deer. 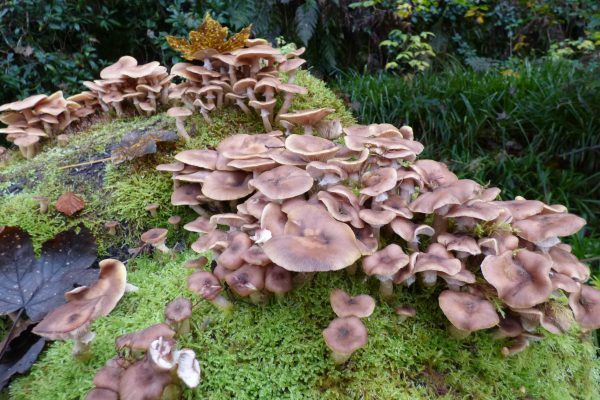 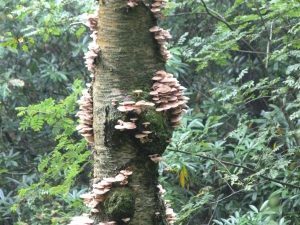 Hardcastle Crags is internationally famous for its fungi, which sprouts up all over the woods each autumn. 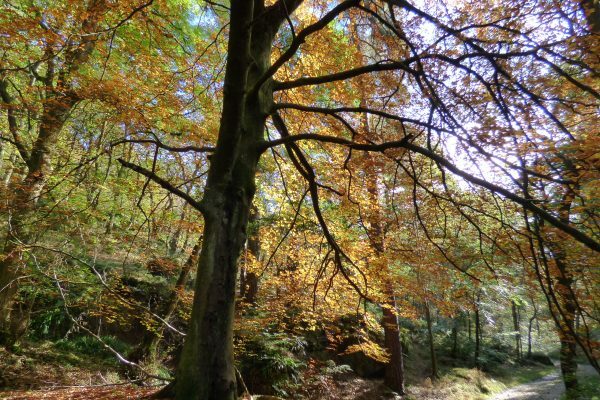 In October the trees turn glorious shades of russet and gold. 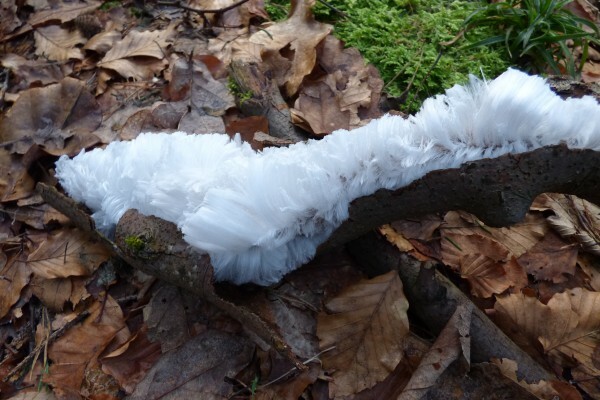 During the winter, there are gushing waterfalls and, if the weather turns frosty, icicle grottoes on the rocky riverbank cliffs. 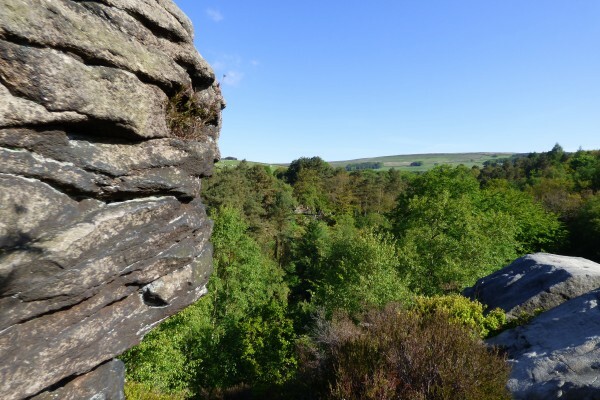 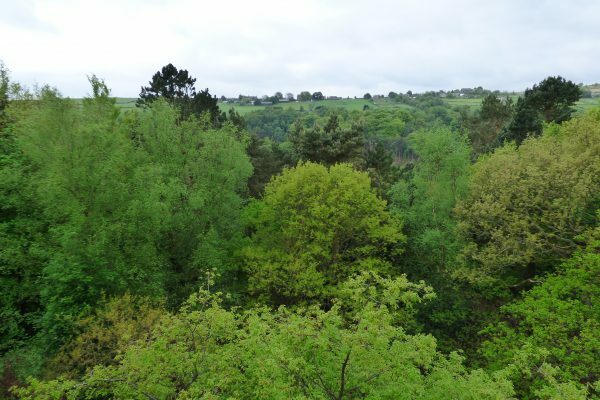 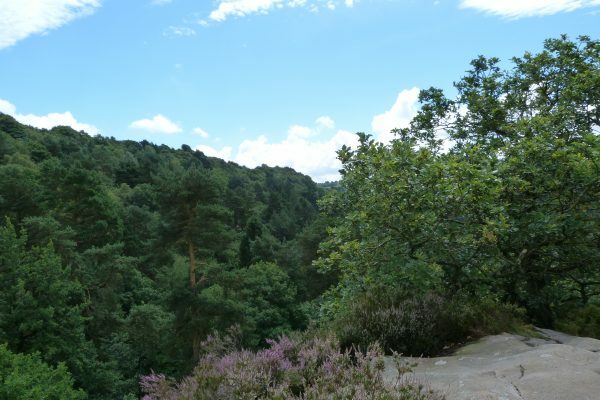 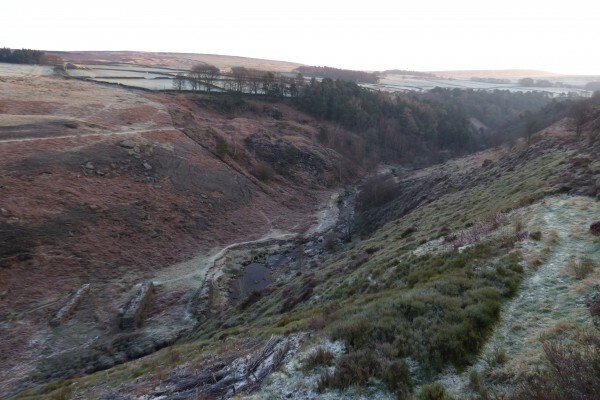 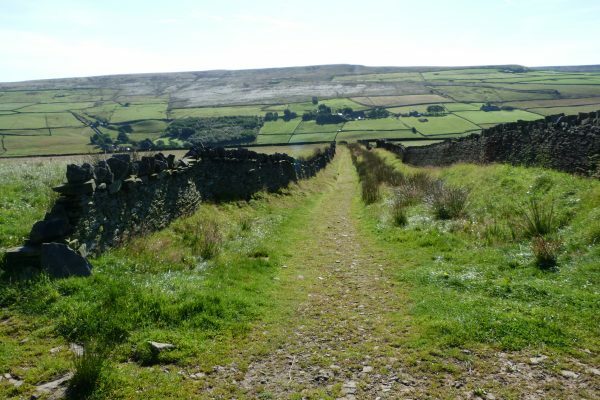 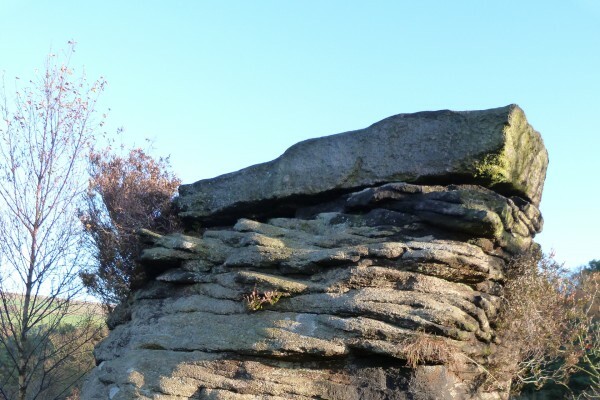 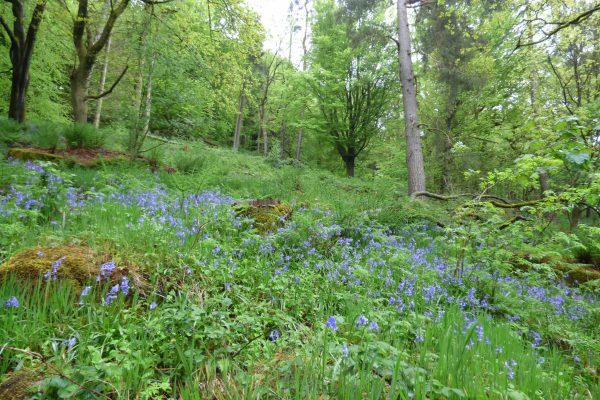 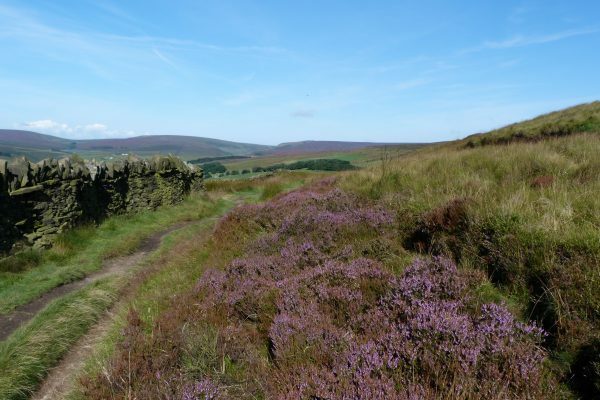 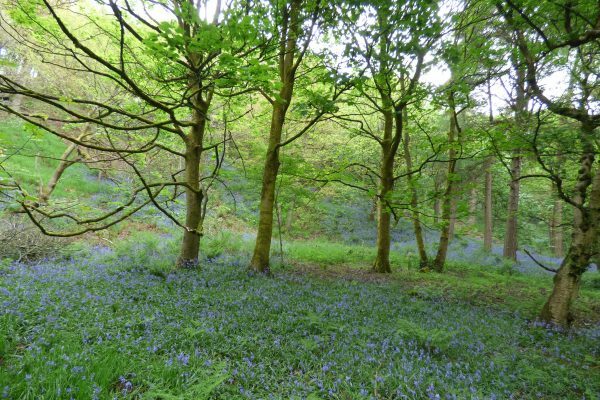 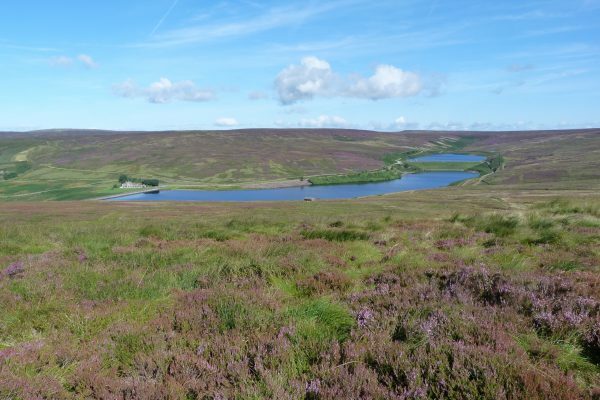 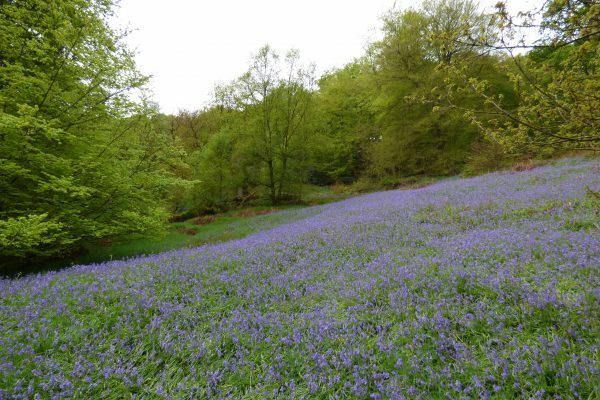 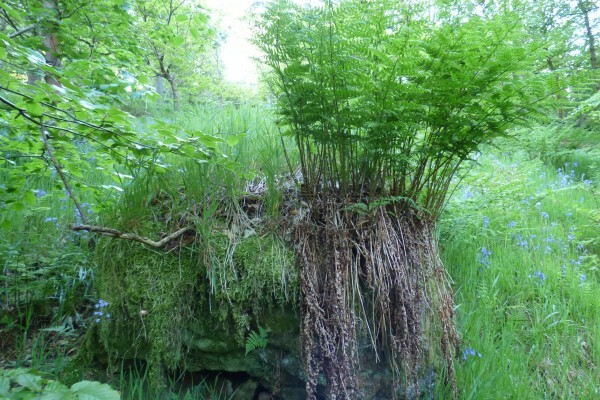 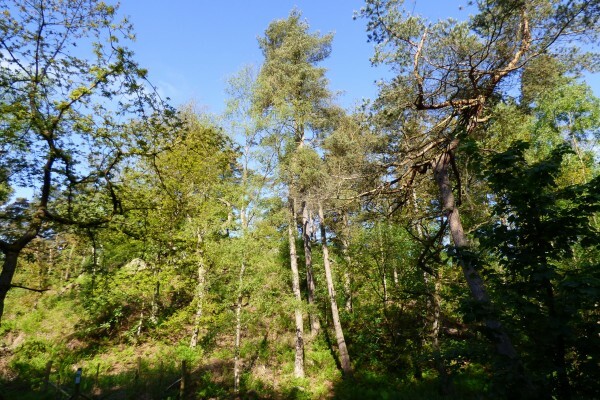 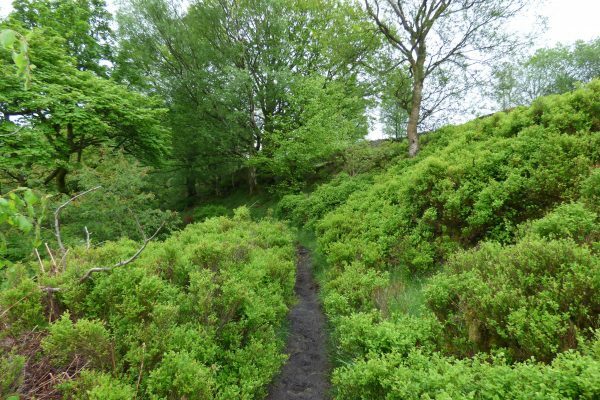 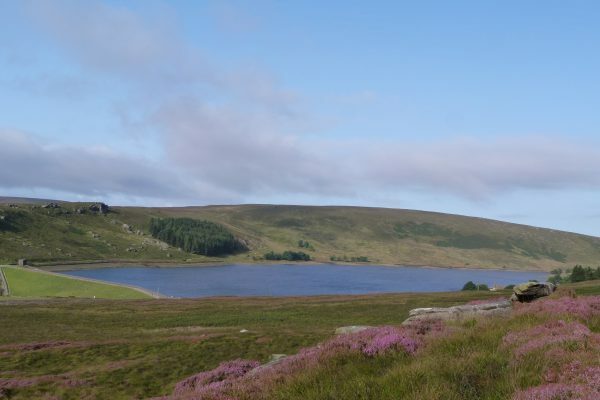 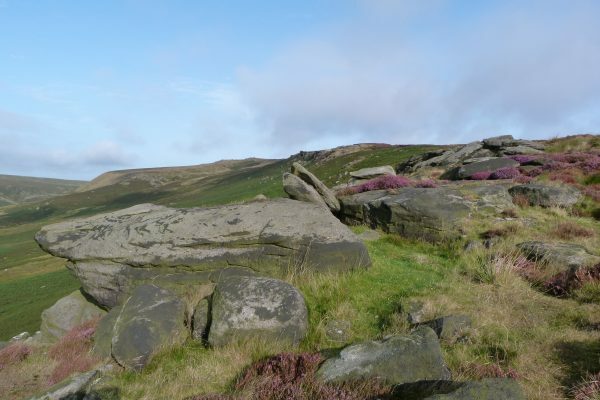 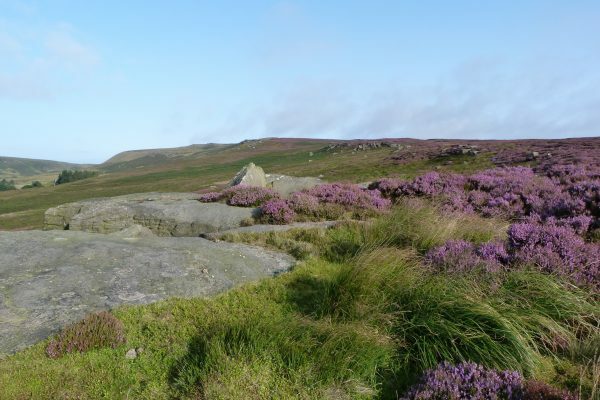 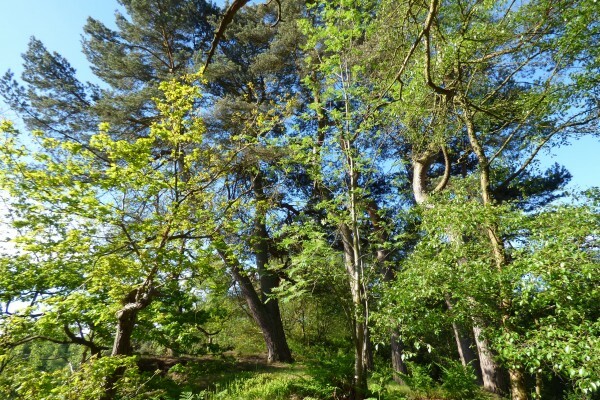 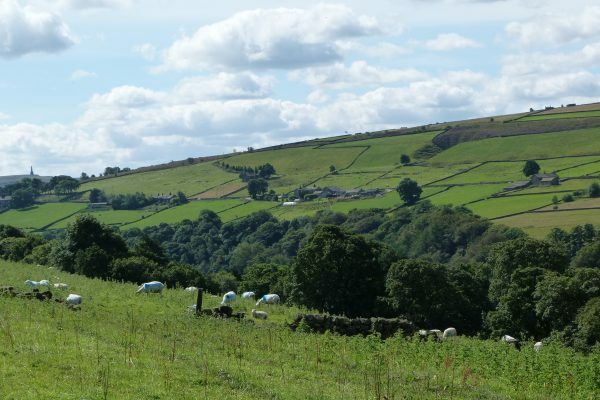 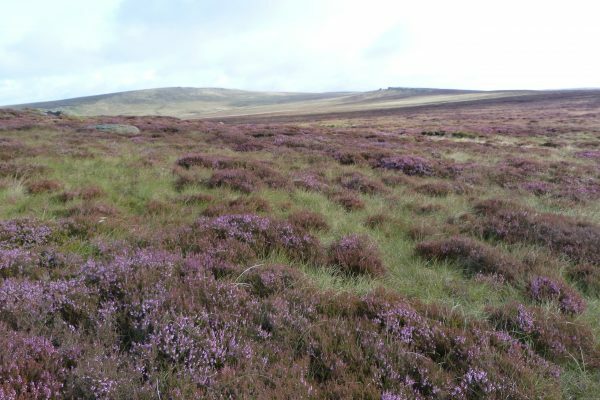 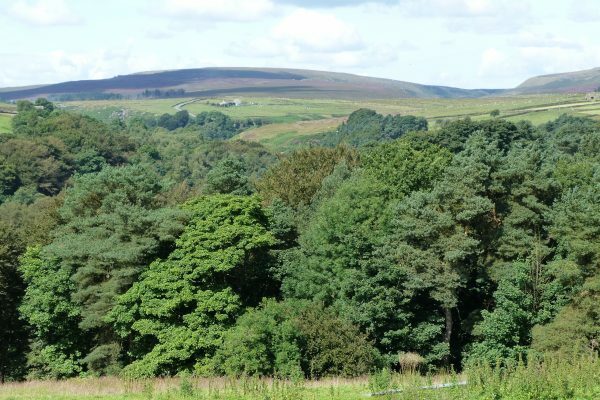 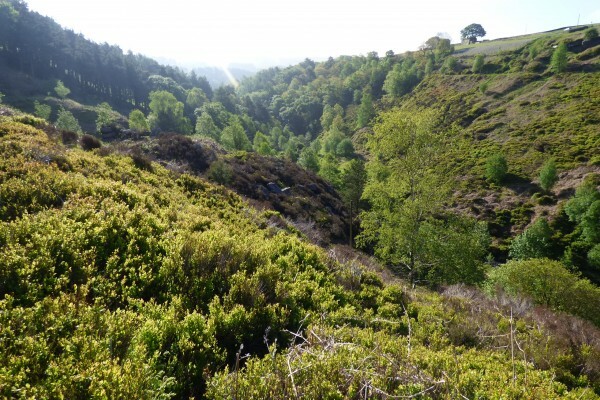 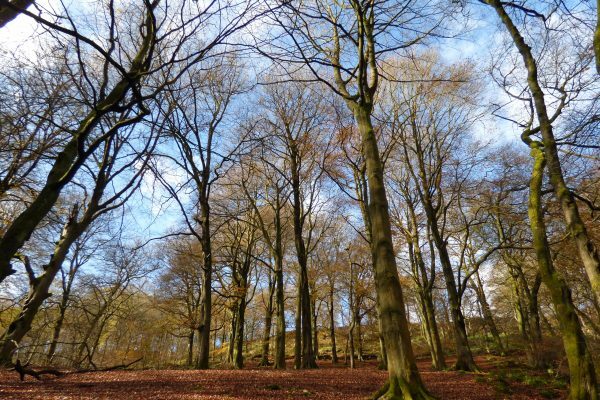 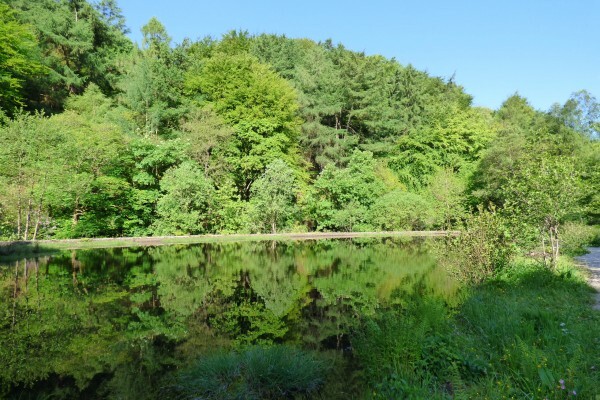 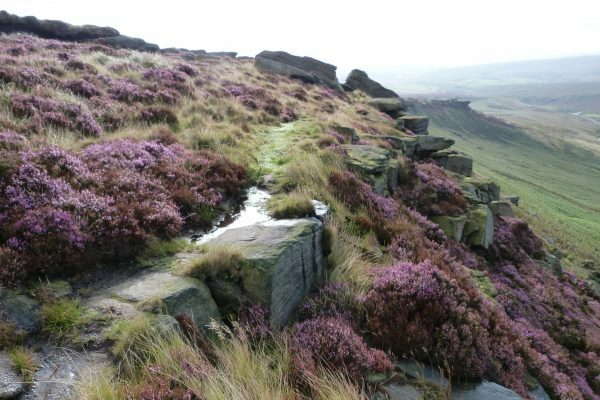 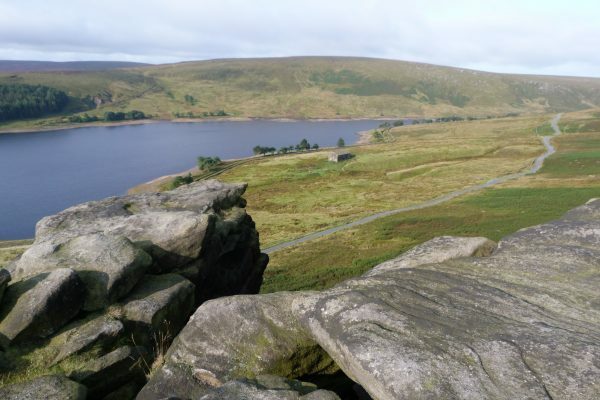 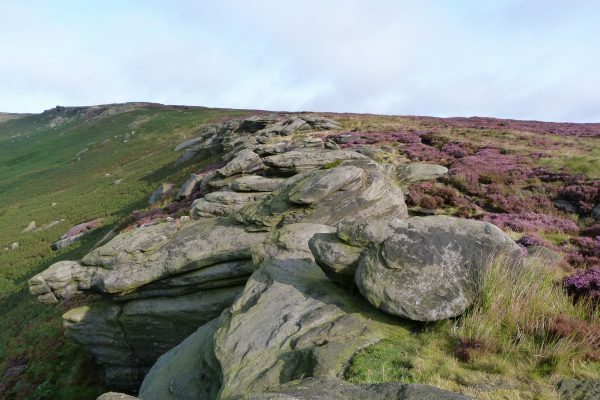 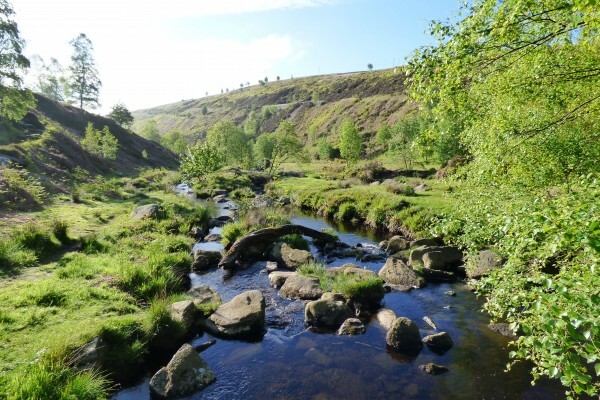 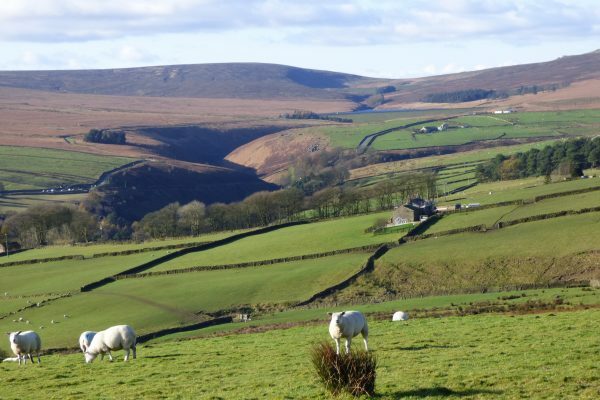 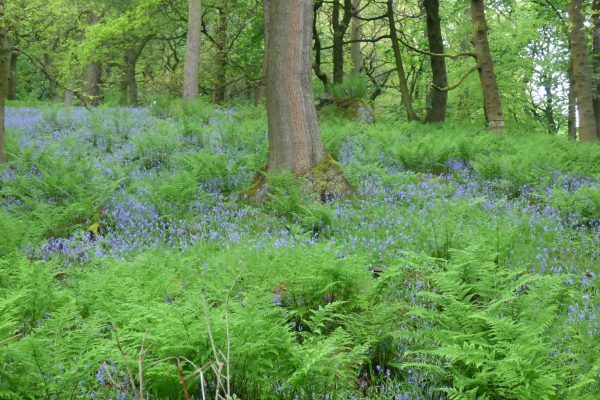 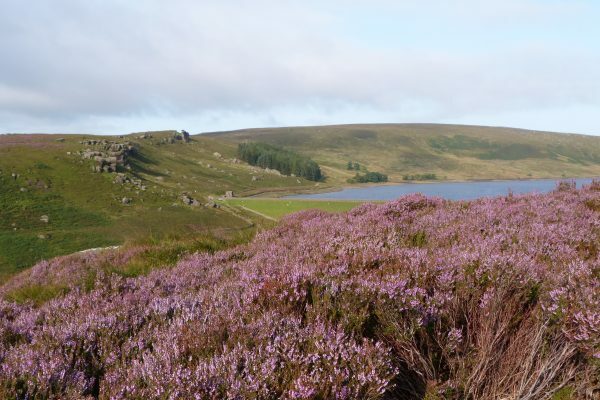 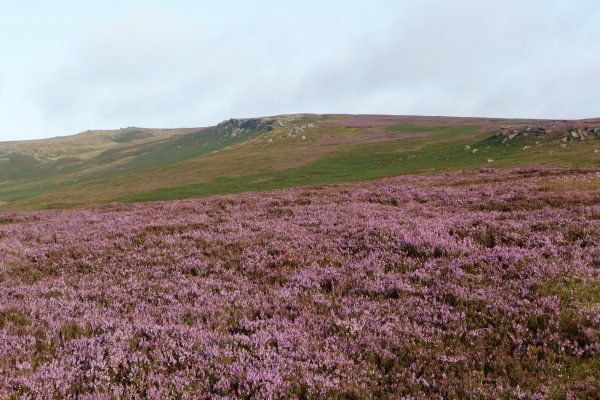 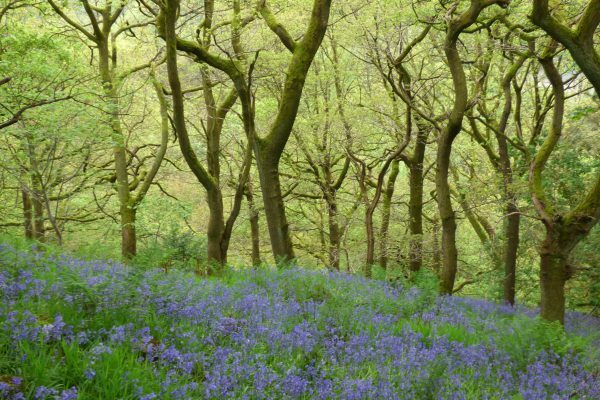 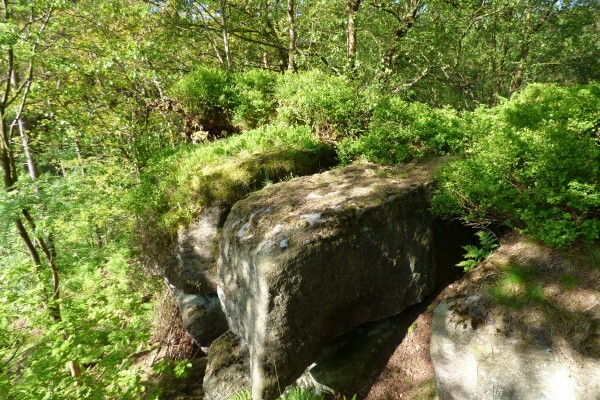 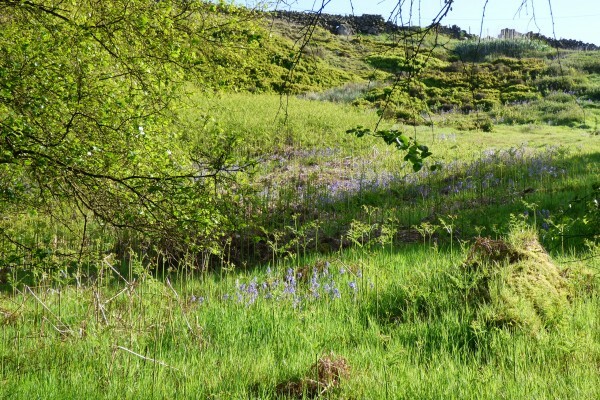 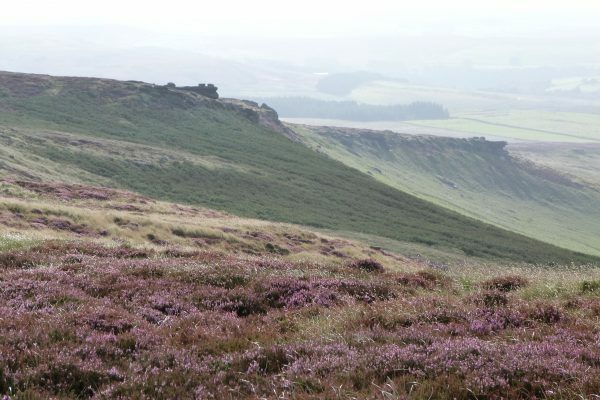 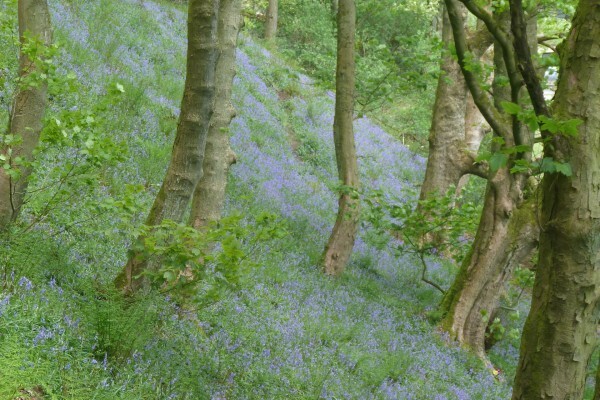 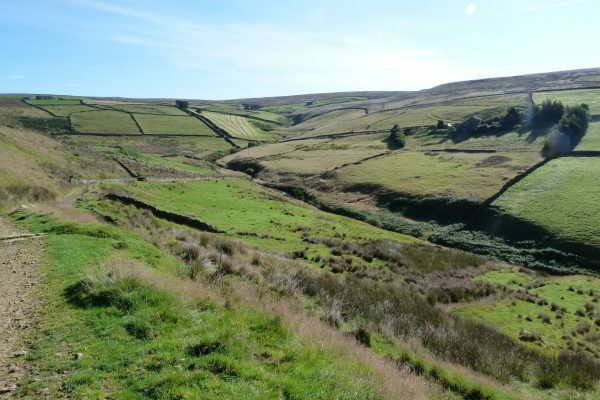 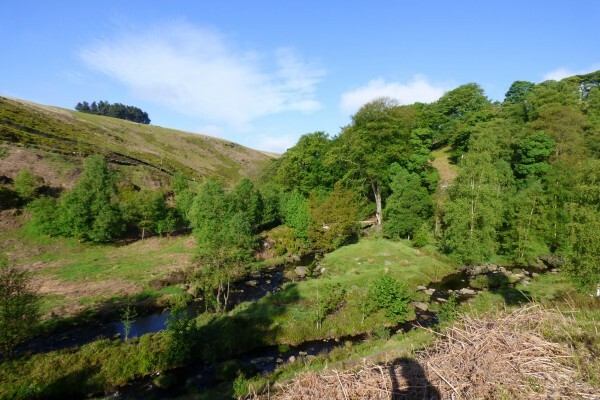 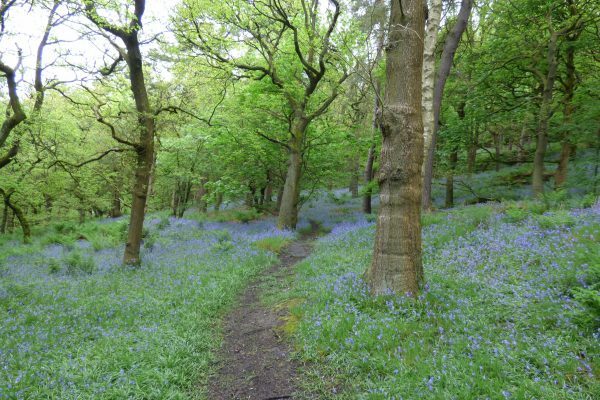 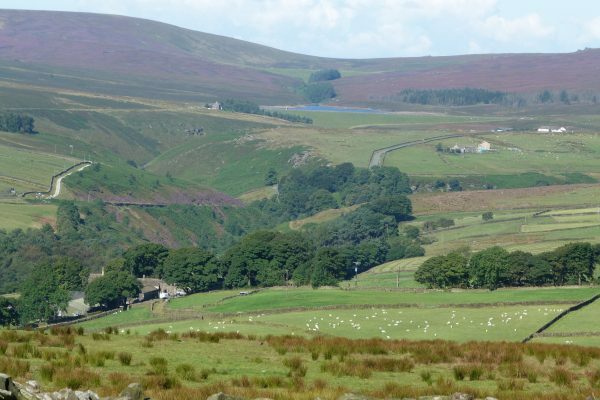 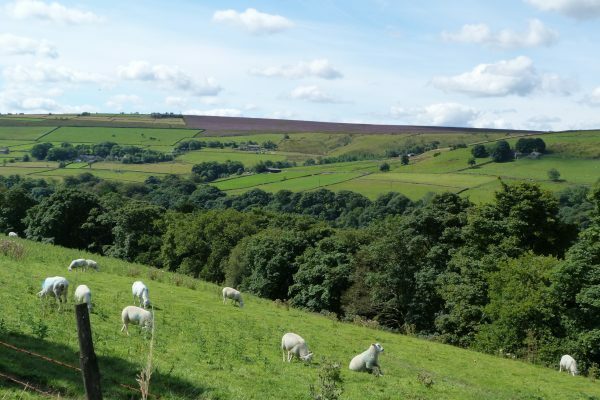 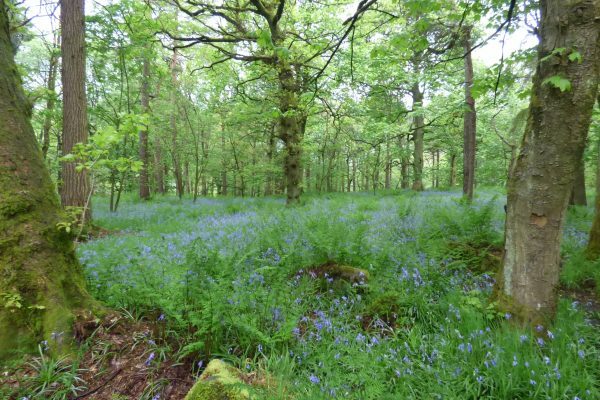 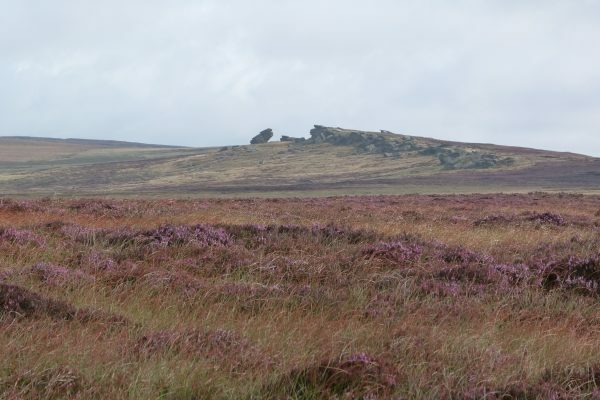 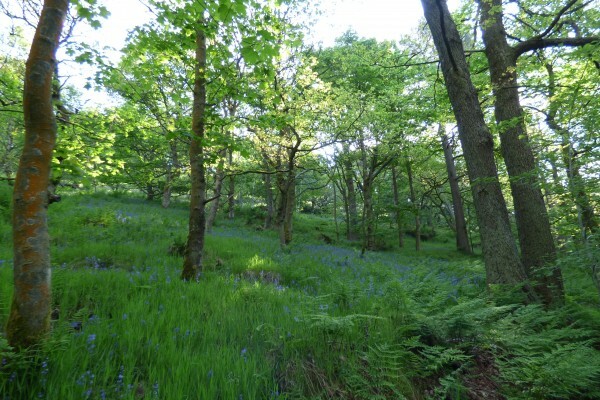 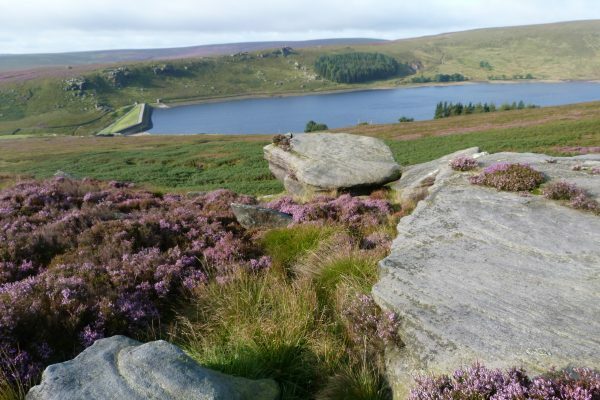 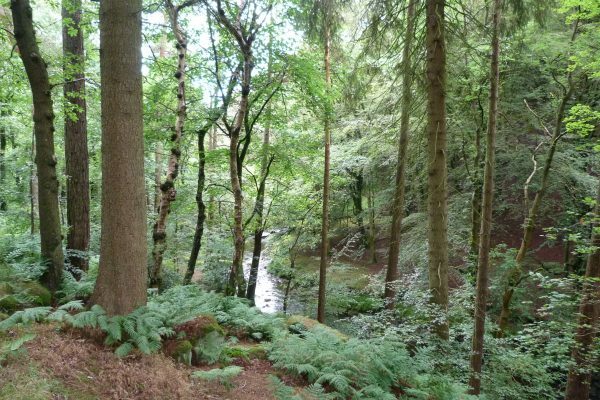 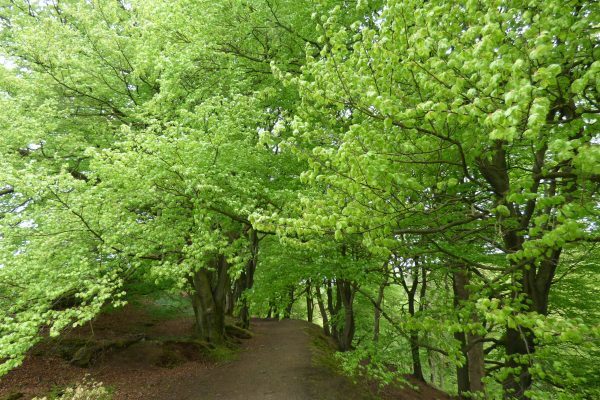 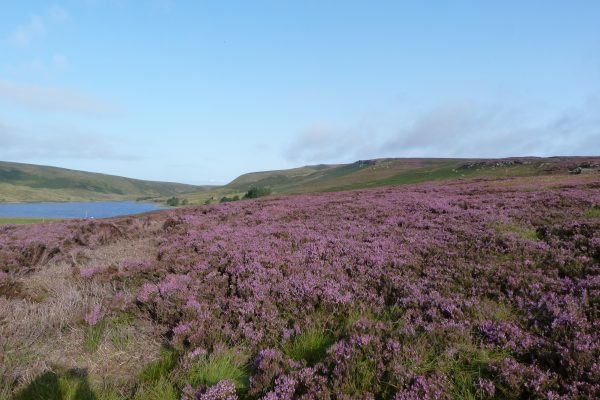 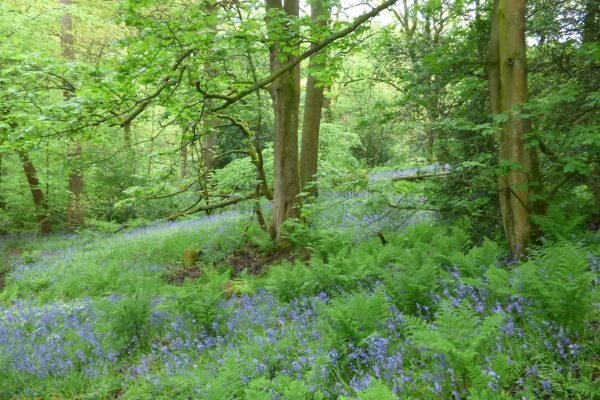 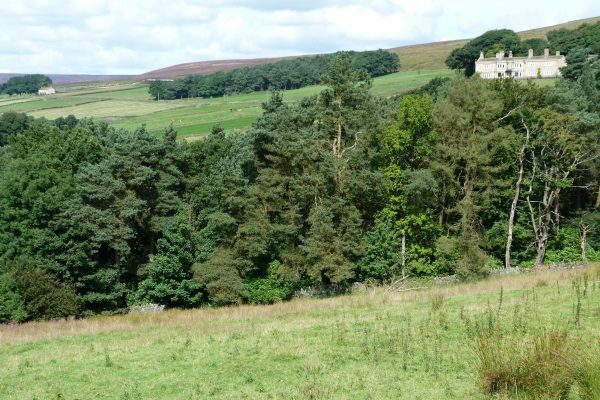 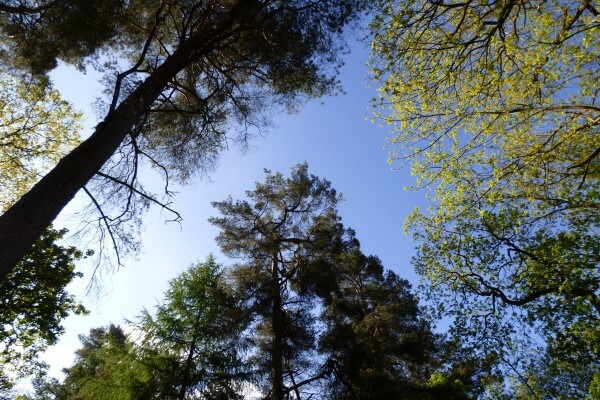 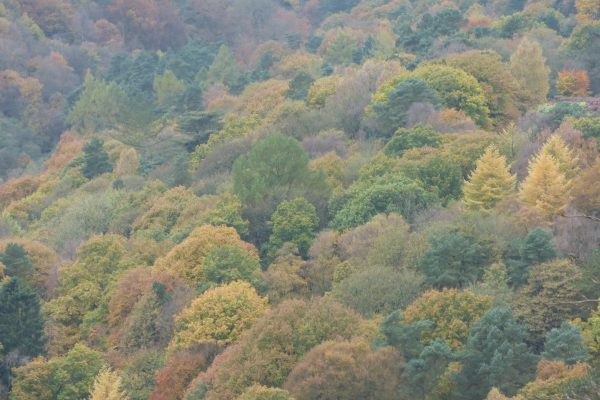 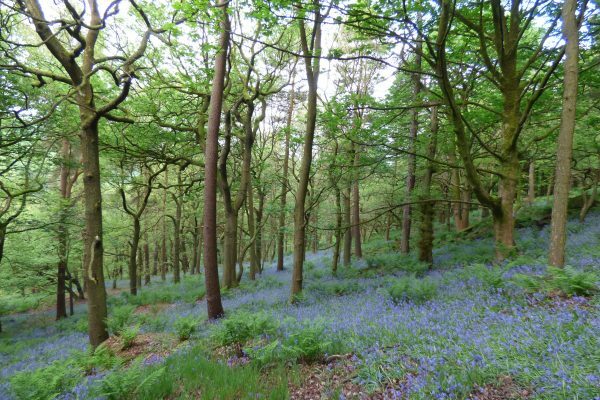 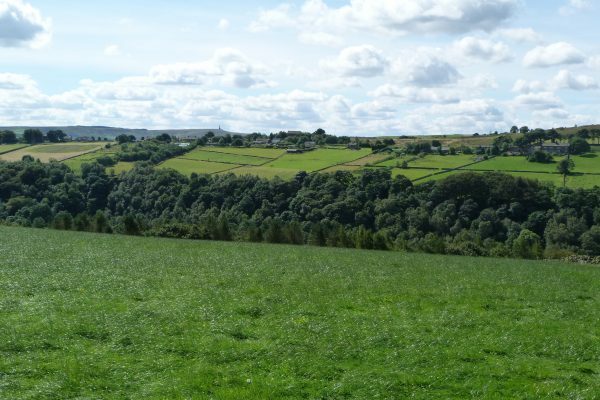 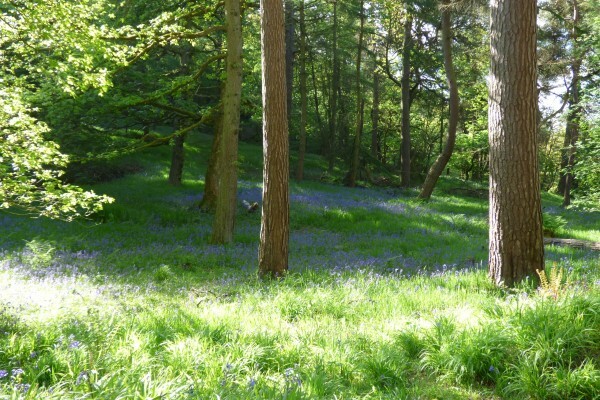 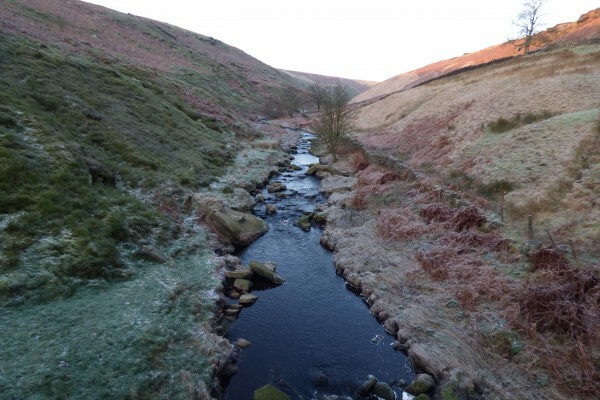 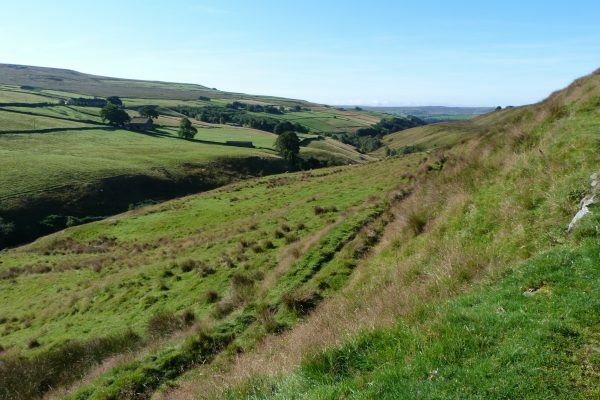 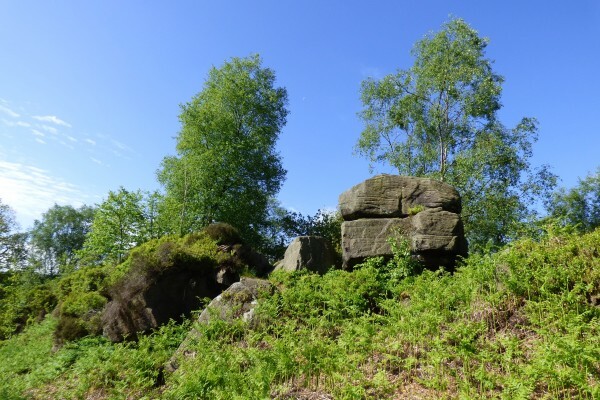 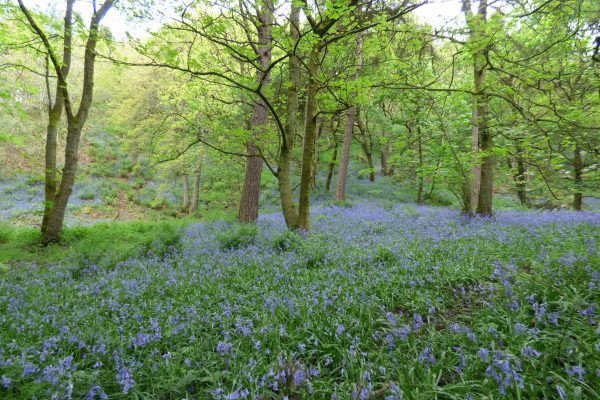 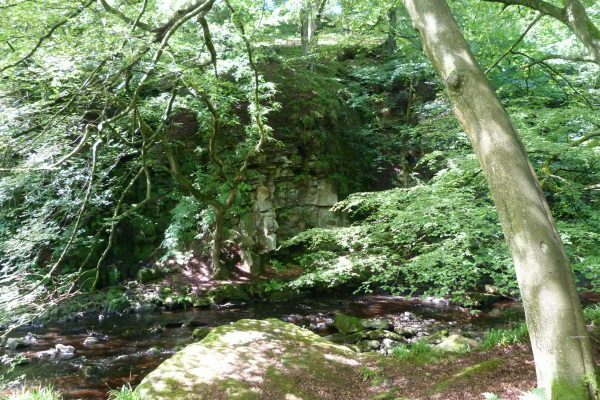 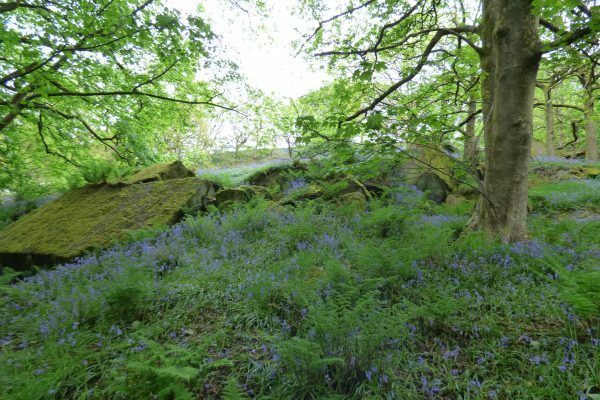 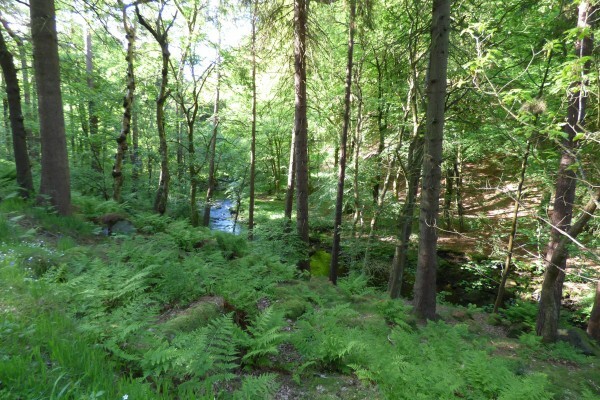 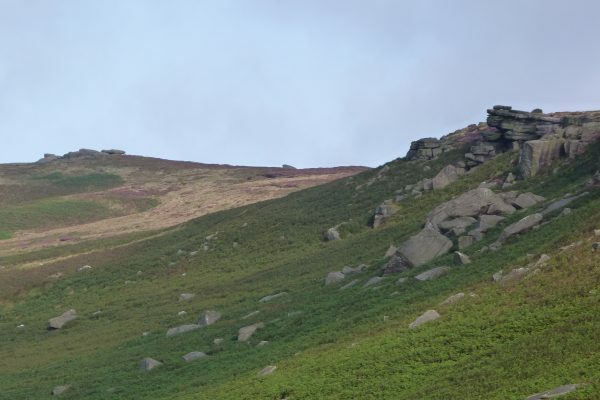 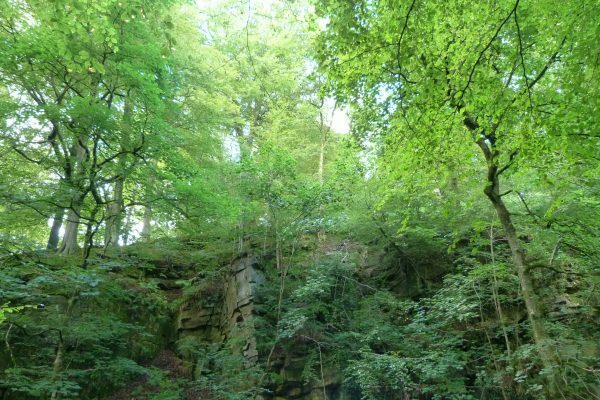 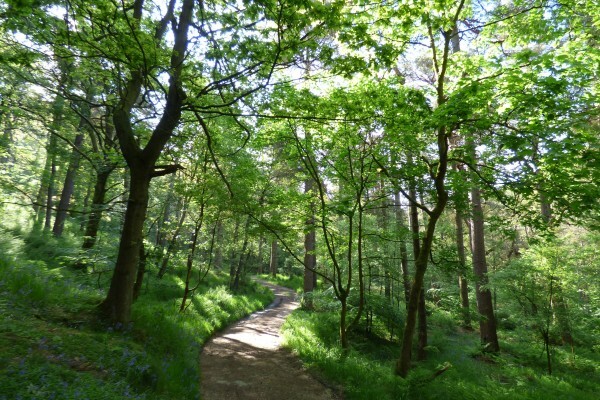 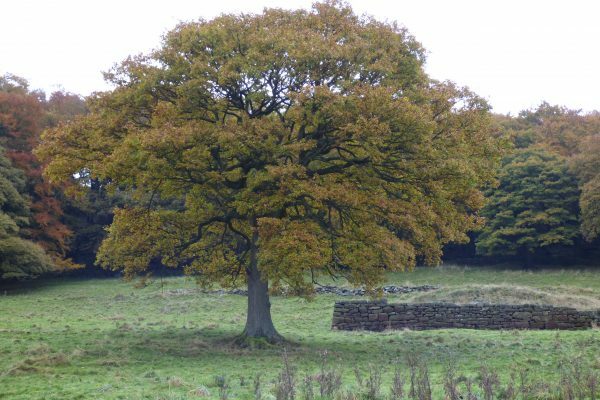 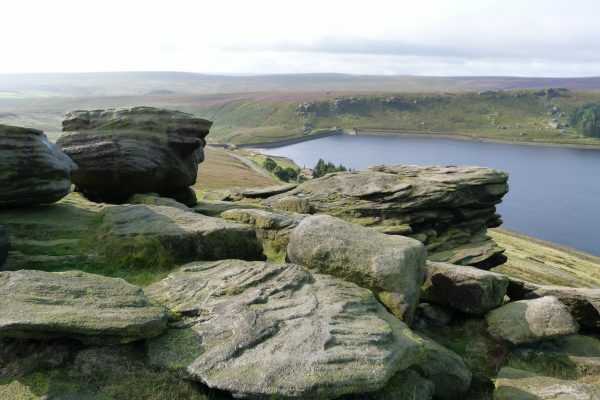 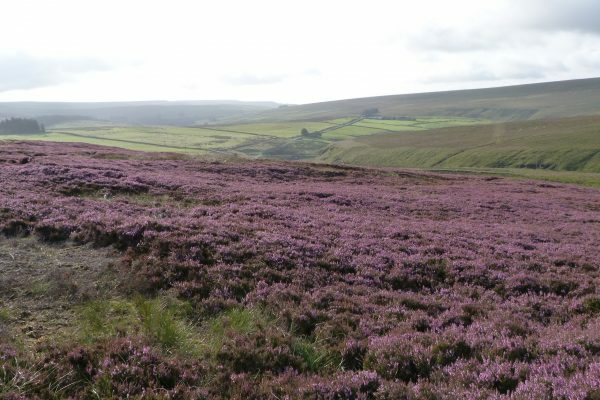 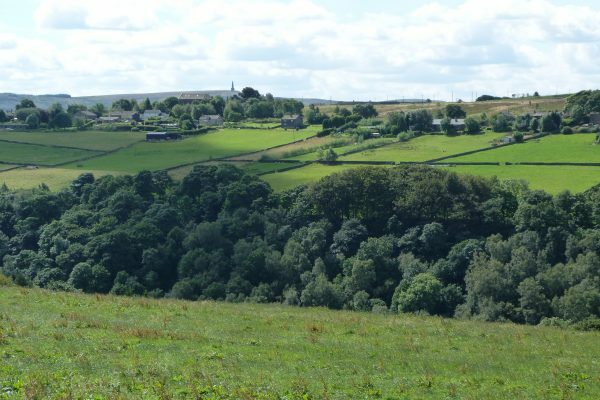 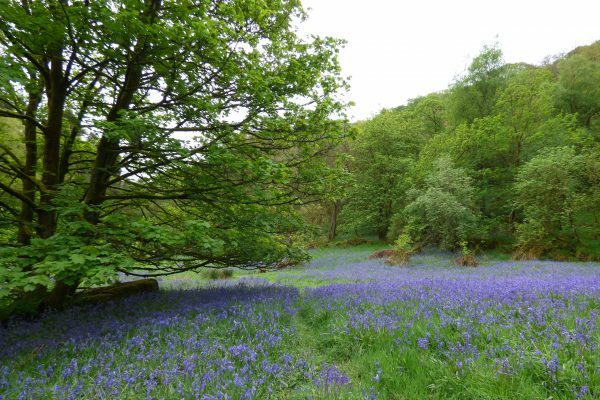 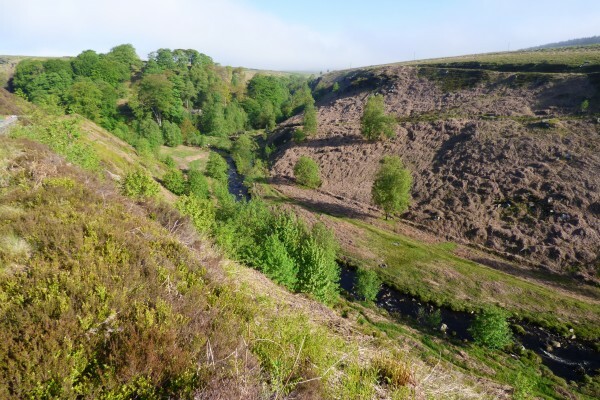 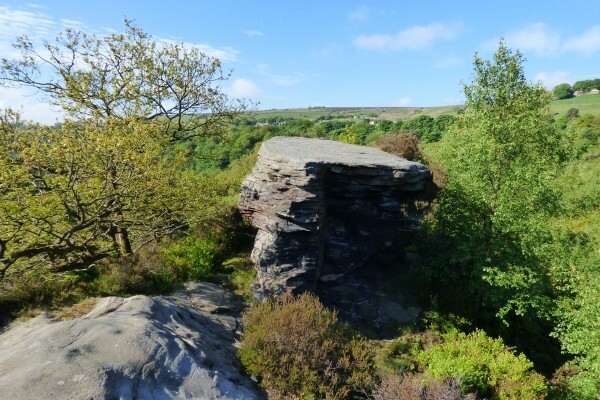 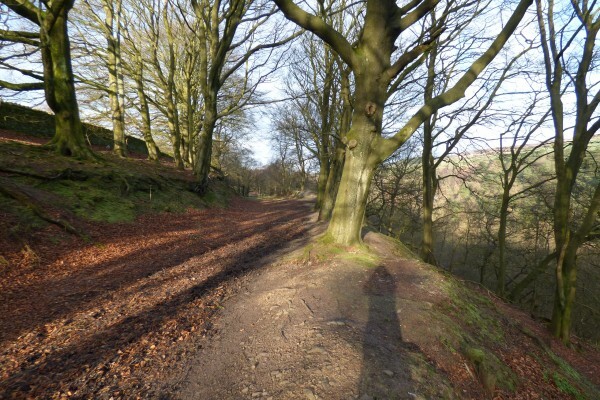 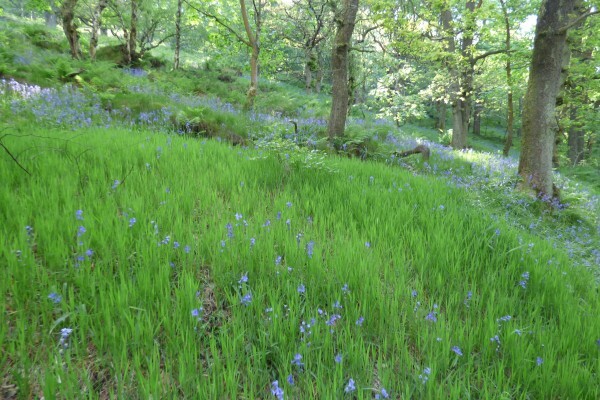 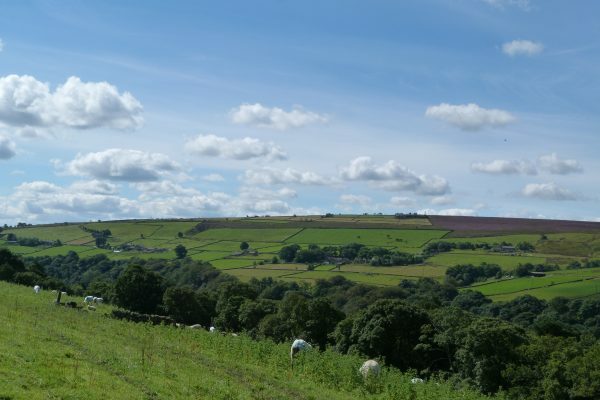 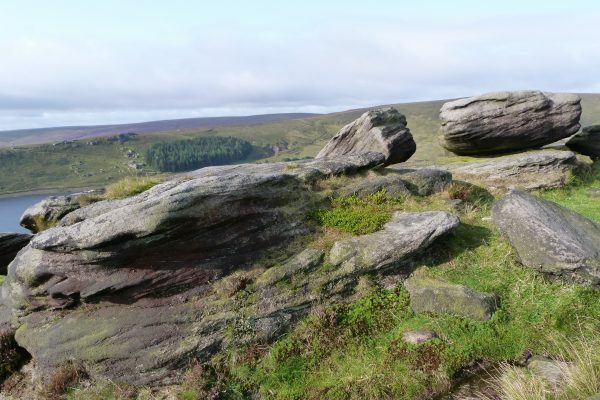 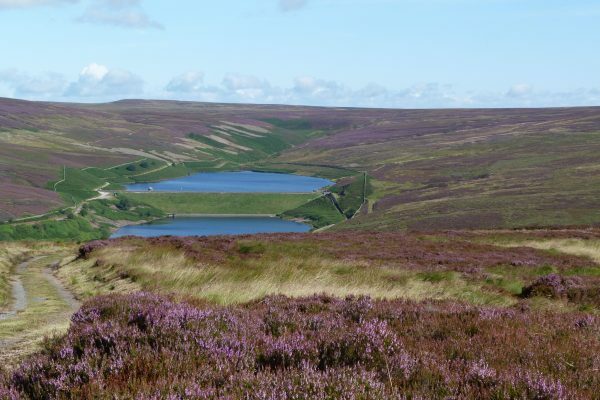 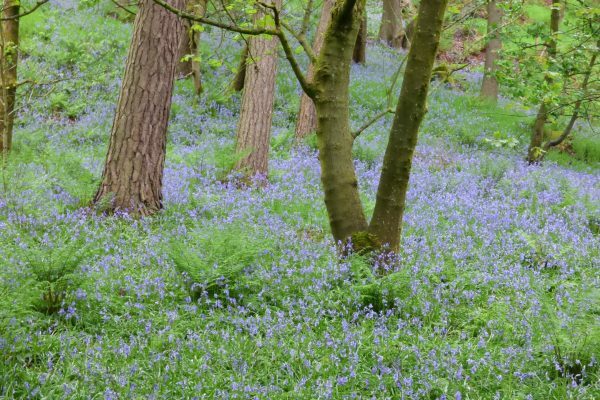 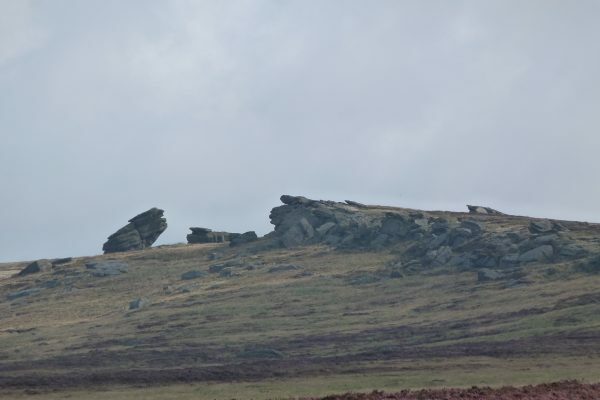 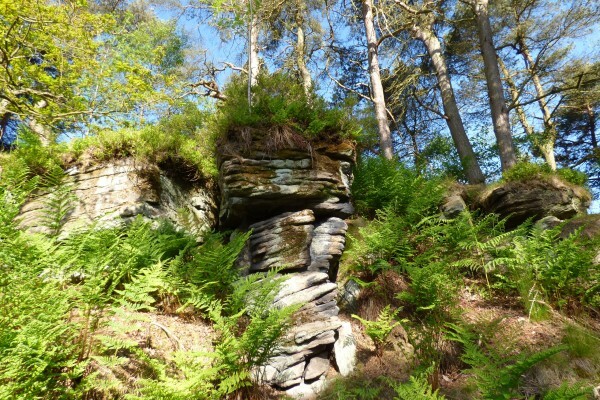 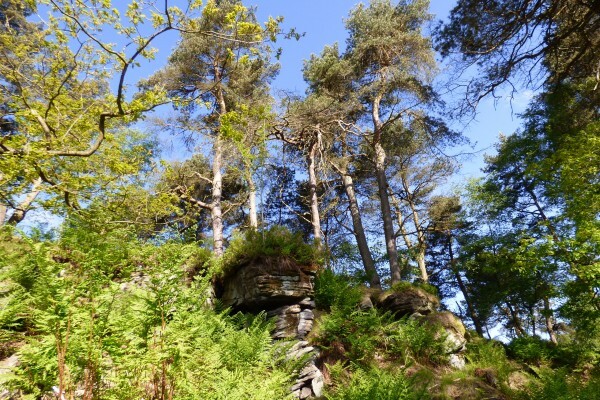 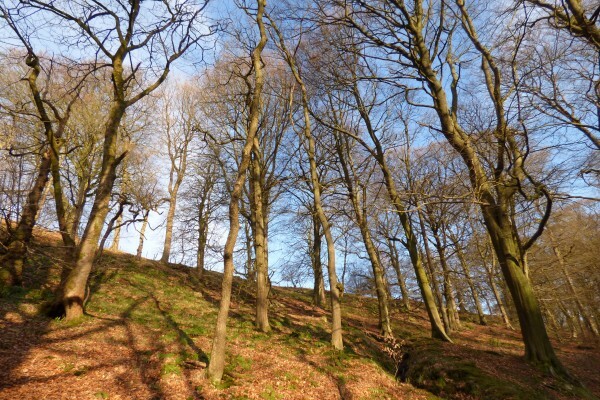 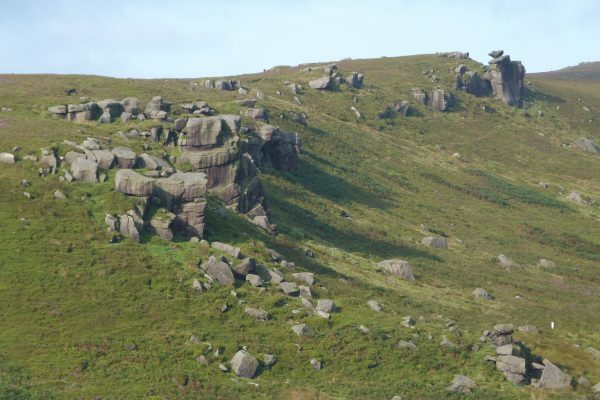 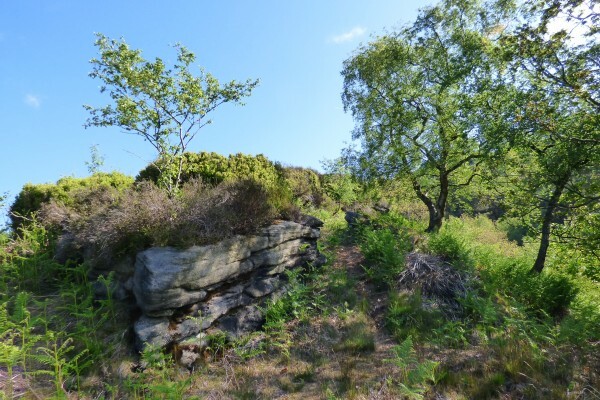 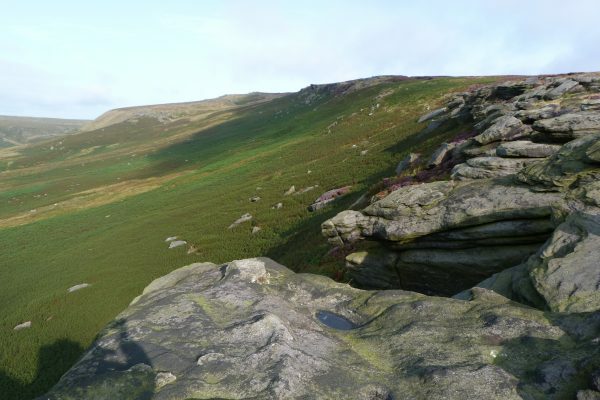 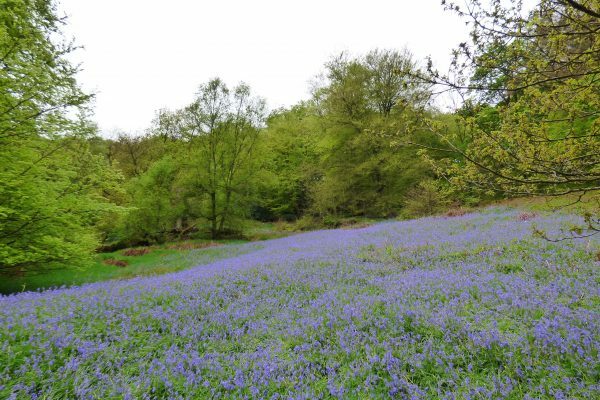 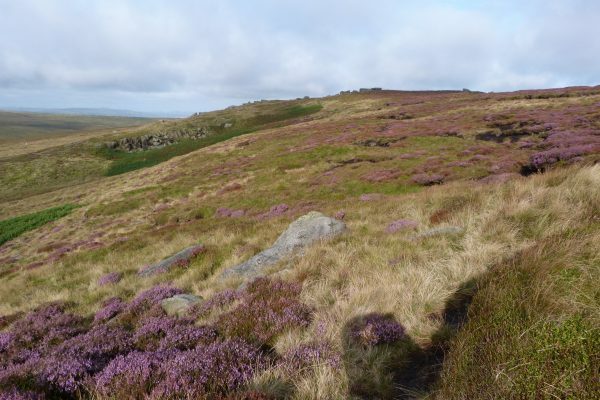 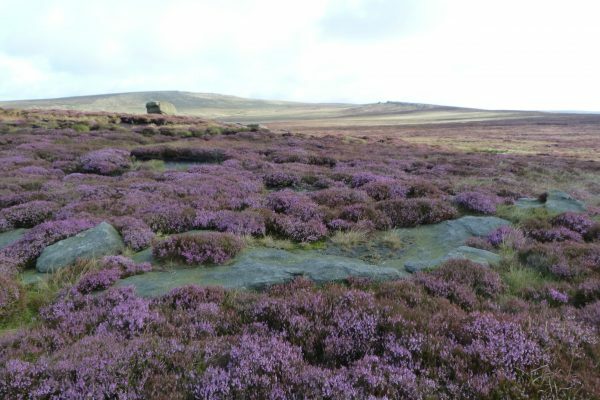 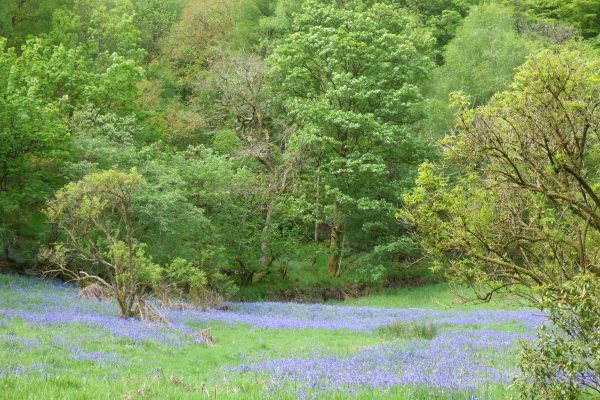 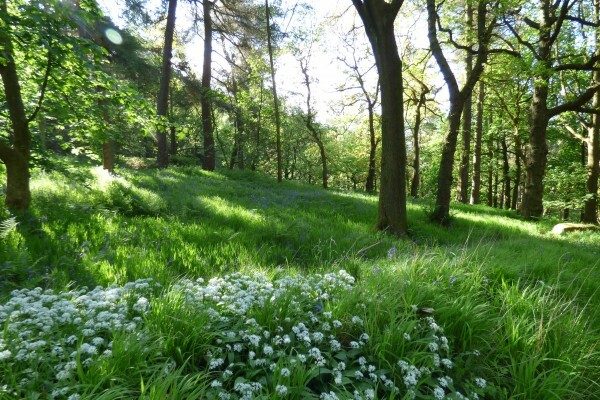 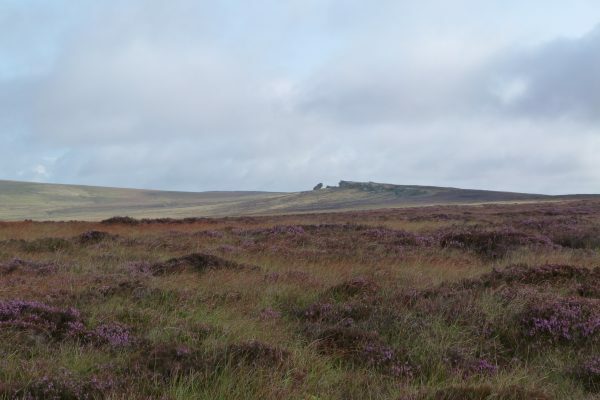 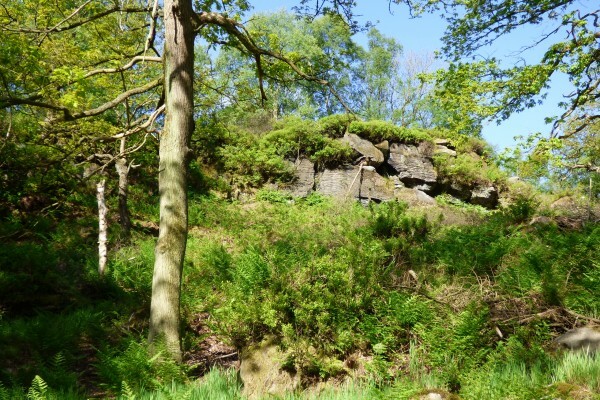 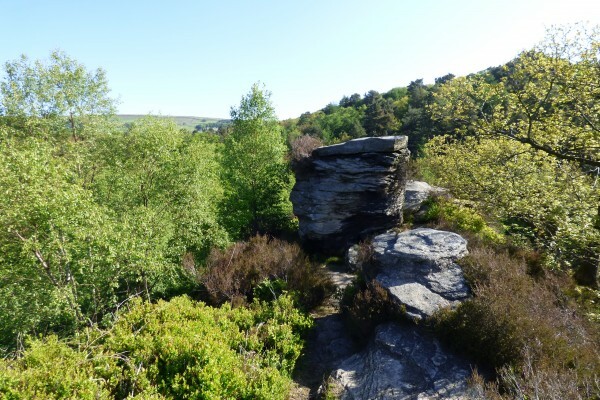 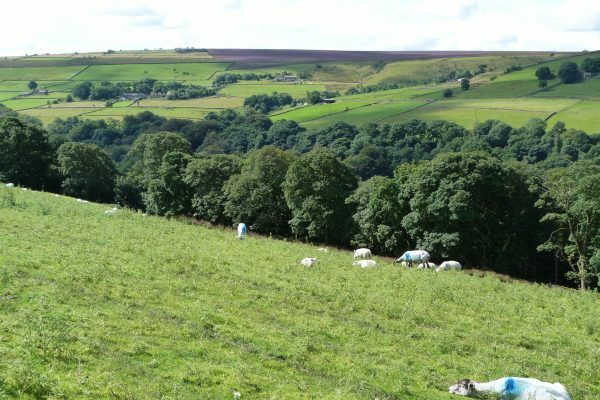 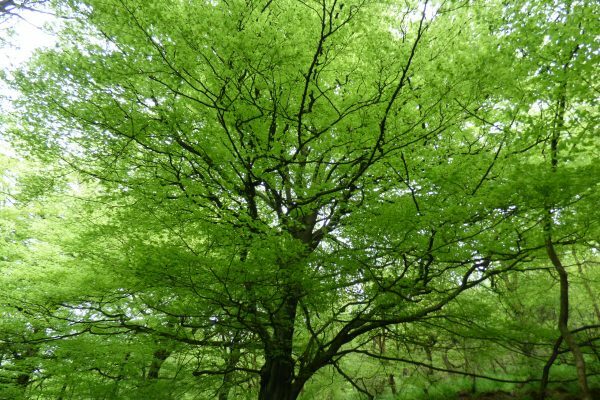 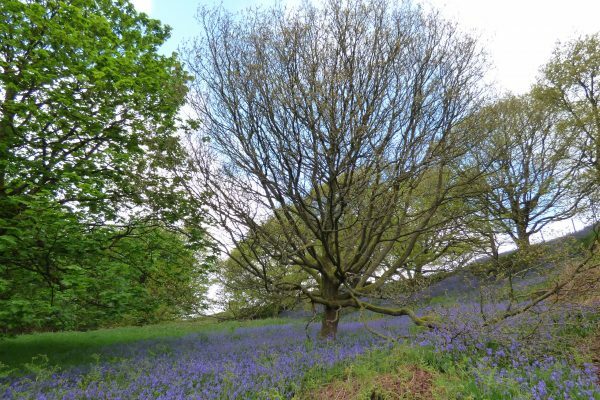 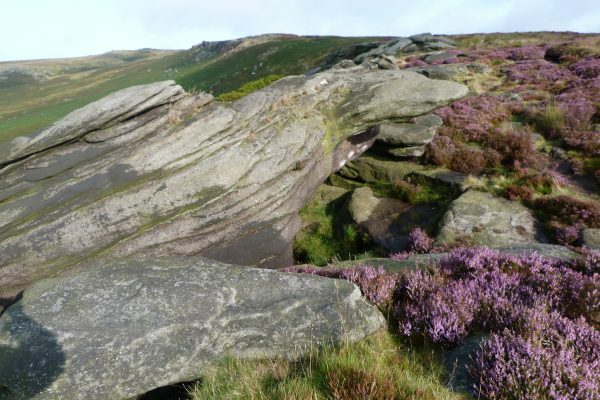 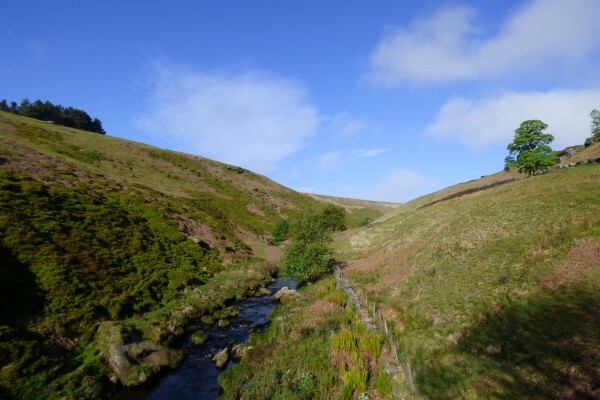 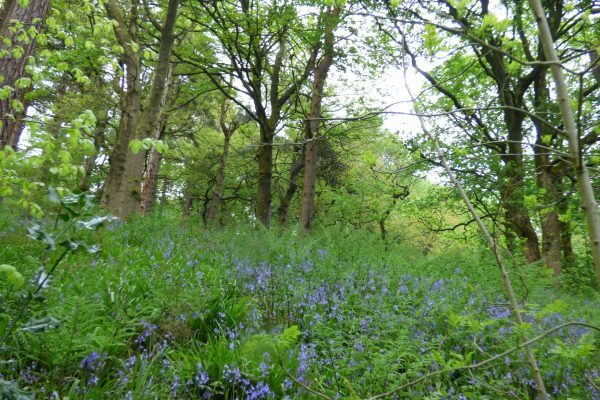 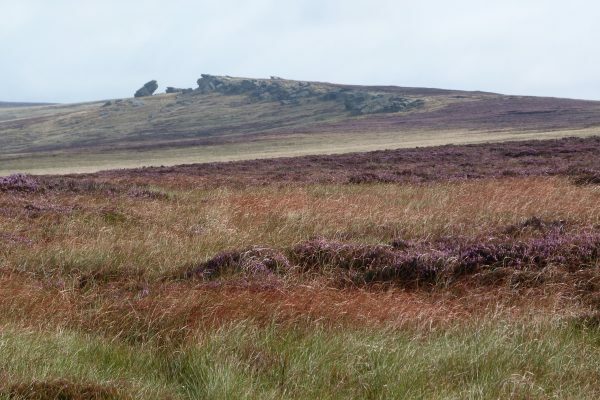 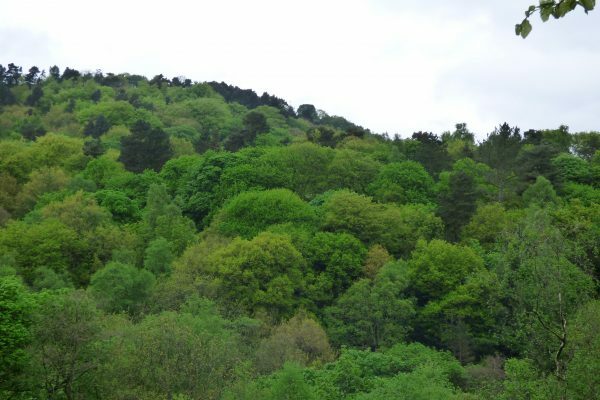 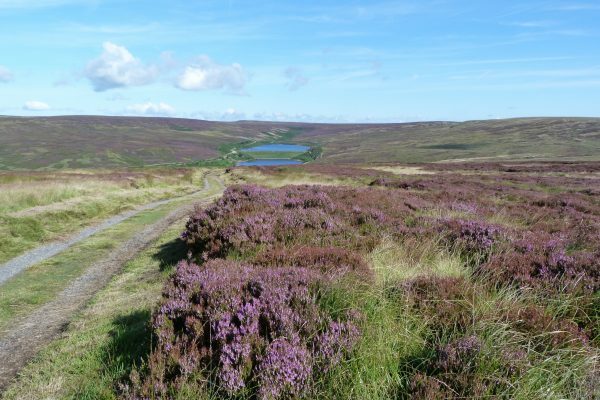 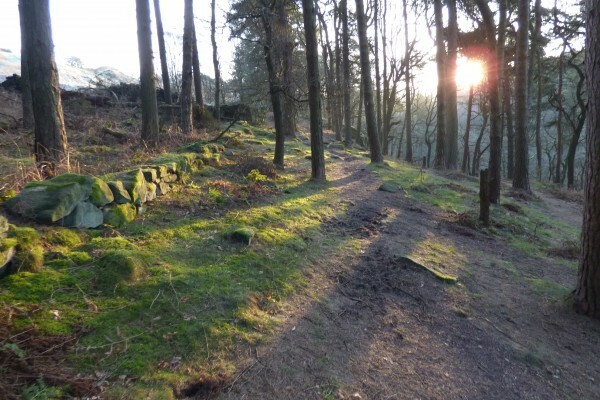 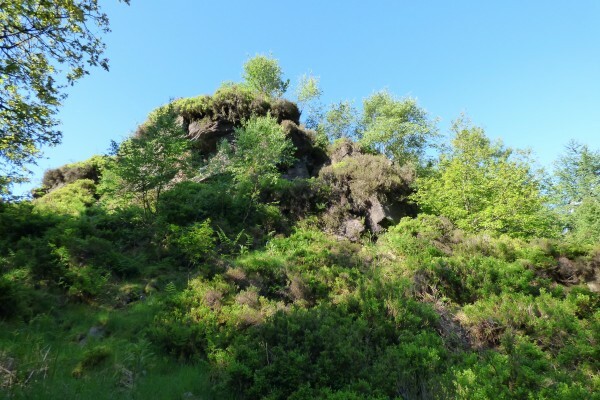 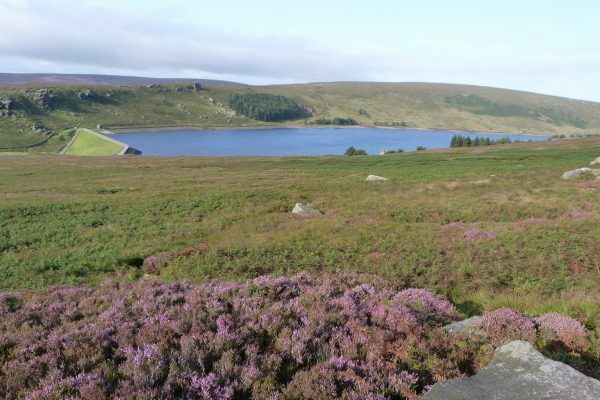 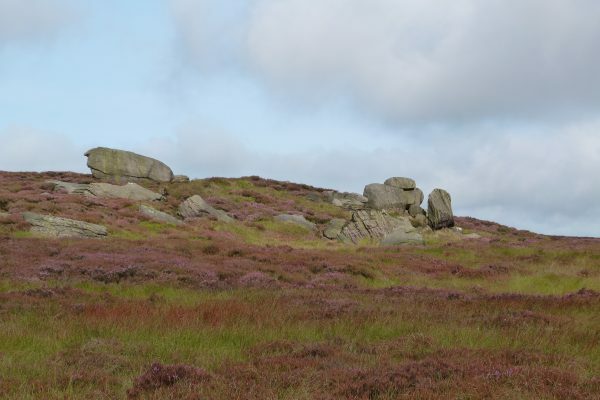 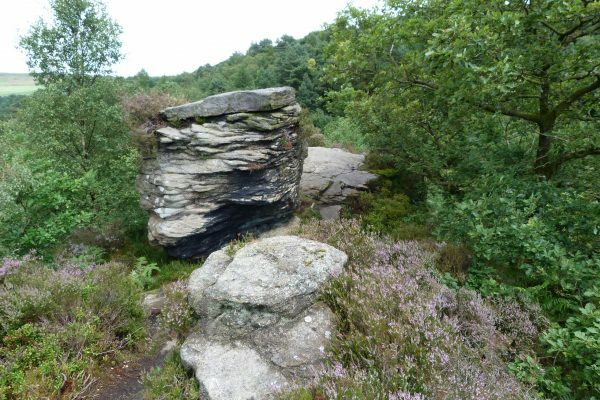 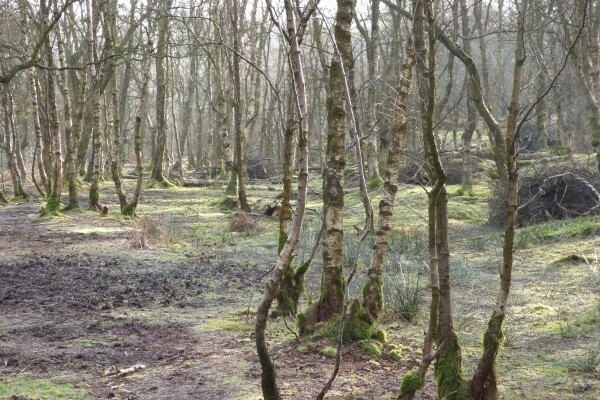 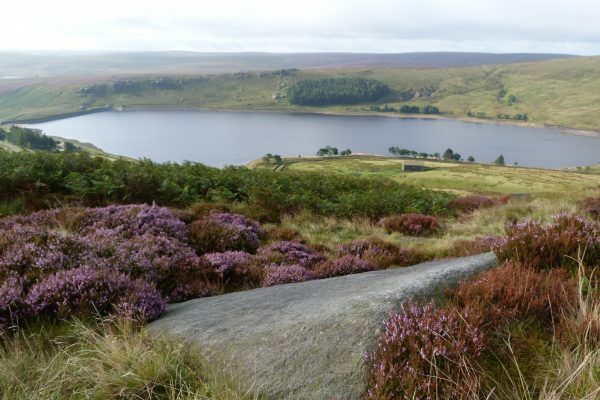 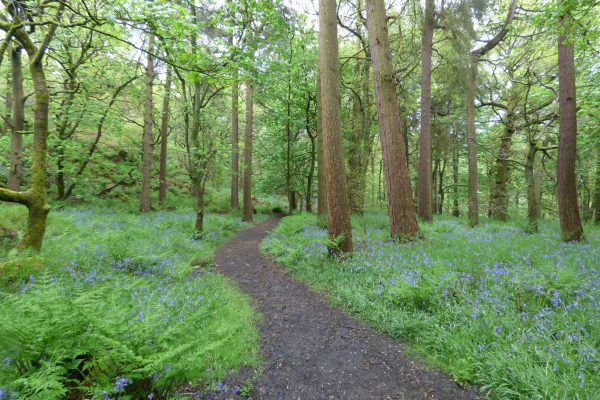 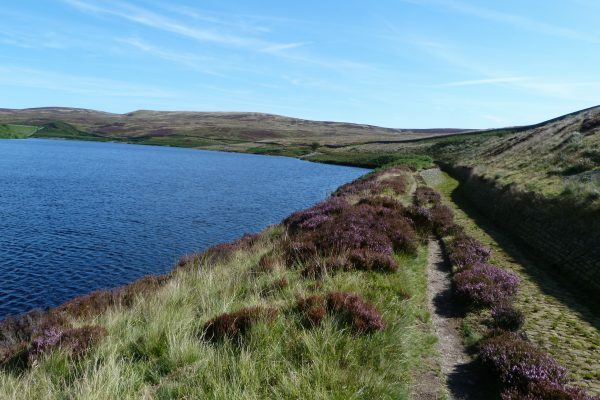 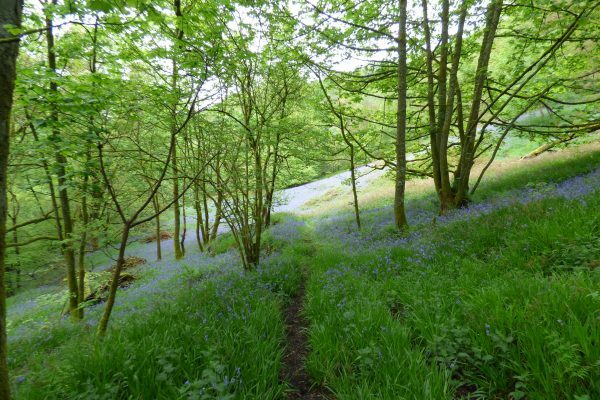 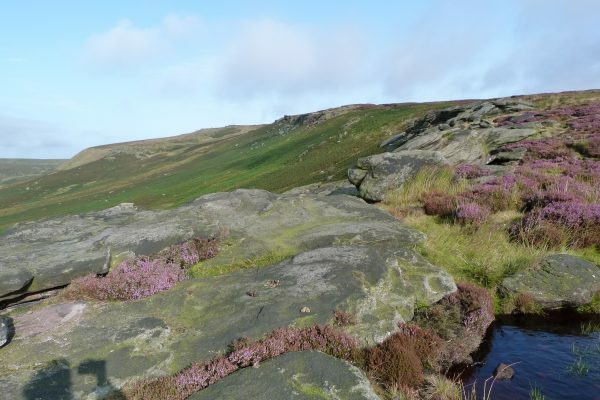 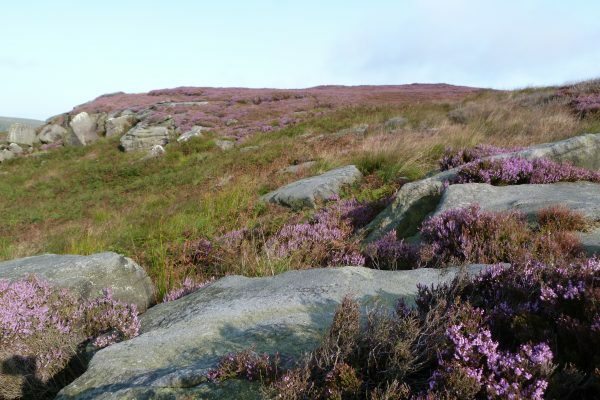 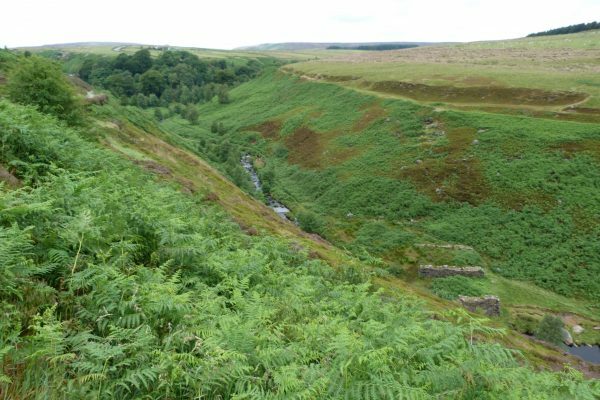 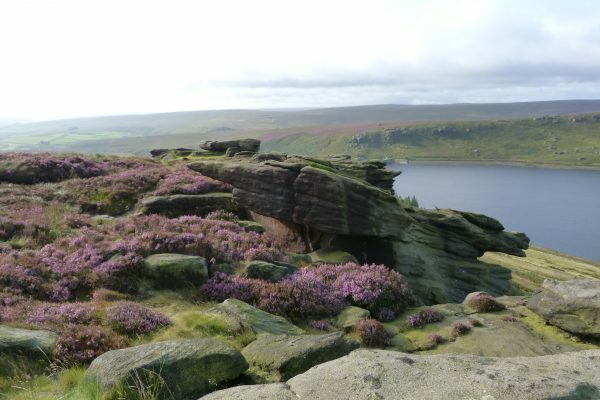 Only a mile from Elmet Farmhouse, Hardcastle Crags is reached on foot via an ancient stone-paved packhorse track through the National Trust woodland of Pecket Well Clough, . 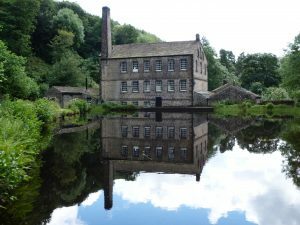 During the school holidays there are children’s activities and events. 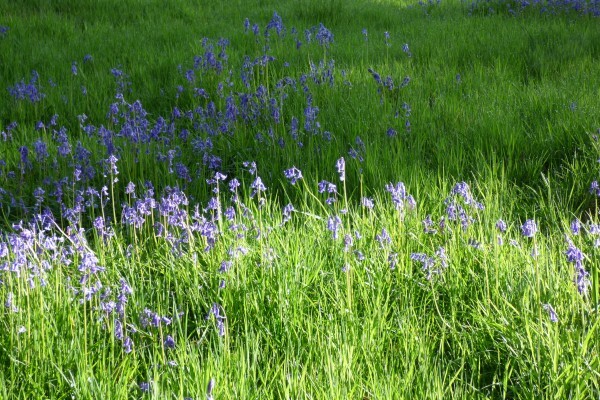 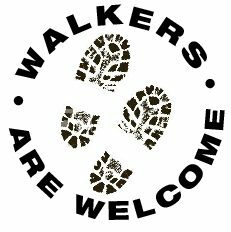 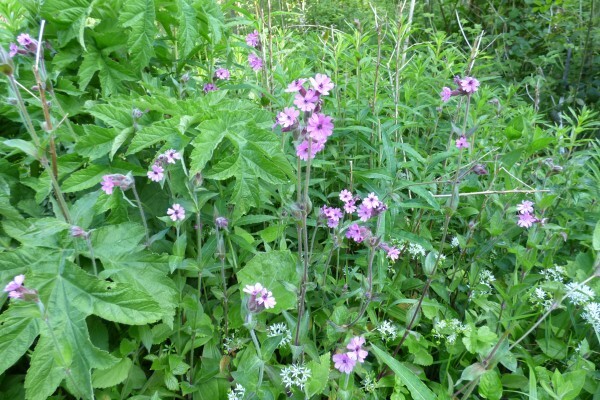 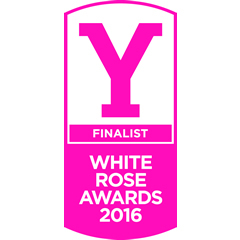 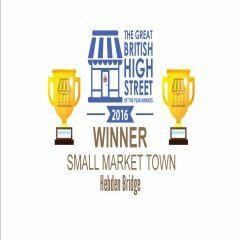 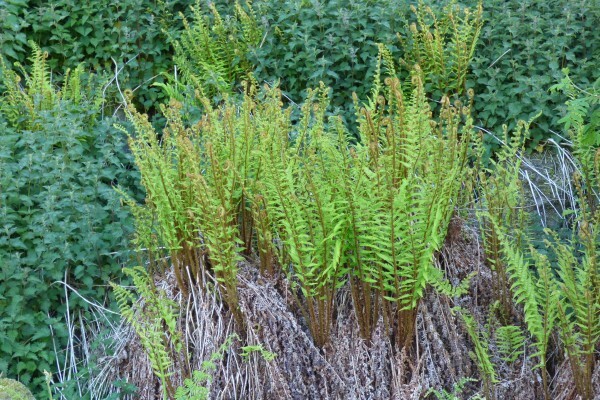 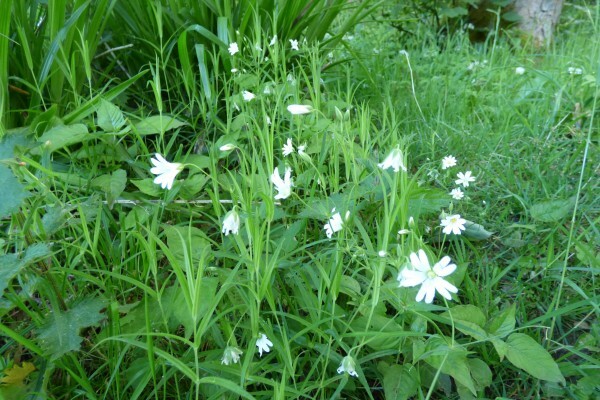 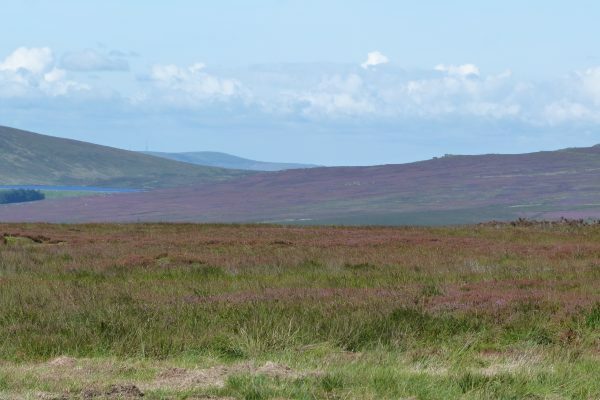 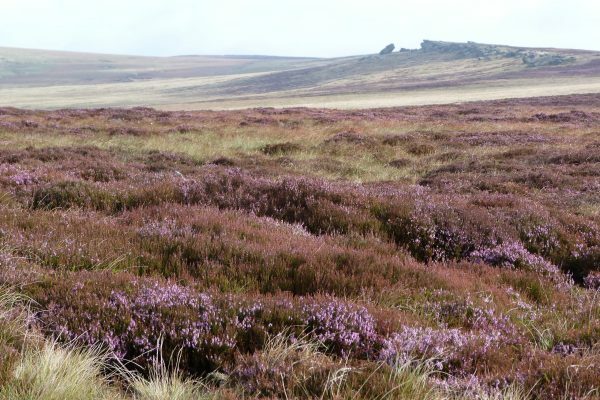 Find out more at the National Trust website. 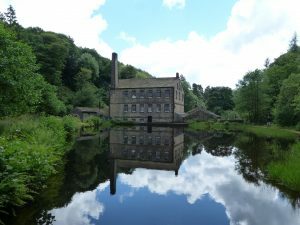 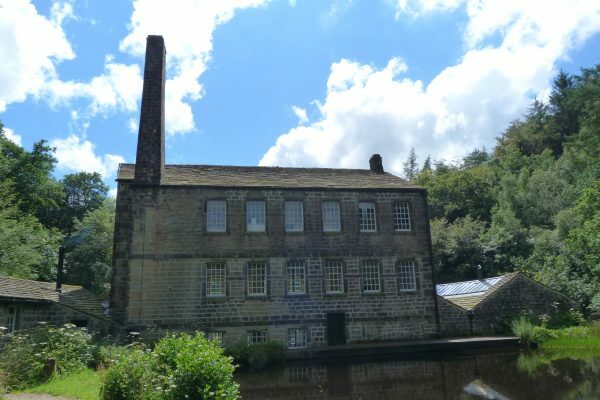 Set in the heart of Hardcastle Crags is Gibson Mill, a handsome early 19th century textile mill in an idyllic setting next to a millpond. 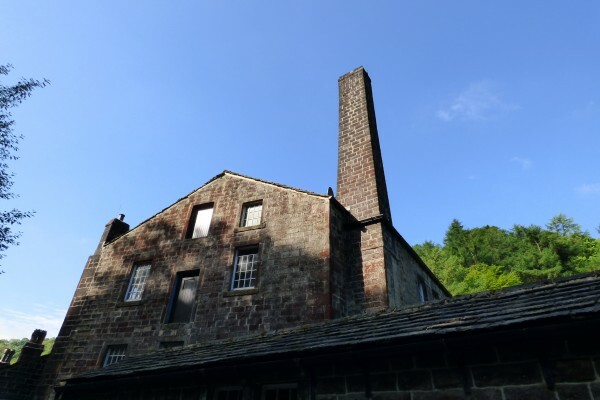 Built by Abraham Gibson of Greenwood Lee in 1805, it was originally a water-powered cotton spinning mill but a loom shop was added in 1840 and a steam engine was installed in 1852. 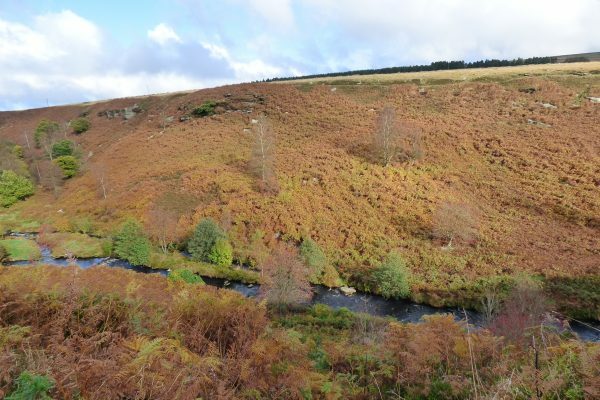 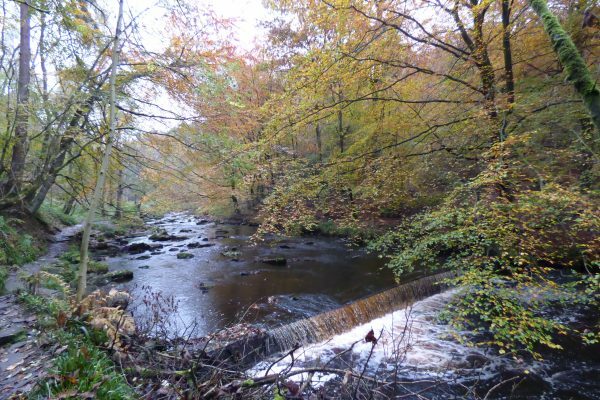 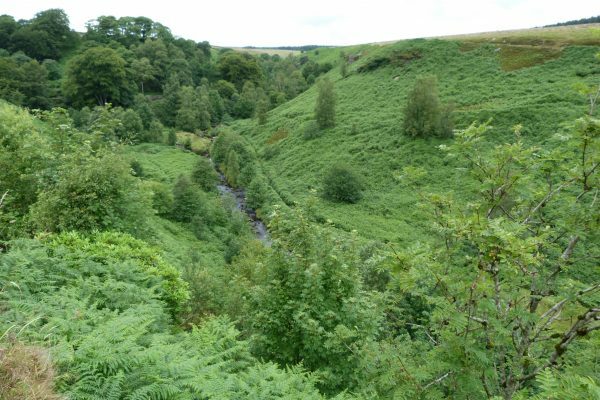 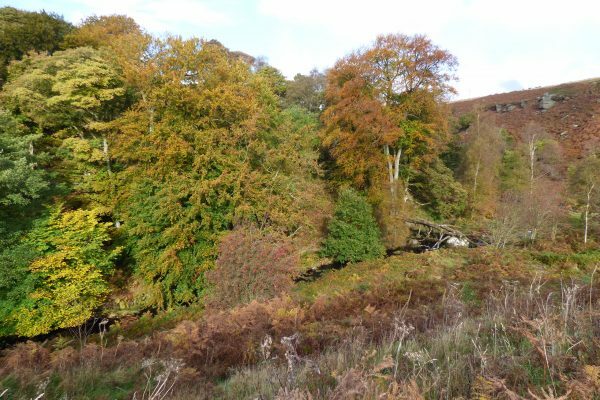 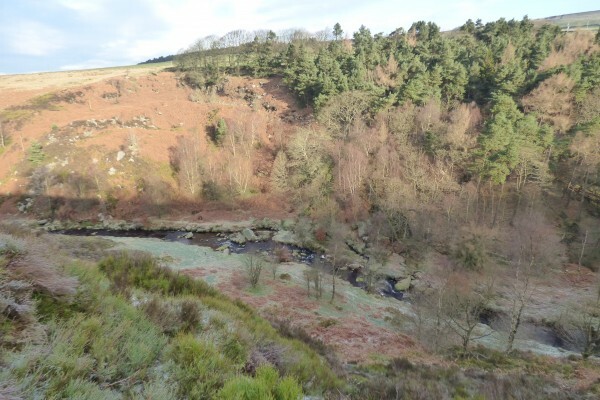 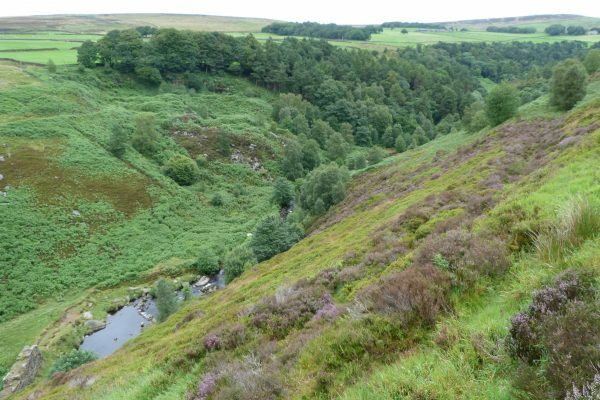 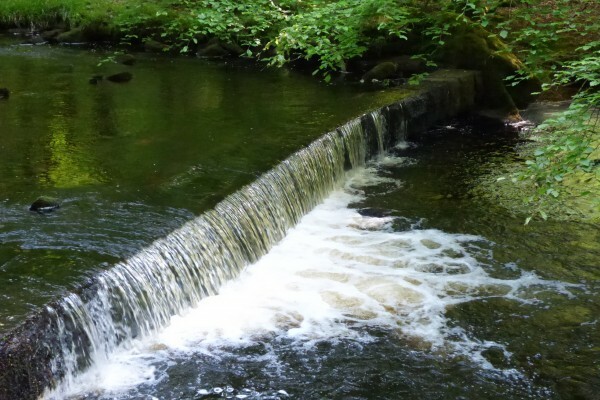 Remains of various dams, weirs and watercourses can be seen along the river throughout Hardcastle Crags. 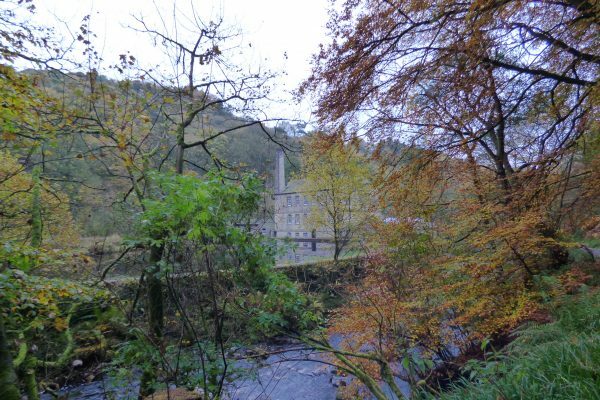 One of the first cotton mills in the Upper Calder Valley, Gibson Mill produced fustian cloth (the generic name for corduroy and moleskin) until its closure in the late 1880s. 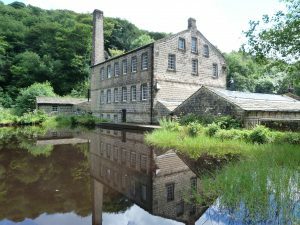 After this it became an entertainment emporium, housing a dance hall, a restaurant and a roller skating ring, with boating on the millpond. 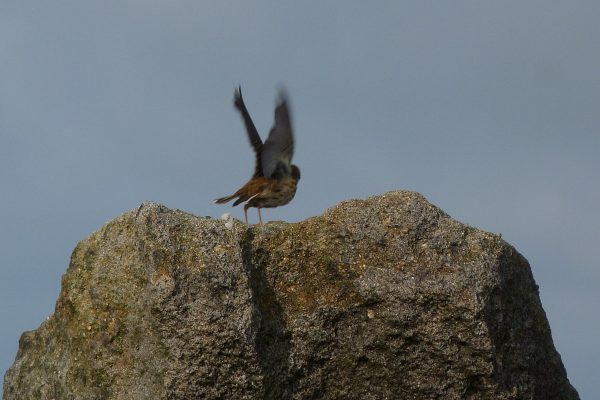 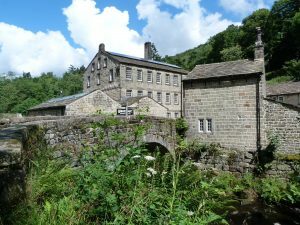 Eventually it was transferred to the National Trust along with the rest of the Hardcastle Crags estate. 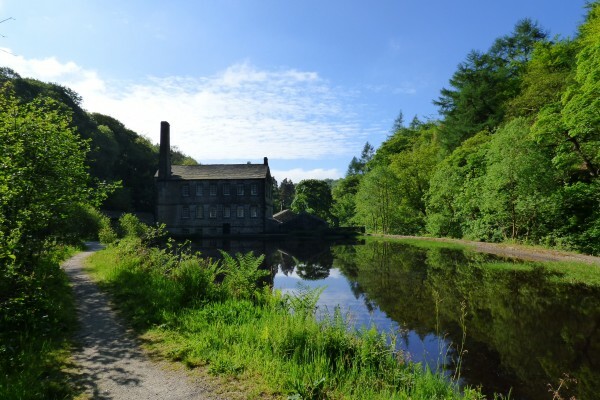 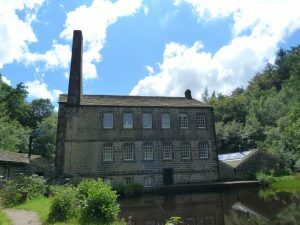 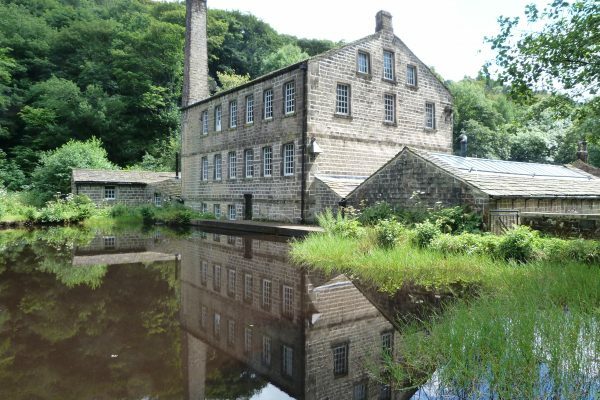 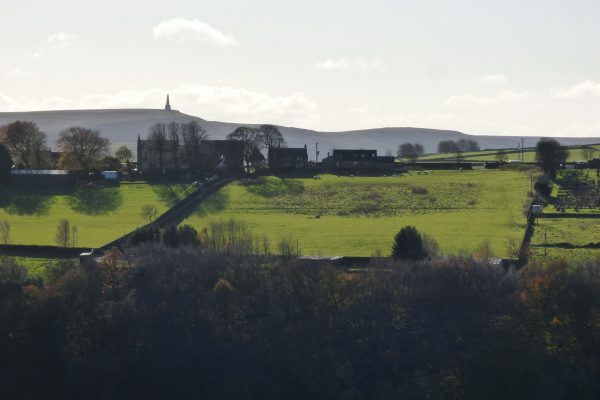 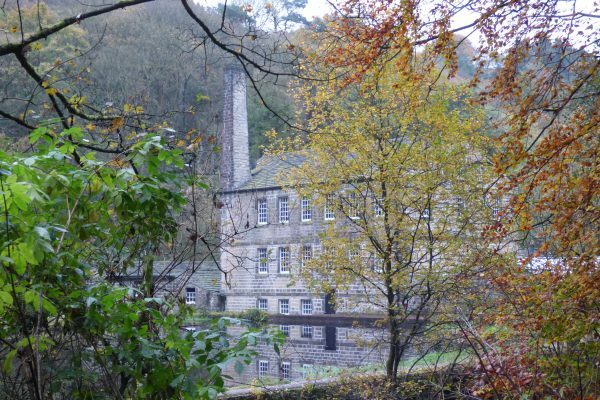 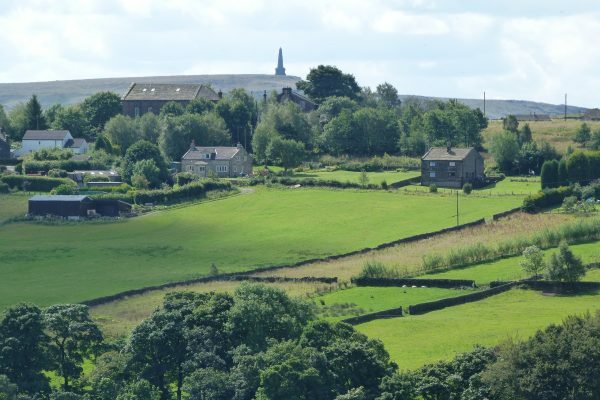 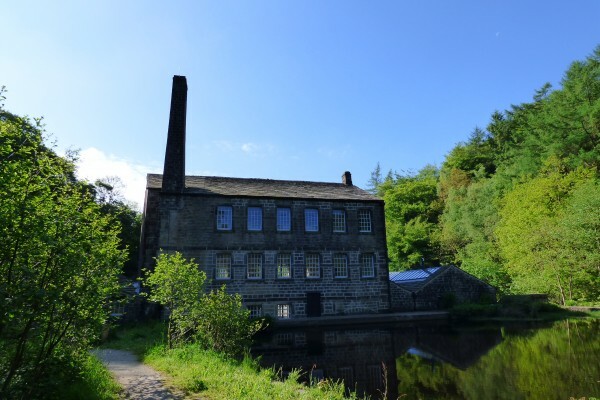 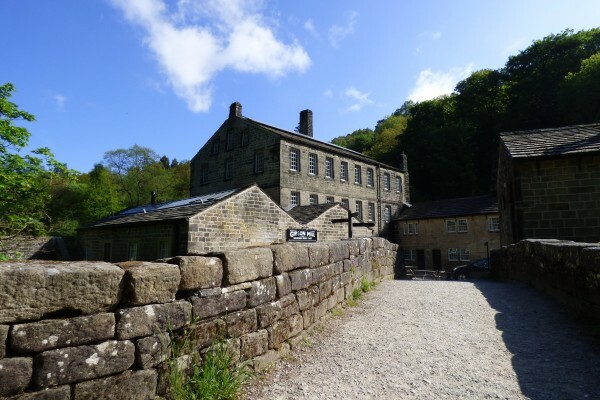 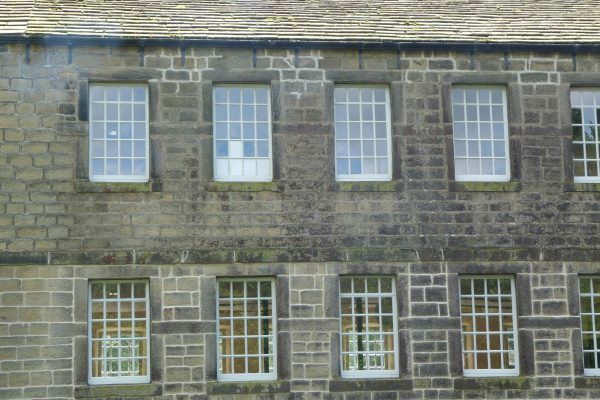 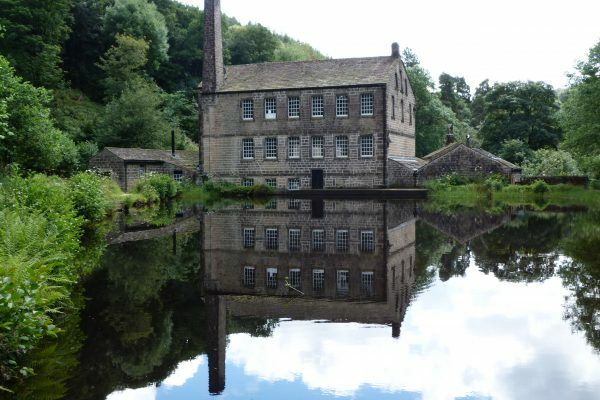 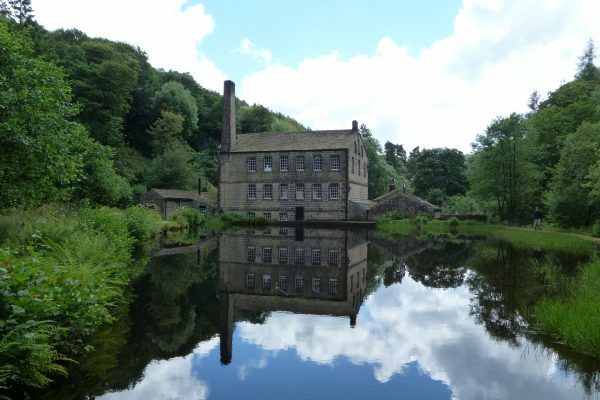 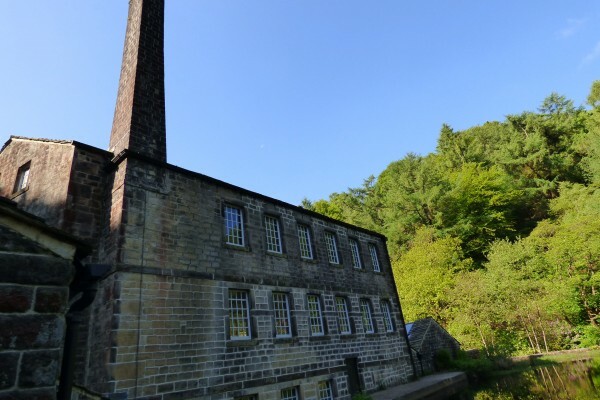 Although the area was once dominated by the textile industry, Gibson Mill is one of the few early mills to survive, along with Bridge Mill and Nutclough Mill in Hebden Bridge. 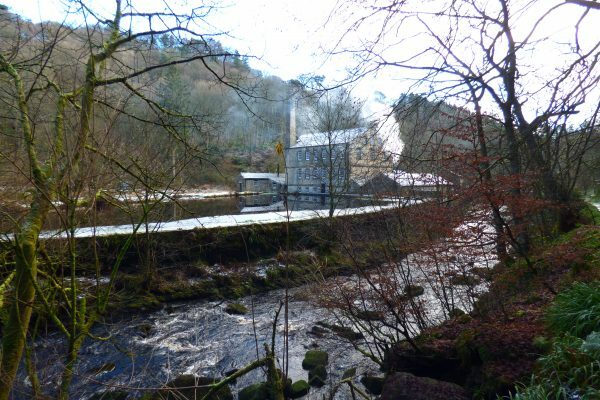 Restored during the 1990s, it is now a model of green energy powered by its own water turbine and solar panels. 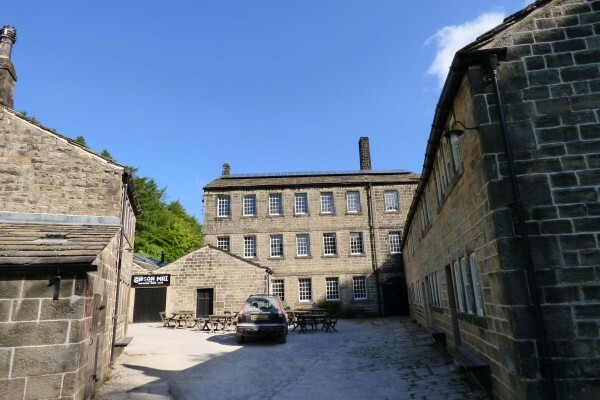 Inside is an attractive cafe heated by a large tiled wood-burning stove.